A banana is 75% water. 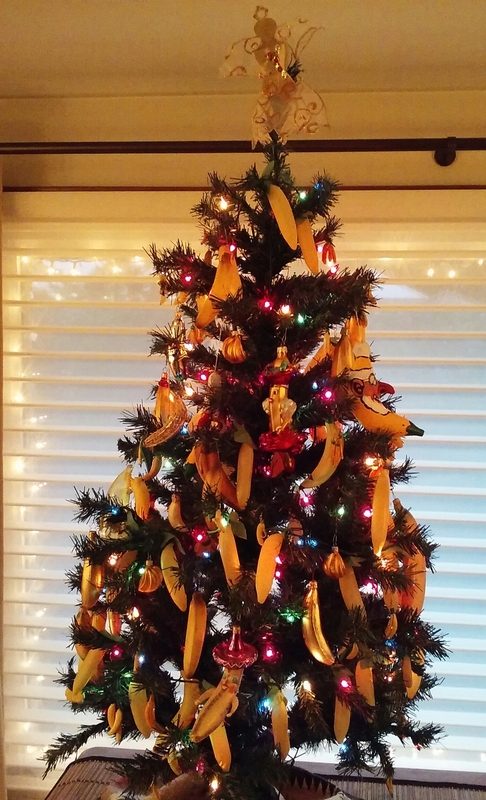 There is a widely-held superstition that says bananas are bad luck on a fishing boat. 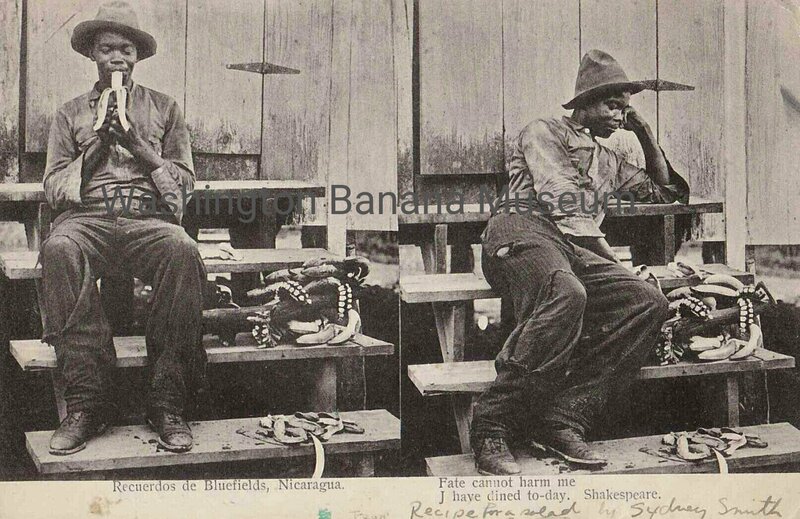 There are a lot of theories as to why; a popular one is that back in the 1700s fishing boats would pick up load of bananas from tropical islands. 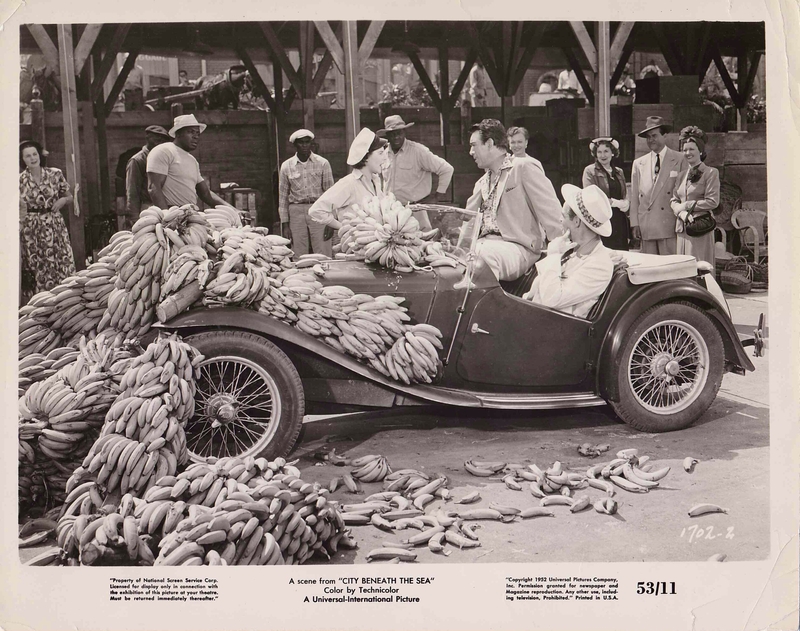 Nestled among those bananas were various spiders, bugs, and snakes that would later wreak havoc among the crew. 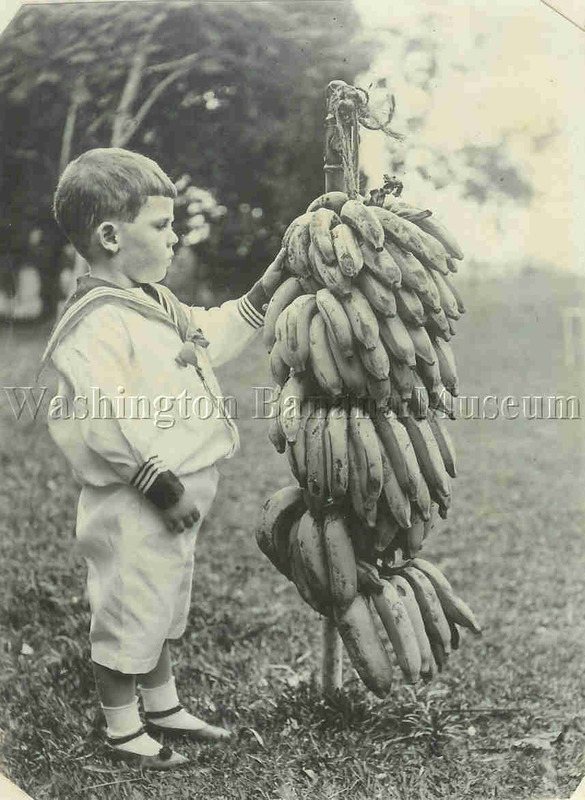 Visit Washington Banana Museum's profile on Pinterest. 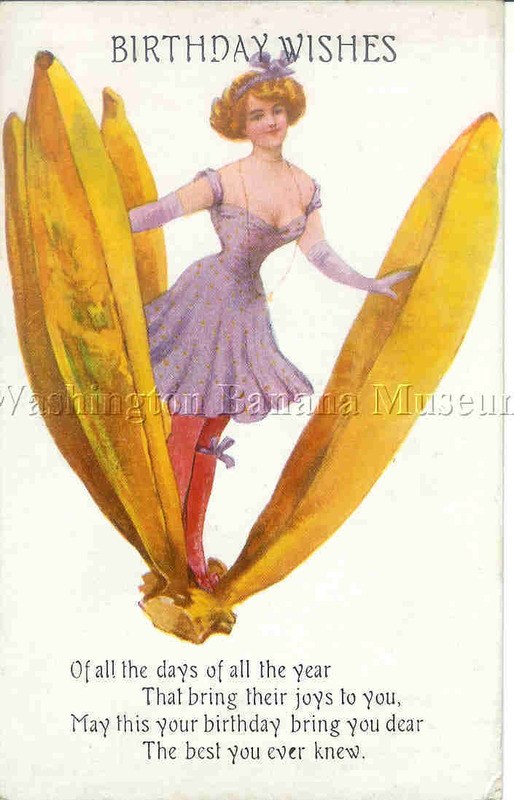 The Washington Banana Museum curator is Ann Mitchell Lovell. 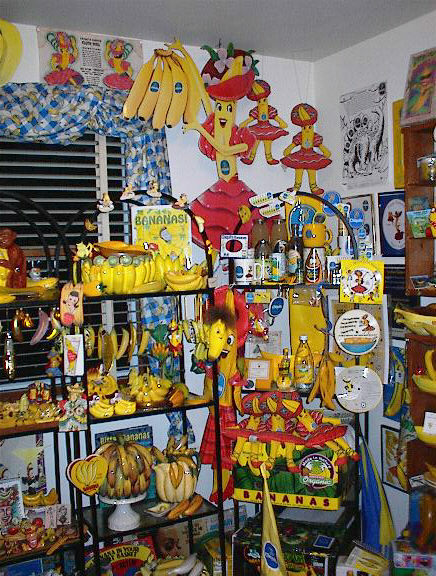 Ann has assembled close to 6,000 items, a melange of artifacts, folk art and other cultural oddities devoted to the world's perfect fruit. 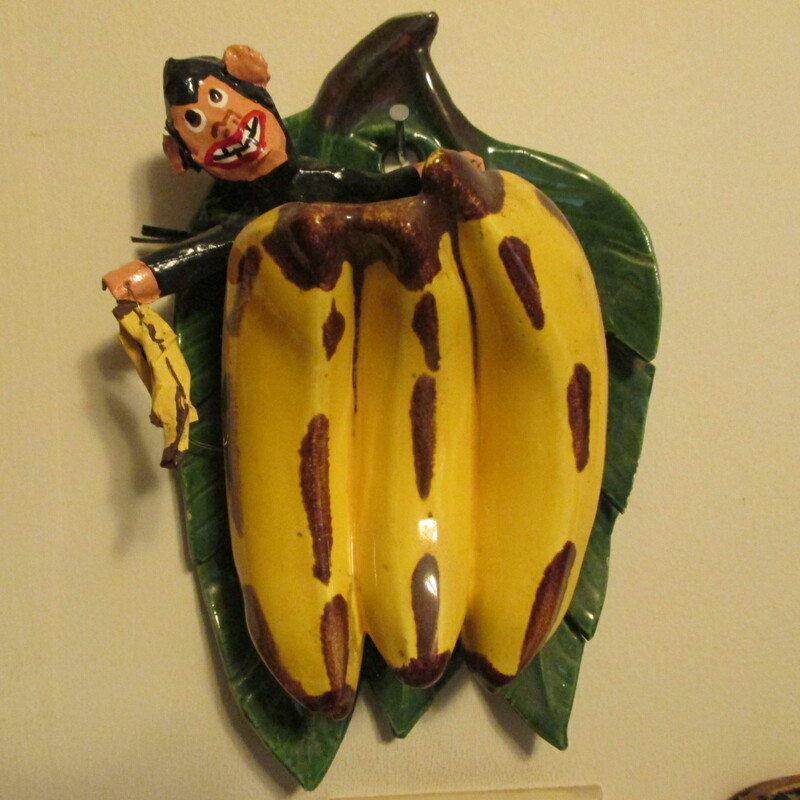 Assembled by a longtime scholar of banana consciousness, it features a compendium of whimsical and serious representations of the #1-selling fruit in the United States. Hi friends. Due to the massive fire next door on Dec. 26. 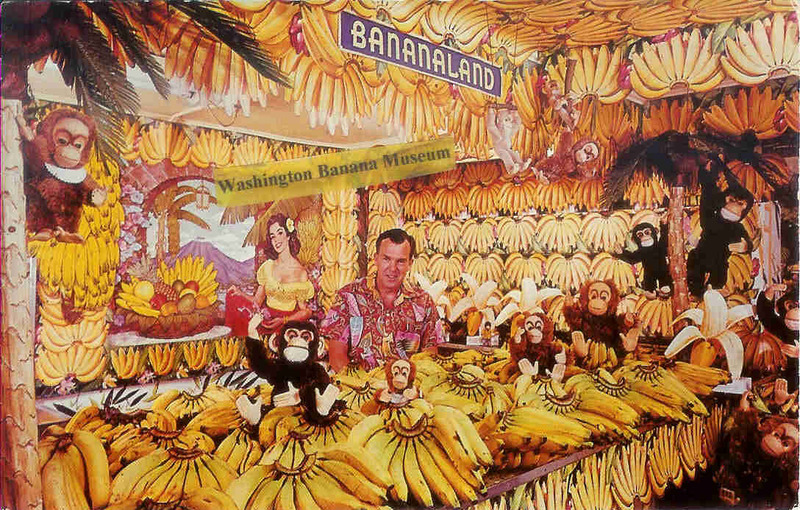 2017, and the resultant water and structure damage to our building, The Washington Banana Museum is now closed permanently. Thanks to all those who have voiced concerns and wished us well. We appreciate all your thoughts and goodwill. 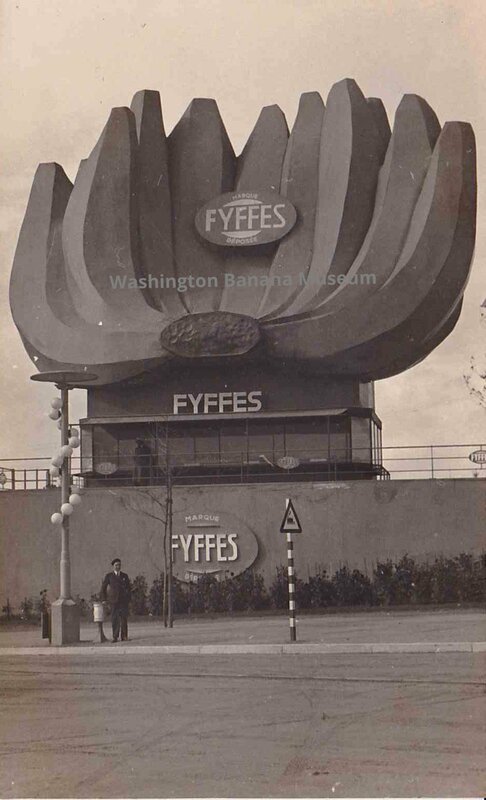 Fyffes banana building somewhere in the United Kingdom. 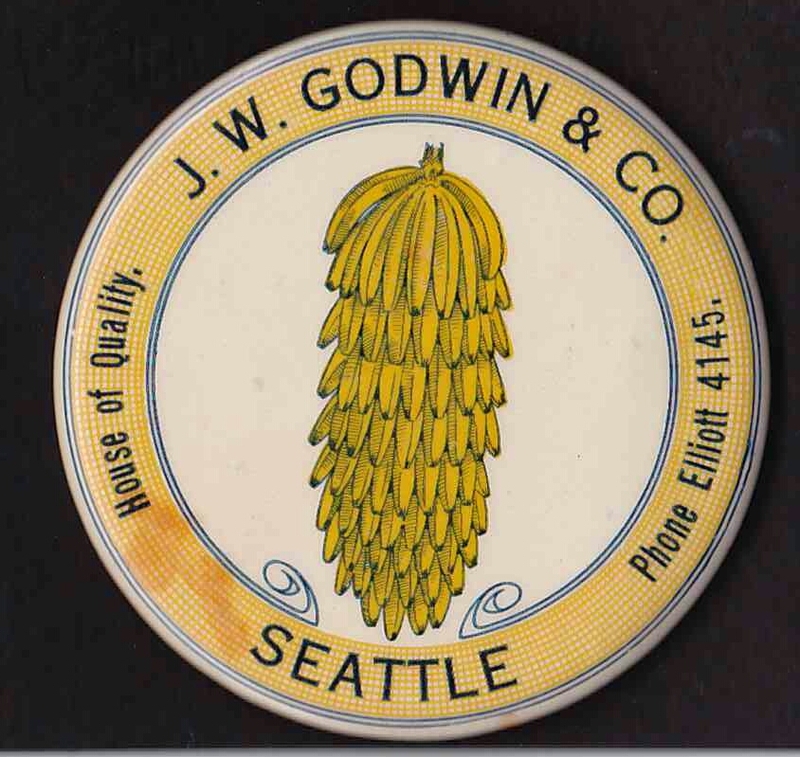 Early 1900s celluloid advertising piece from the J. W. Godwin Company in Seattle. Godwin was born in 1860 in Virginia. 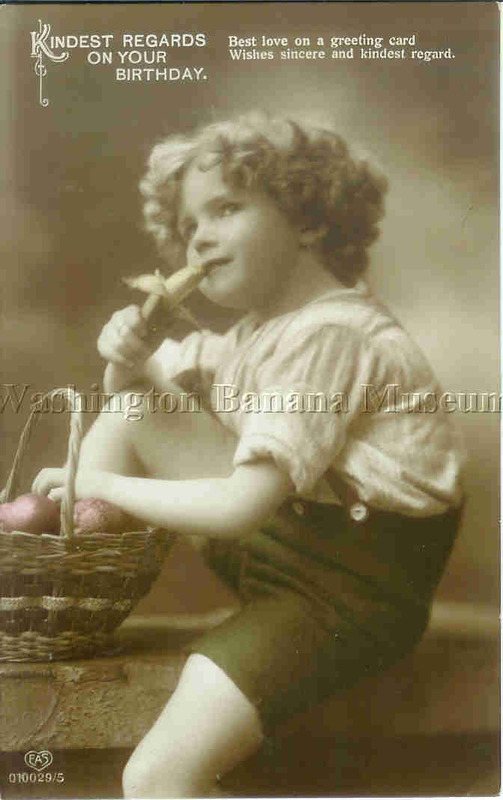 He came to Seattle in 1890 and established his wholesale fruit & vegetable business. He sold the company in 1914. 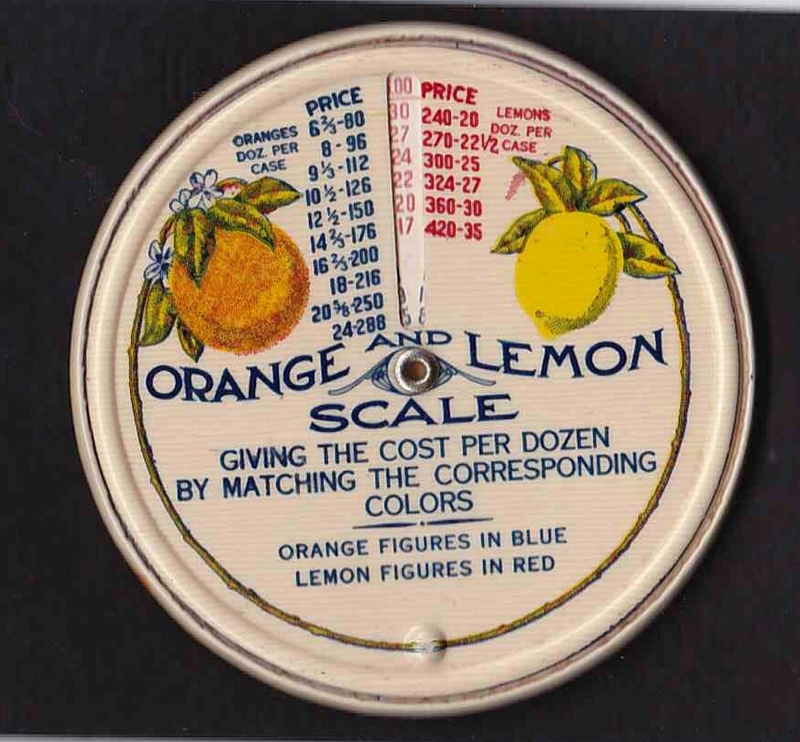 The back of the piece calculates the cost per dozen of oranges and lemons. 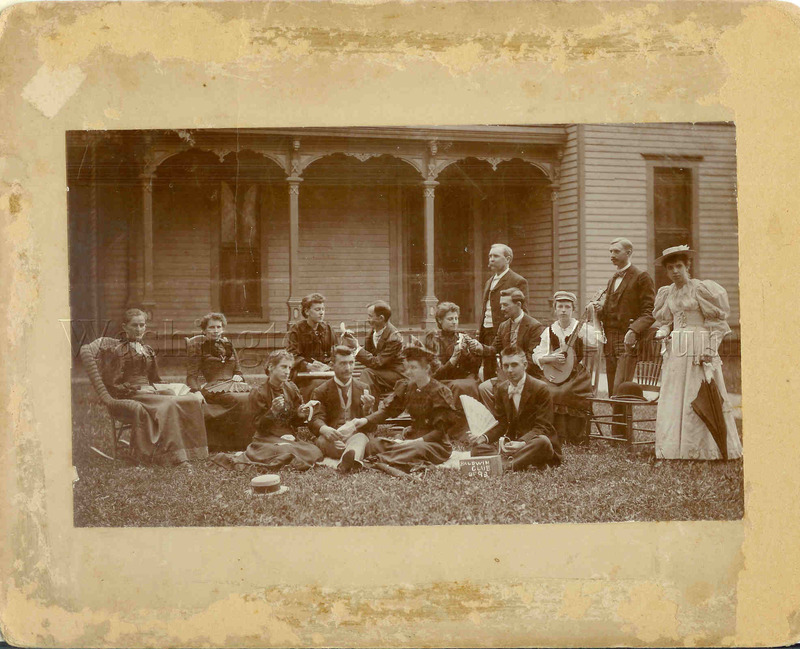 Students at McPherson College (in McPherson, Kansas) in 1900. 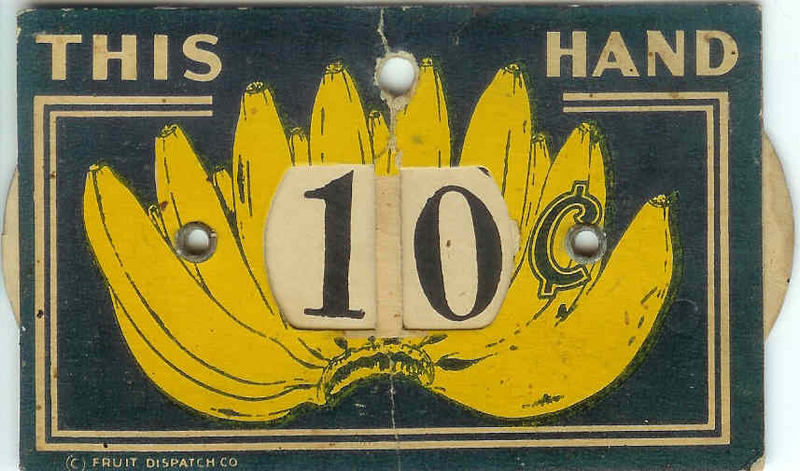 Bananas were cheap and plentiful at this time, easily affordable for these college students. 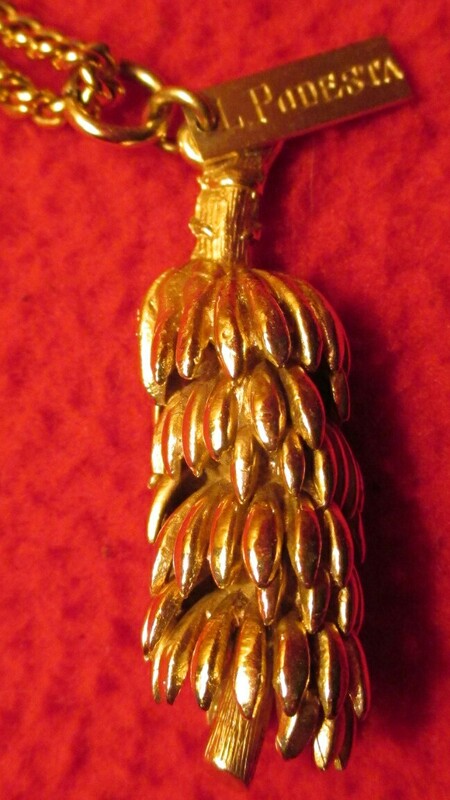 Japanese banana okimono ("object of display") carving. Most of these ivory carvings are from the Meiji period (1868-1912). Signed by the carver. Dimension: 4"x1". Incredible! 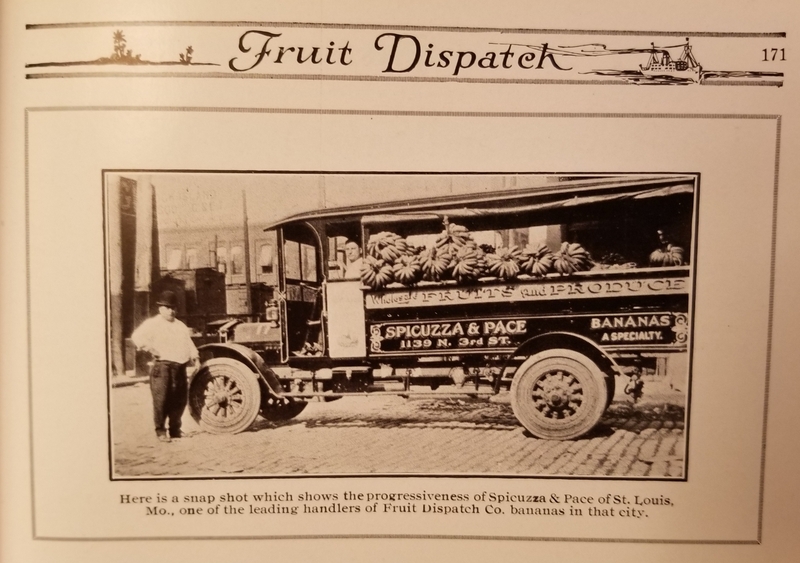 1917 photo of a Spicuzza & Pace banana delivery truck in St. Louis, Missouri. "Bananas a Specialty" so says the truck. 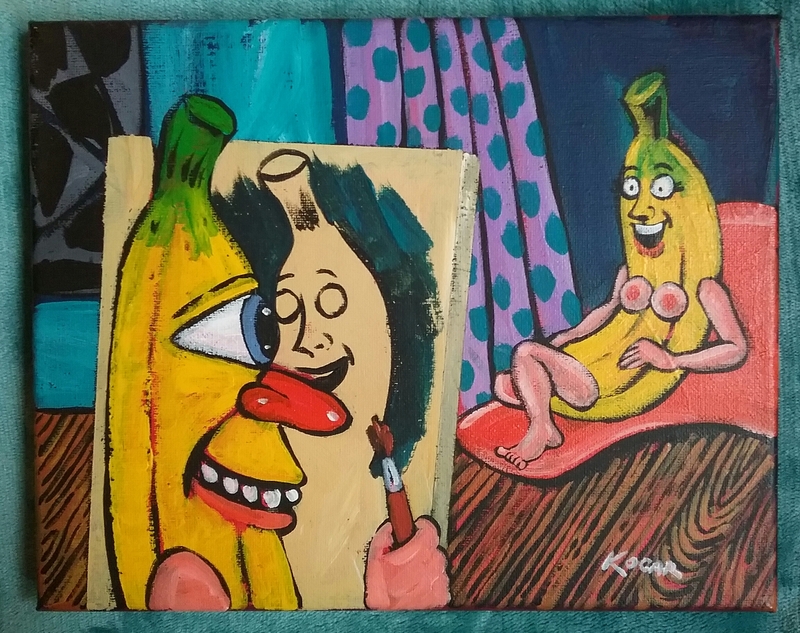 Original banana-featured paintings by Audrey Breed. One of a kind and awesome! See her blog at Audrey Breed Art and Design, her website, and on Facebook. 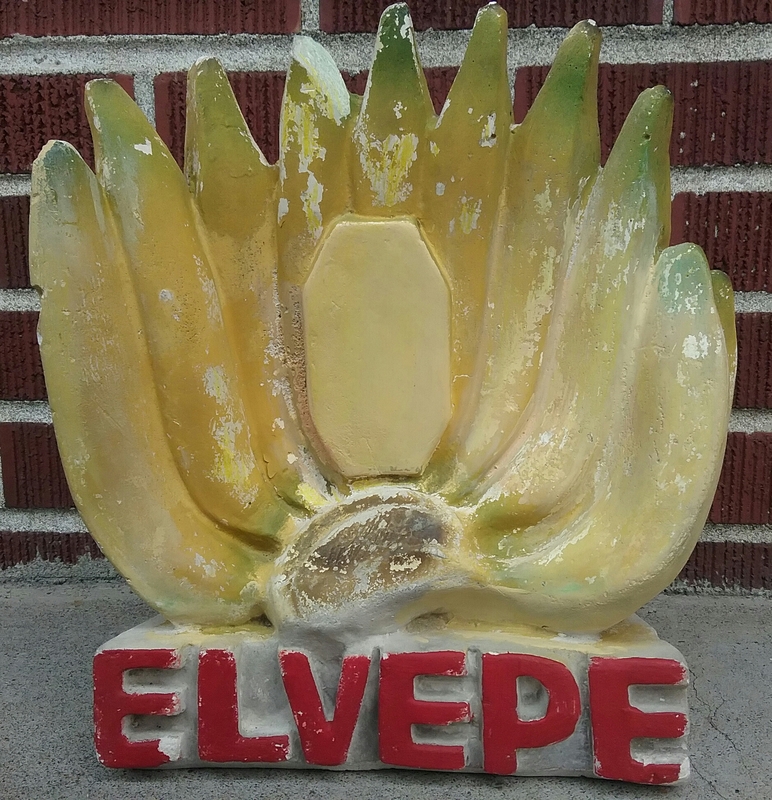 Elvepe plaster advertising piece. 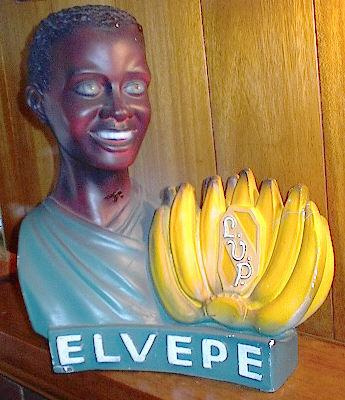 Elvepe was also known as L.V.P. [Leon Van Parys] for the original owner of Elvepe Company, a Belgian fruit importer. The company was founded in 1924. Partially restored. The original version had the initials L.V.P. in the middle vertical section. Movie still from 1952 Universal feature City Beneath the Sea starring Anthony Quinn and Robert Ryan. They're in Jamaica trying to find sunken treasure. 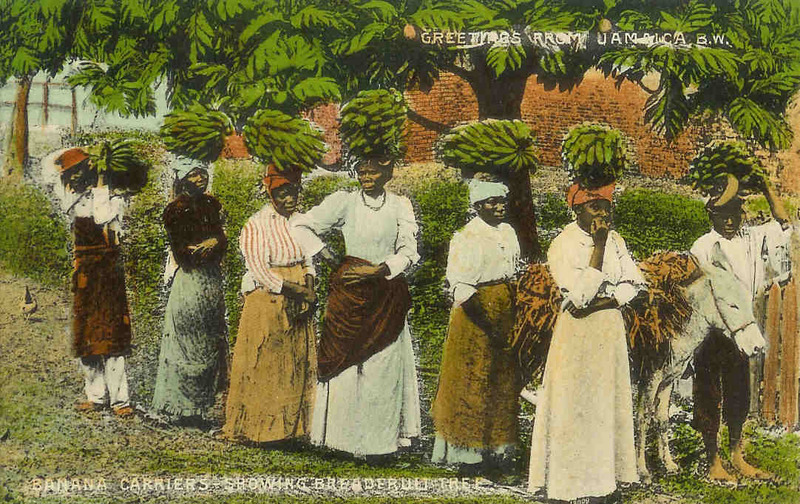 Jamaica grew lots of bananas. 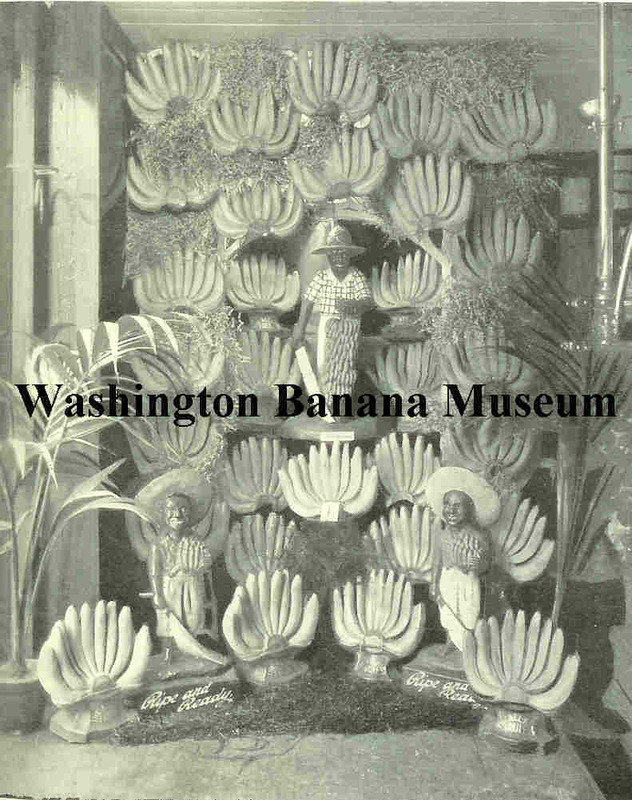 The Washington Banana Museum has been chosen as the world's best website on bananas by beesker.com. See their entry here. � We thank you! 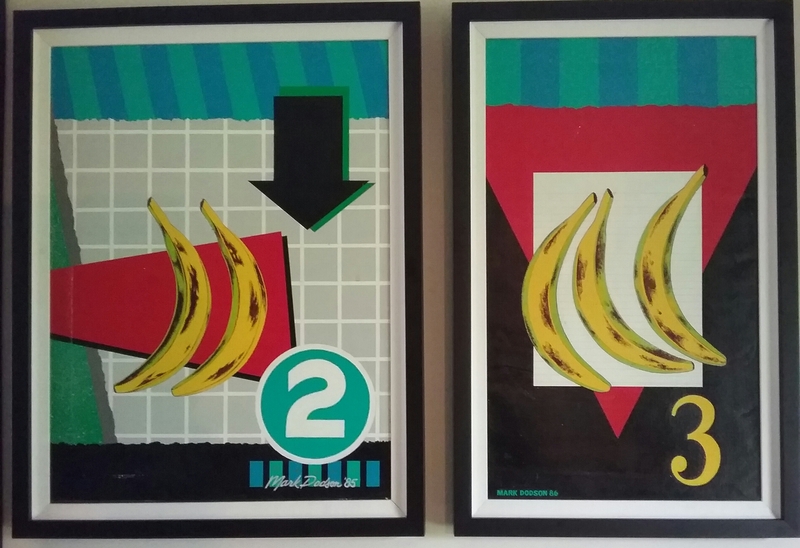 Banana pop-art paintings by Mark Dodson, 1985 and 1986. 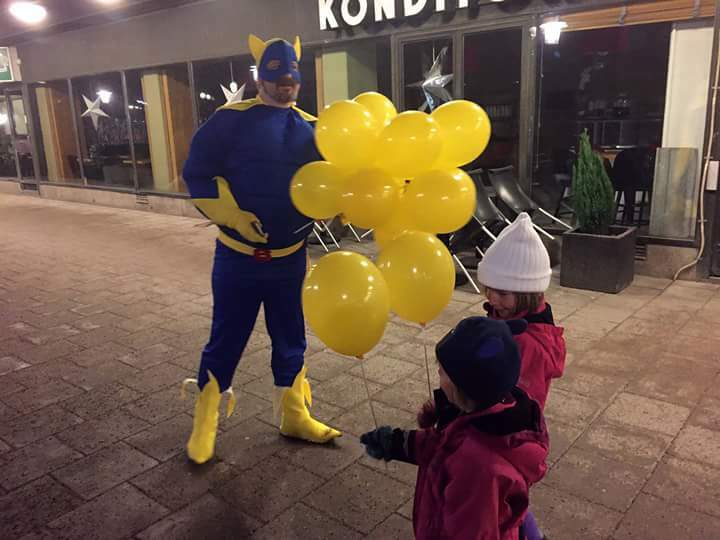 Please visit the Swedish Banana-Man at his non-profit Bananen (Bananhjalten) which helps animals in need, asylum-seekers and other worthy causes. 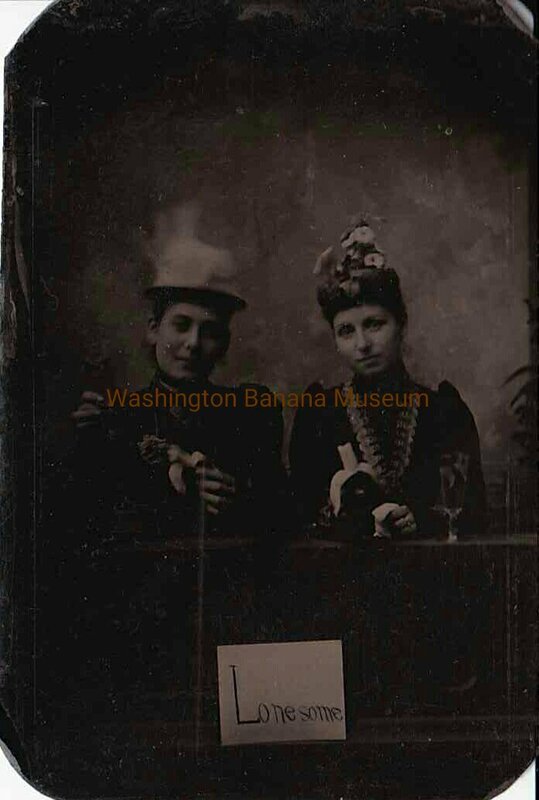 Tintype of two women with bananas, wine glasses and a "Lonesome" sign. Perhaps these are wives or sweethearts of Civil War soldiers. Envelope and letter written to Captain Lorenzo Dow Baker of The Boston Fruit Company, postmarked May 10, 1898, from one of his children. 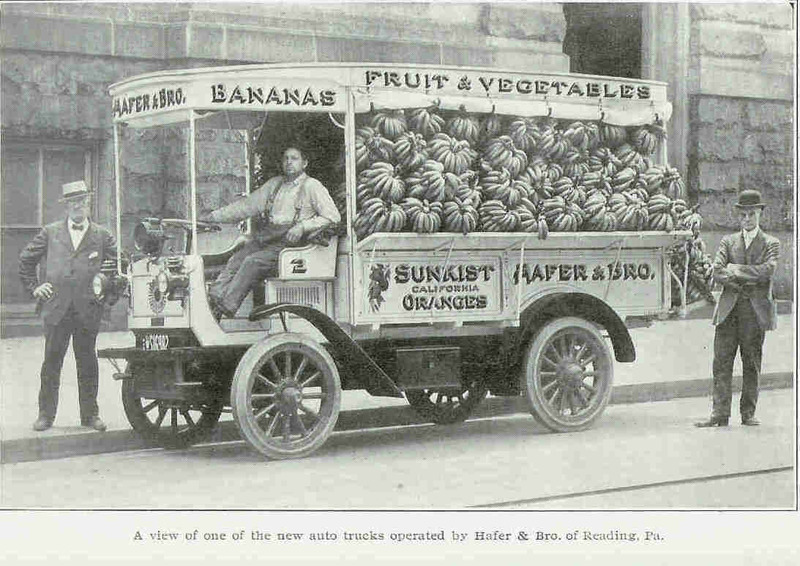 A year later Baker, along with Andrew Preston and Minor Keith, would combine with hundreds of other banana-importing companies to form The United Fruit Company. 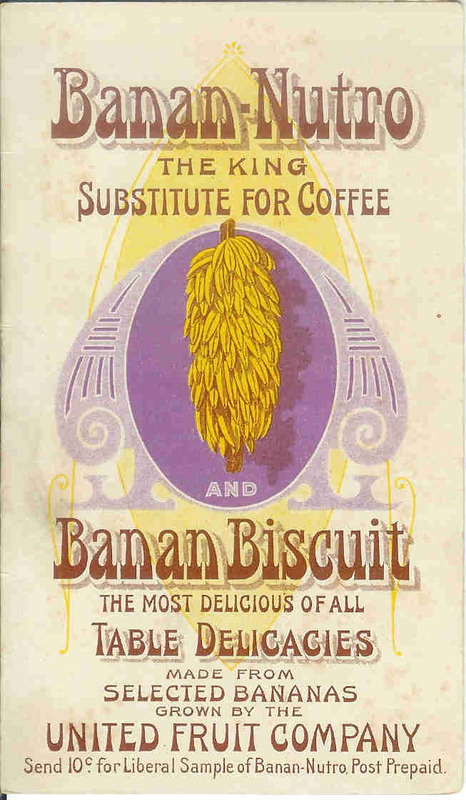 Carr's banana biscuit box, circa 1910. 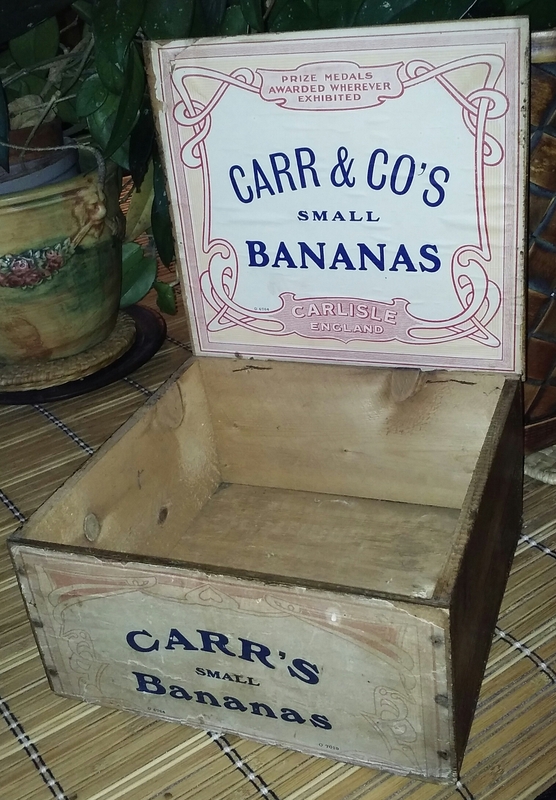 Carr's is still in business today, making quality crackers and biscuits, but not in wood boxes like this. 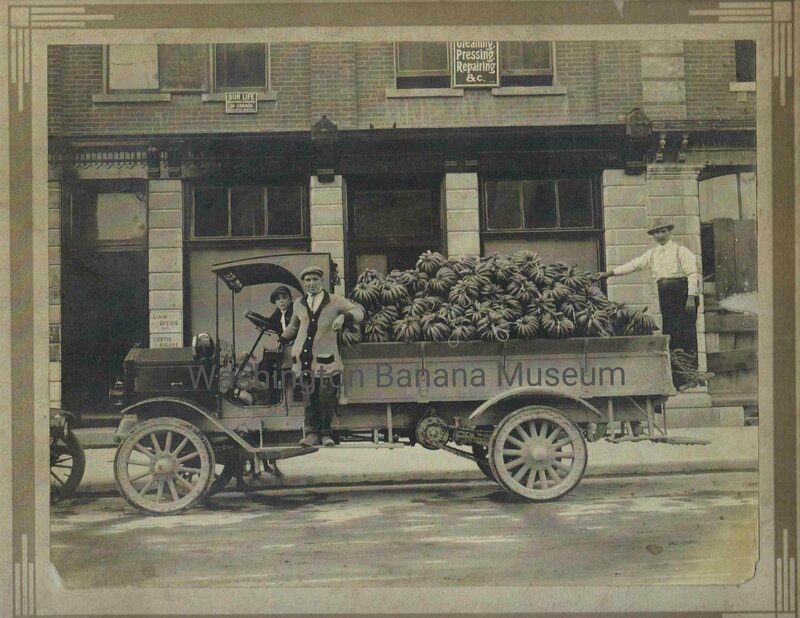 Early 1900s Canadian image of banana-laden truck. Photo courtesy of Gary Barratt. 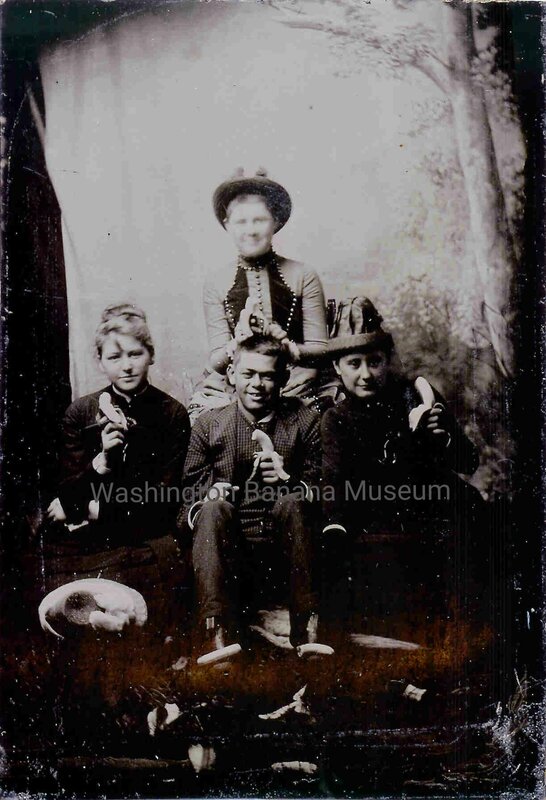 Tintype showing kids having fun in the studio while eating bananas. 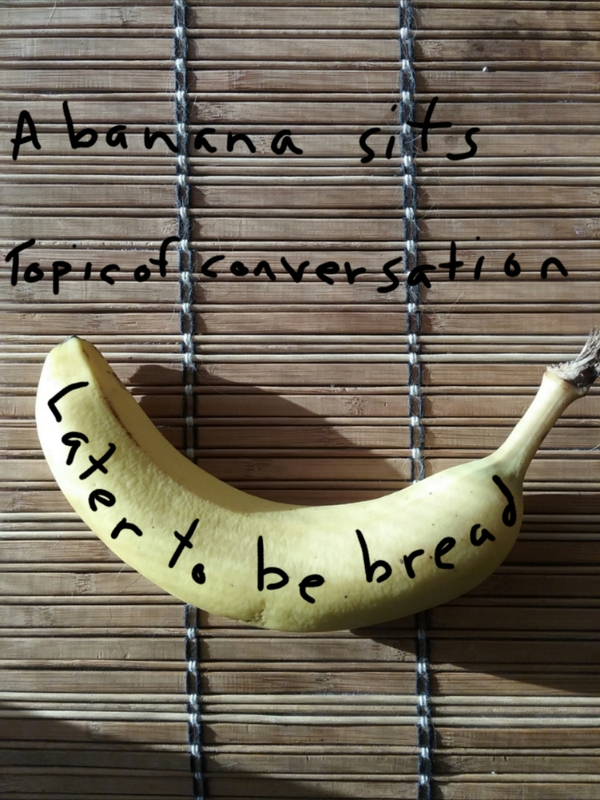 Banana haiku by RJ Jackson. An example of the same images used on two different postcards. "Cause and effect, No. 67" produced by G.W. Heron in Costa Rica. 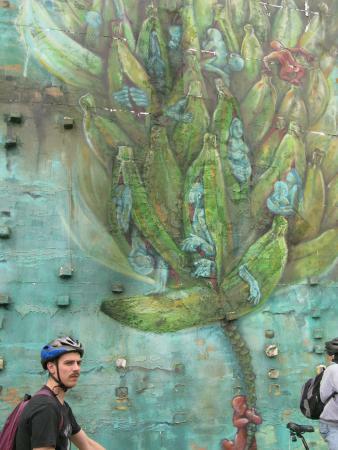 "Recuerdos de Bluefields, Nicaragua" copyright by Casa Alemana, Bluefields, Nicaragua. 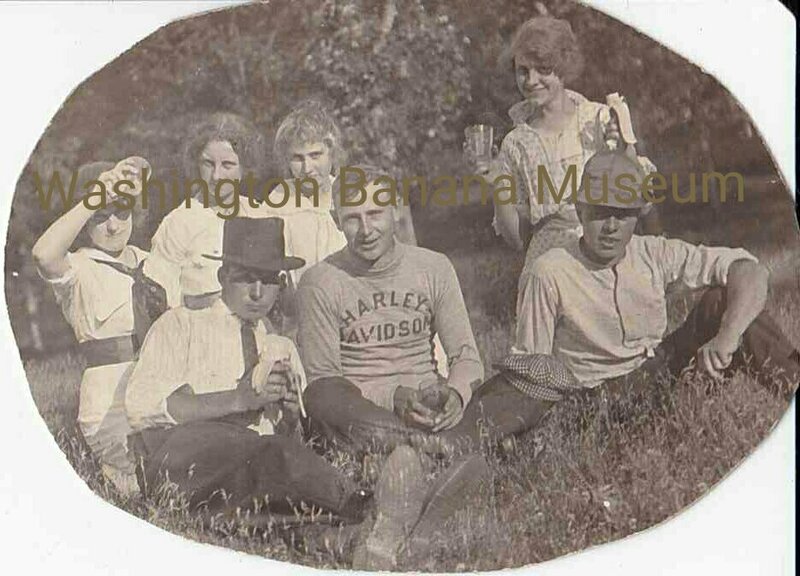 An early Harley-Davidson enthusiast and friends, some taking a banana break. Inspired by the 1923 novelty song "Yes! 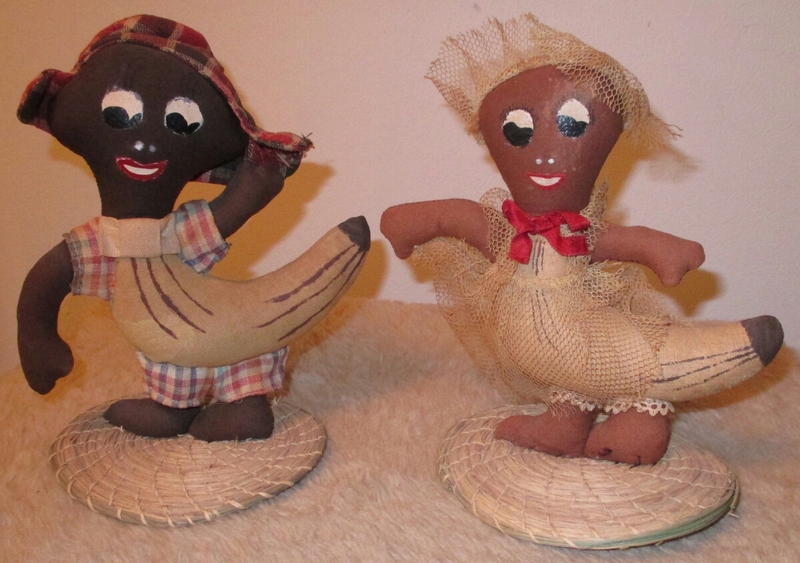 We Have No Bananas"
Antique handmade banana dolls. 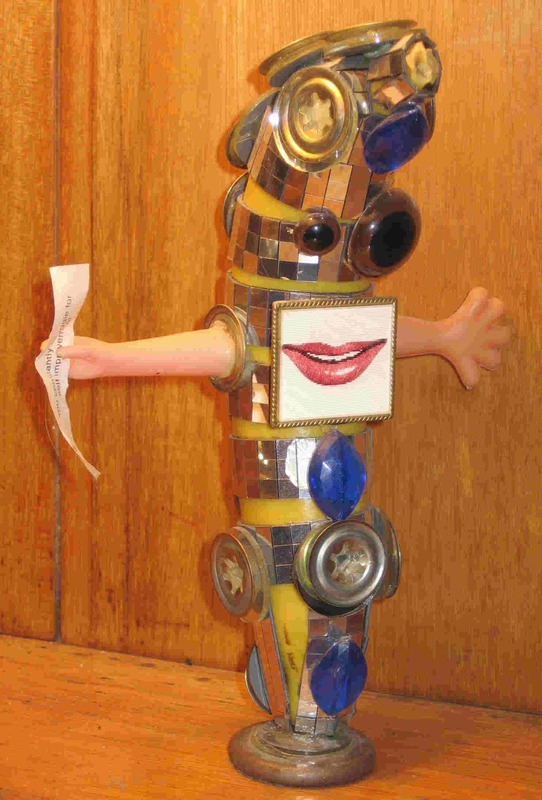 Folk art pieces like these are getting harder and harder to find. 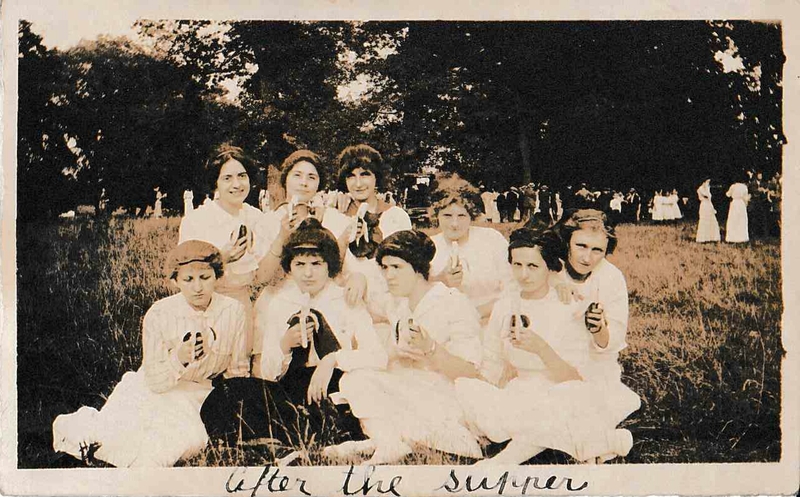 Ladies enjoying bananas after supper at a large gathering, perhaps a church picnic, c1920s. 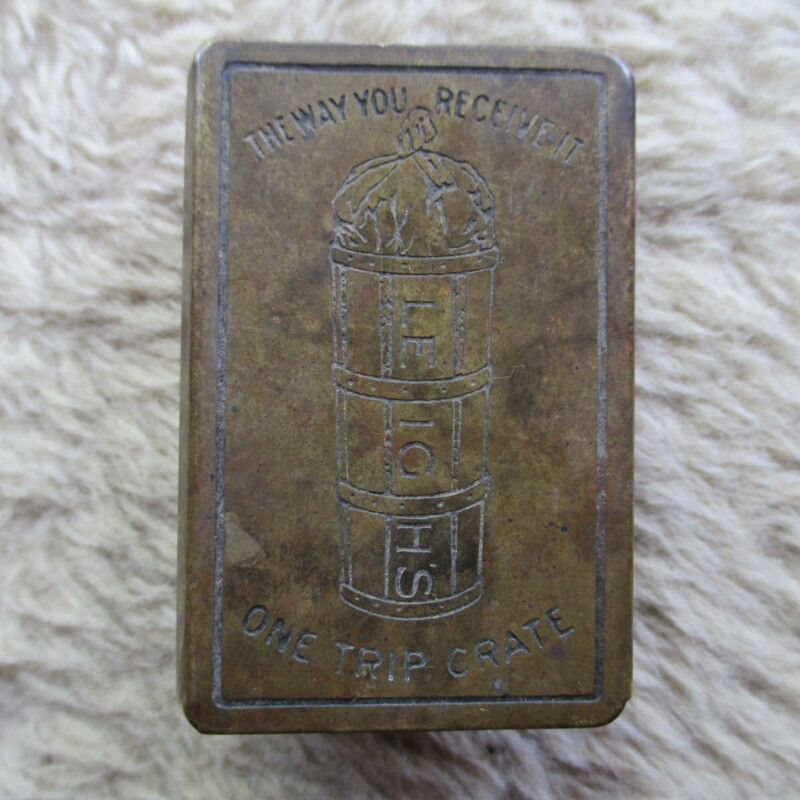 Leigh Banana Case matchbox safe. 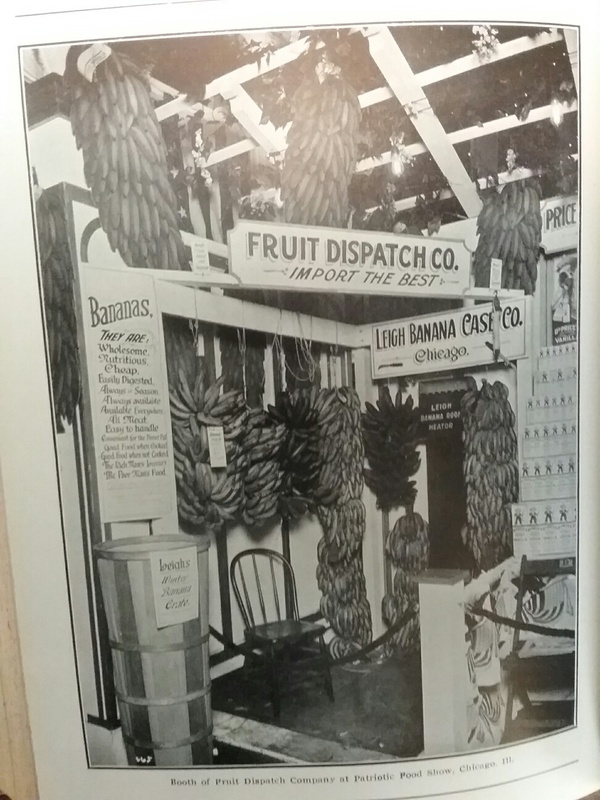 Display of Fruit Dispatch Company (subsidiary of United Fruit) and the Leigh Banana Case Company at the "Patriotic Food Show", January 1917 in Chicago. 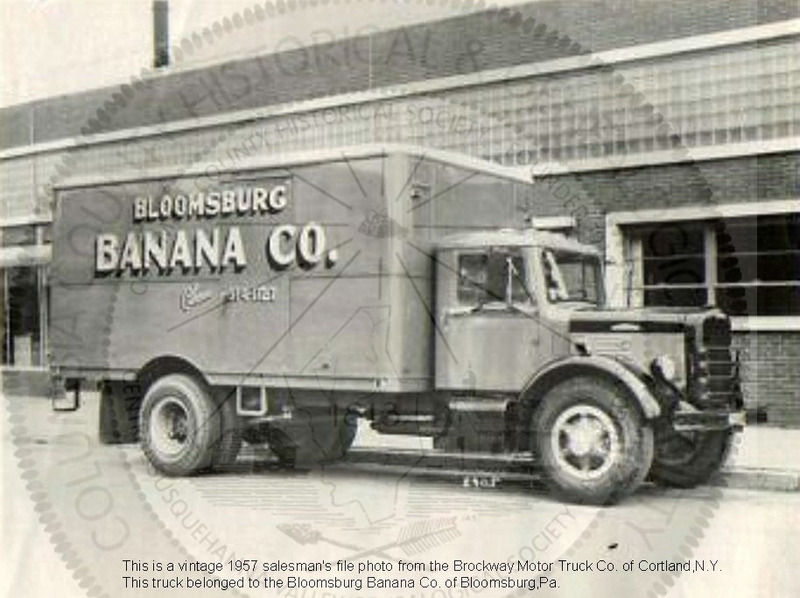 The Leigh Banana Case Company manufactured padded banana shipping crates, with factories all over the U.S. during that era. 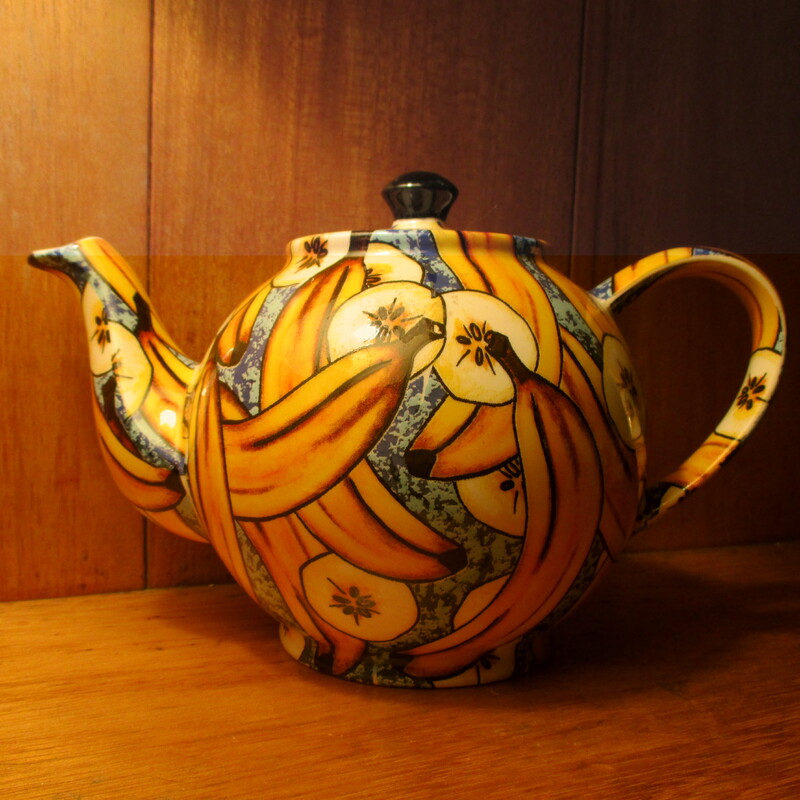 Banana teapot made by Cardew Design in England. 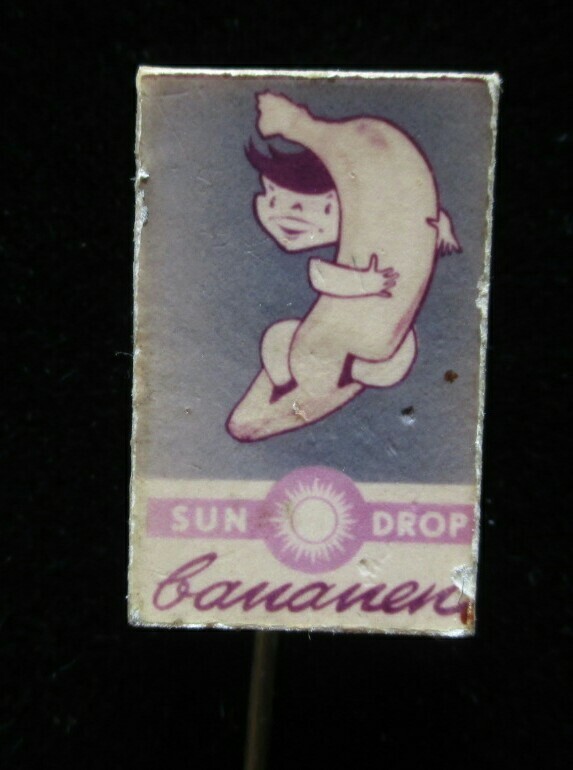 Banana pendant with L. Podesta tag. 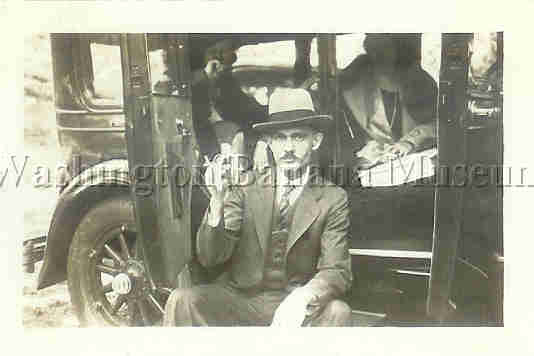 Louis Podesta was one of the many commission merchants in the old South Water Market in Chicago during the early 1900s. I believe he was in business as early as the 1870s. 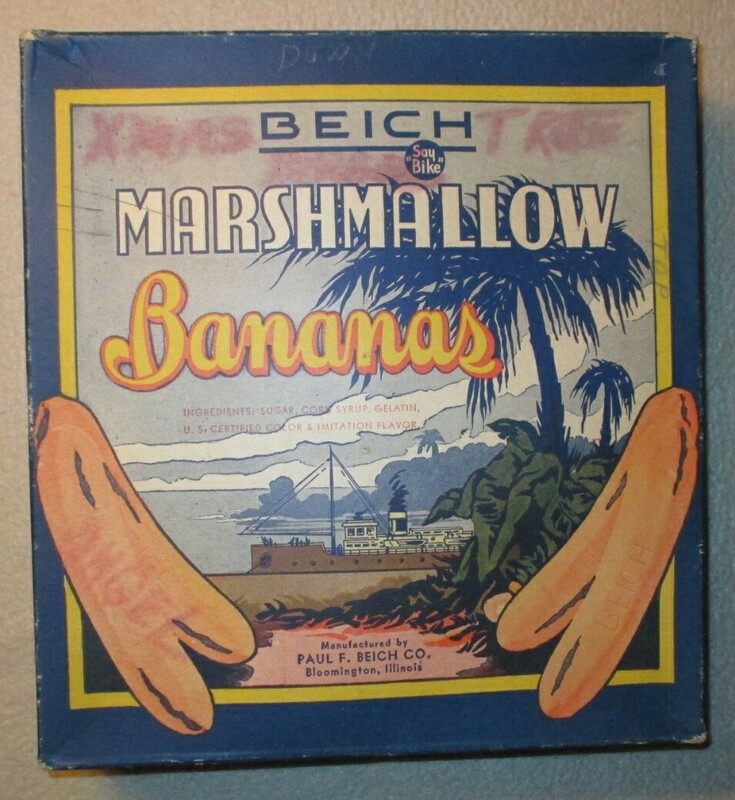 Two vintage 1920s Beich Marshmallow Banana candy boxes. 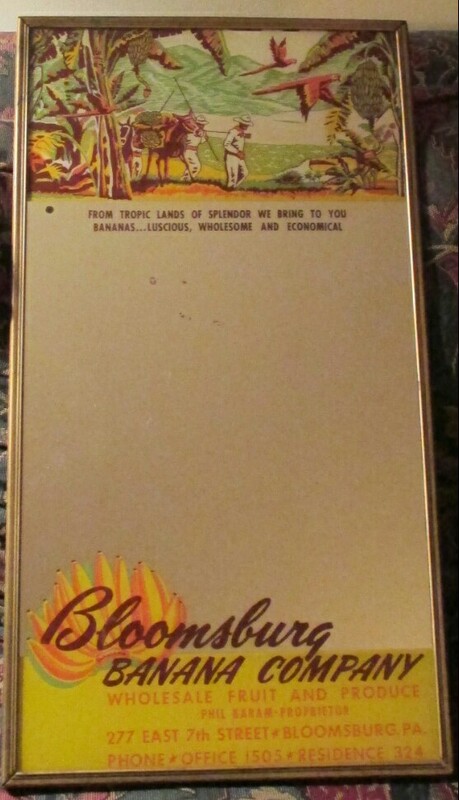 Advertising mirror from the Bloomsburg Banana Company out of Bloomsburg, PA. The graphics on this mirror are incredible. Below the mirror is a 1957 photograph of one of their delivery trucks made by the Brockway Motor Truck Company. 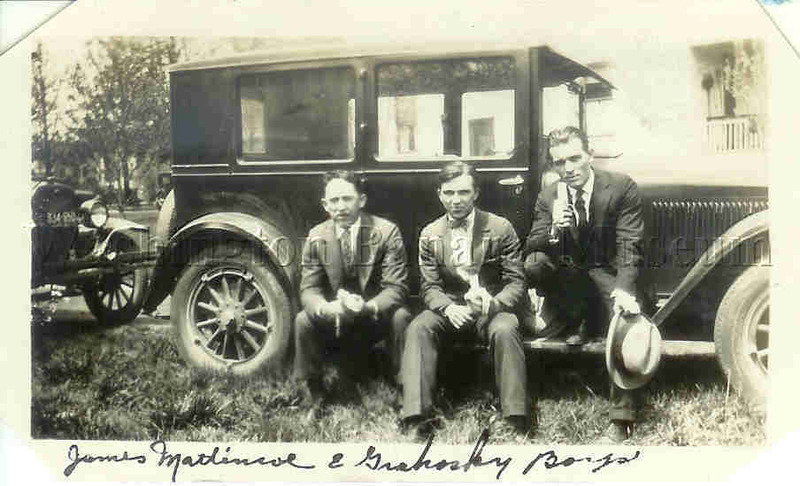 Many thanks to the Columbia County Historical & Genealogical Society of Bloomsburg, PA for use of the photograph. 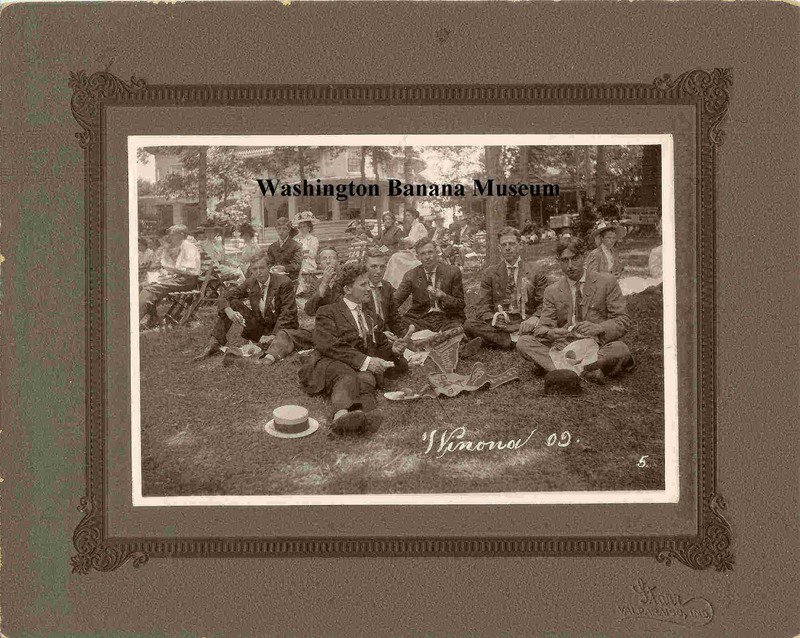 Banana eating at the "Baldwin Club of '93". 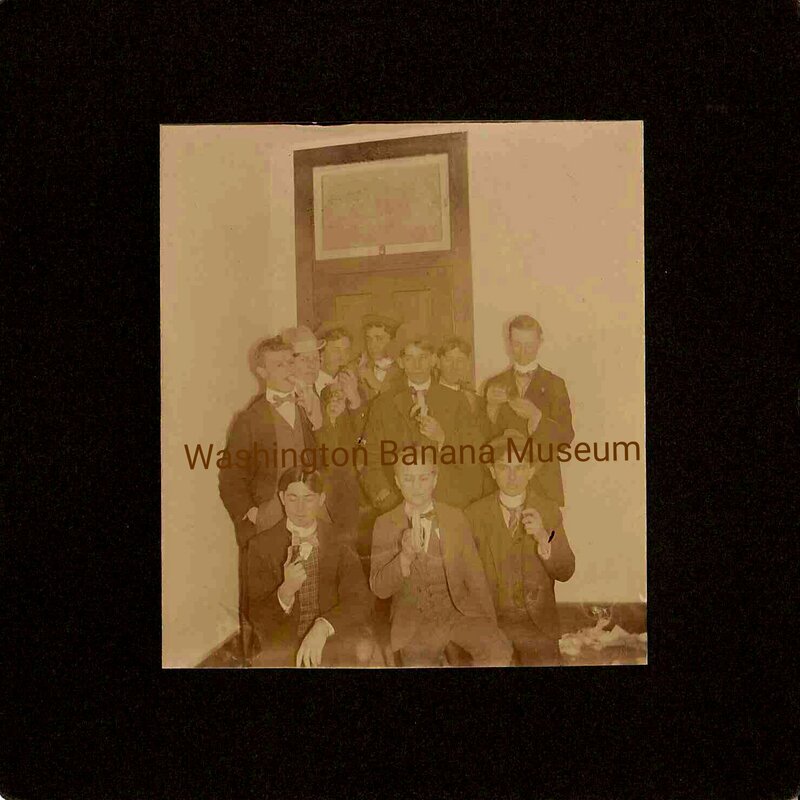 I believe this 1893 photograph to be a group of young scholars calling themselves the Baldwin Club of Wabash College in Crawfordsville, Indiana. The club was established at the college in 1874 and later evolved into the annual Baldwin Oratorical Contest, which continues to this day at Wabash College. The contest is the oldest continuous public speaking contest west of the Alleghenies. 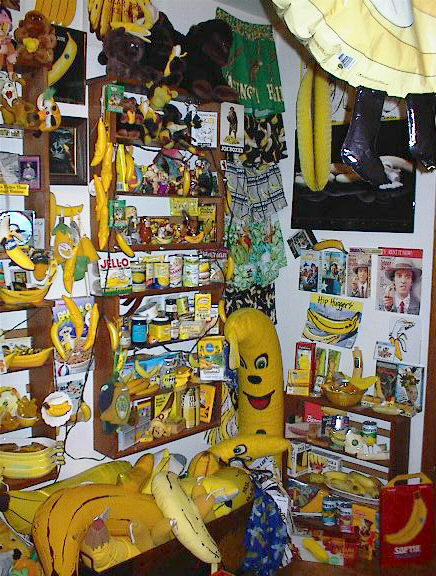 Why are so many of them eating bananas? To get superior mental acuity, no doubt! 1920s-era copper printing plate for The Fruit Dispatch Company. 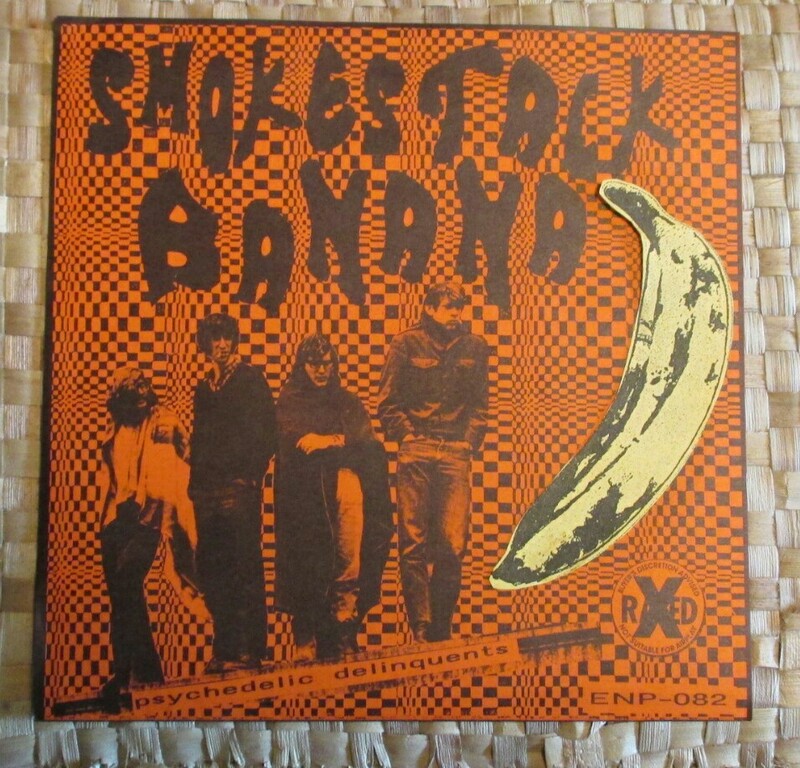 Smokestack Banana recorded this EP called Psychedelic Delinquents at the Silverbell Club in Pontiac, Michigan in 1968 but it wasn't released till the 1990s. 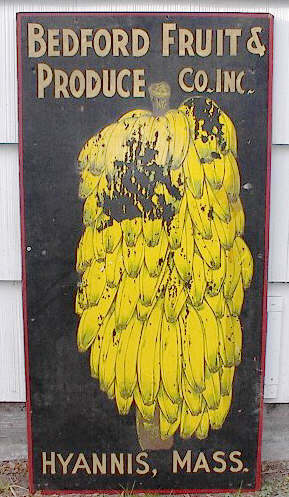 Another example of the Andy Warhol Velvet Underground banana being put to good use. Or not. 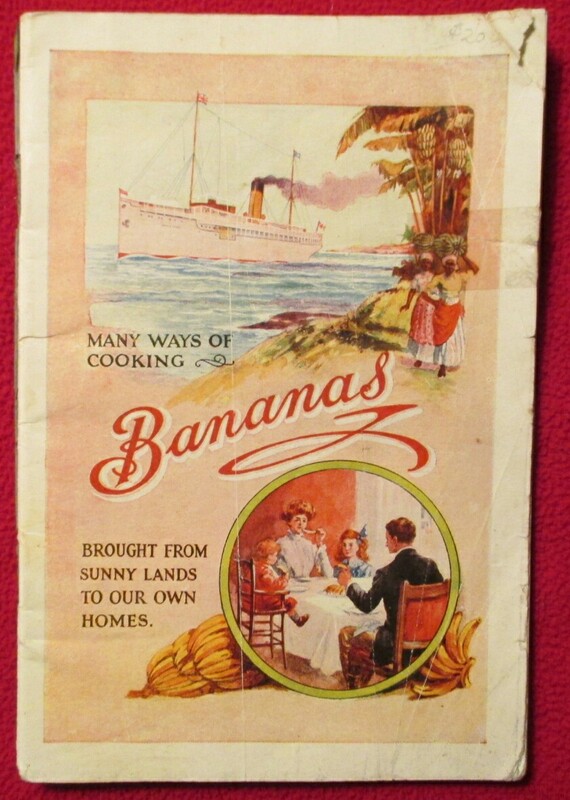 Detail from a 1920s linen-backed poster from the Fruit Dispatch Company (subsidiary of United Fruit) showing typical banana marketing of the day. 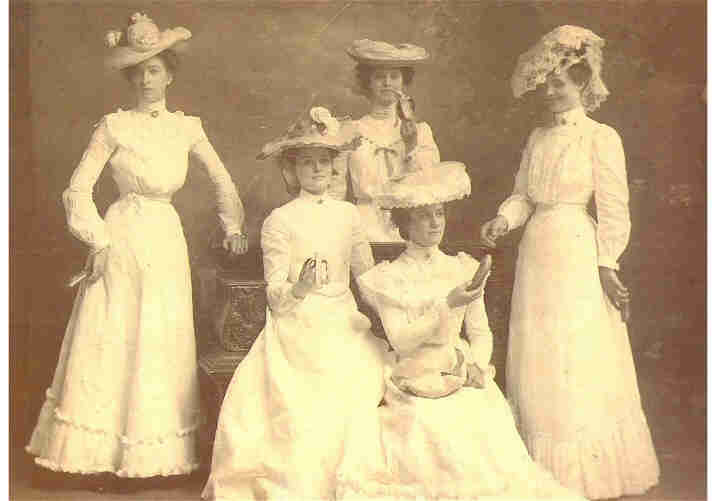 These Victorian women indulge in what passes for a bit of frivolity. Cut loose, ladies! 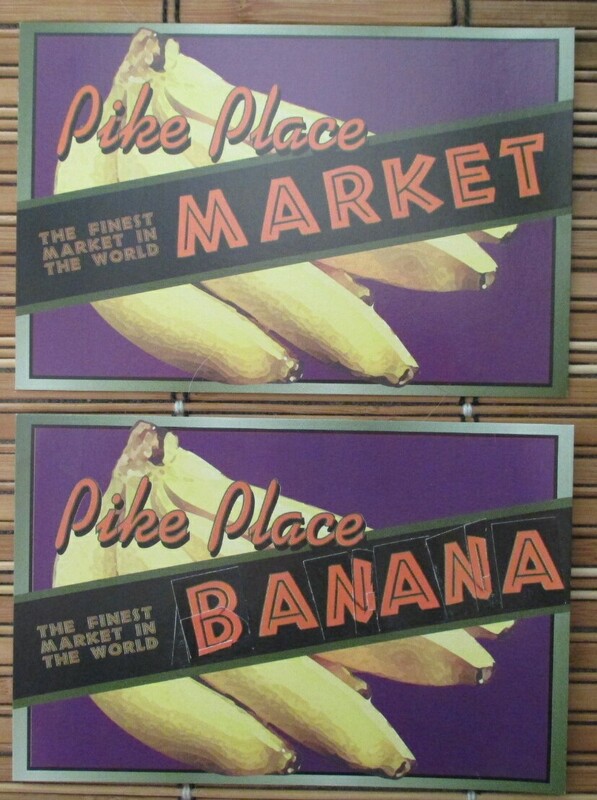 Pike Place Market to Pike Place bananas - a flyer for a 1999 Seattle gallery walk. And underneath it - an altered version done by yours truly. 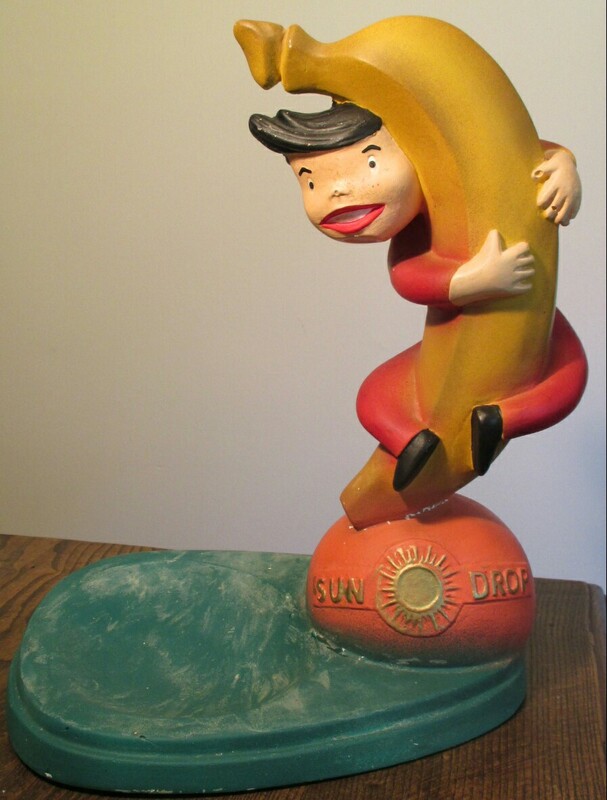 Sundrop bananas advertising figure, c1960s. The Sundrop brand was originally imported from the Belgian Congo by Antwerp-based Leon Van Parys (LVP or Elvepe) between the 1930s and about 1957. In the 1960s Sundrop became a Netherlands-based import. 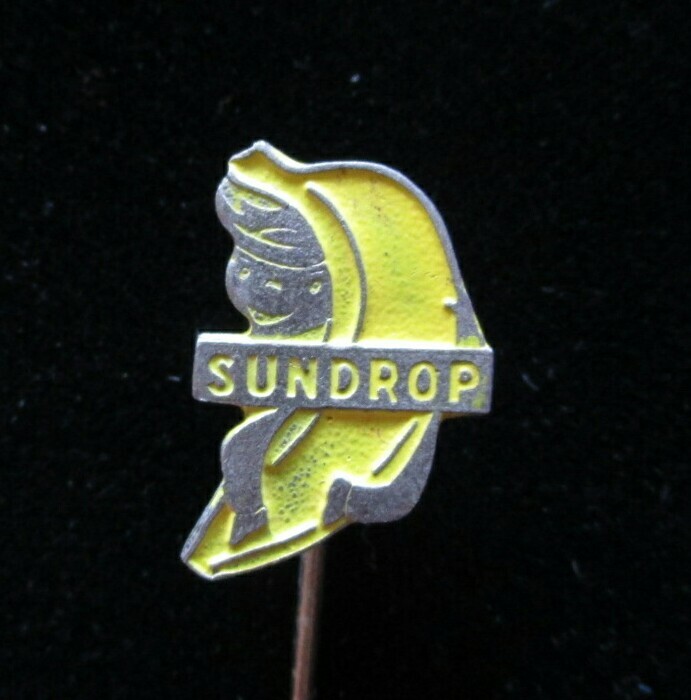 Also included here are two Sundrop banana lapel pins from the Netherlands with the same design. Chiquita Banana Sebastian miniature, no. 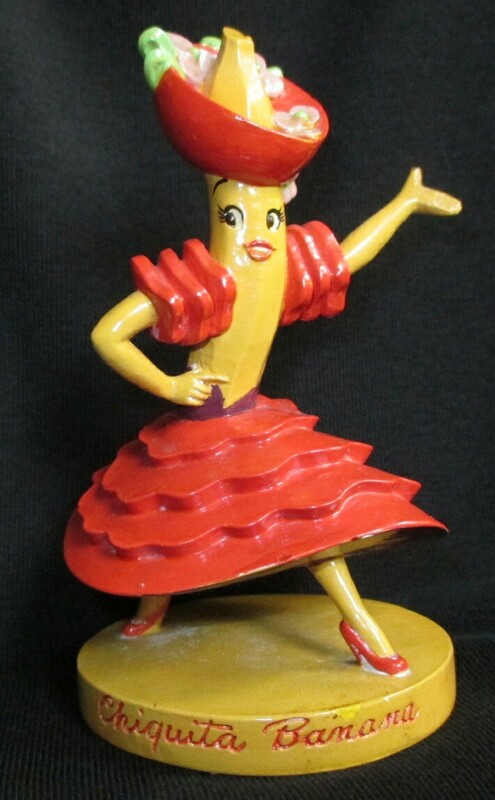 185(only 4 inches tall) made in 1951. Private issue for the United Fruit Company with only 2,000 produced. 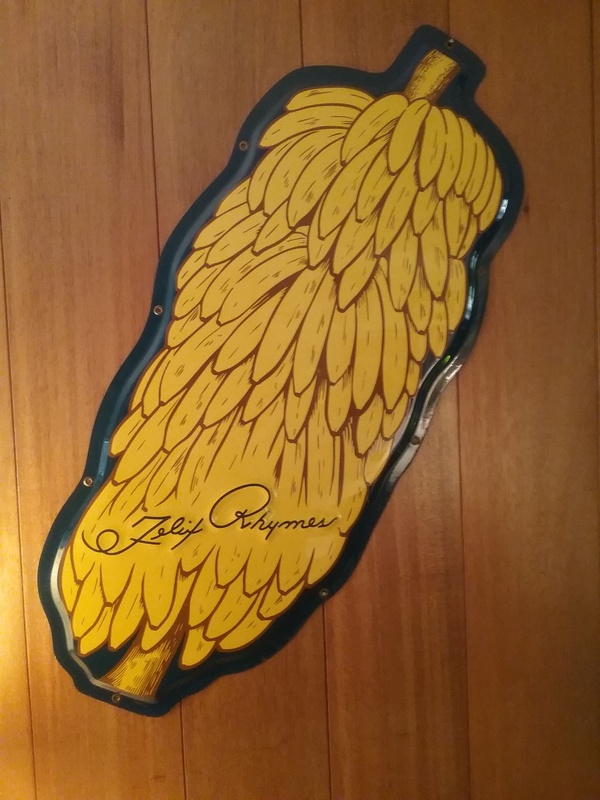 All were hand painted by the company's founder, Mr. Prescott W. Baston. Incredible! 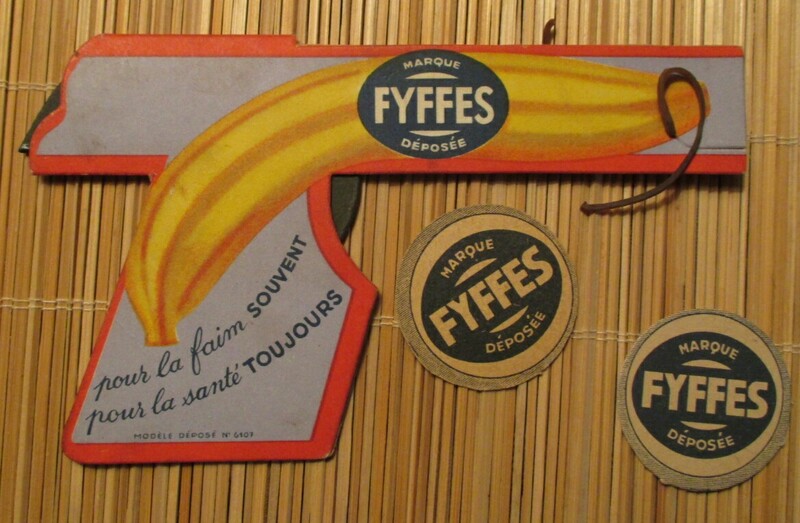 Fyffes bananas promotional rubber band gun from Belgium, 1950s. 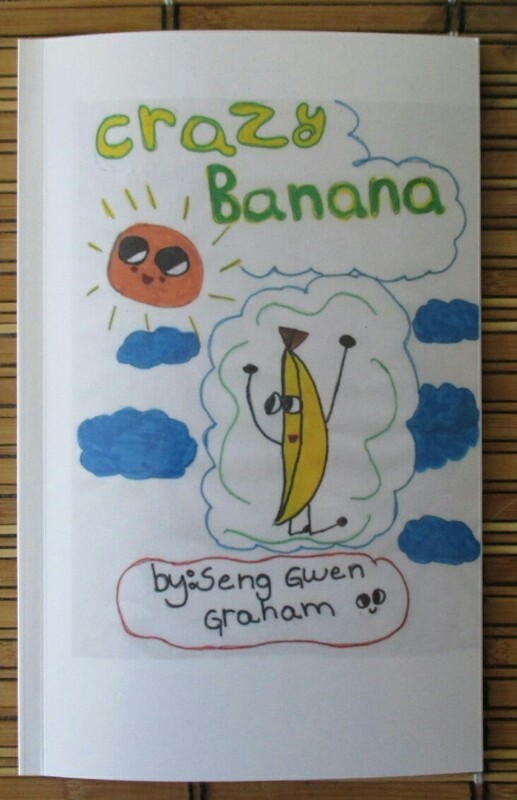 A big shout out to young writer Seng Gwen Graham for visiting with her family recently. 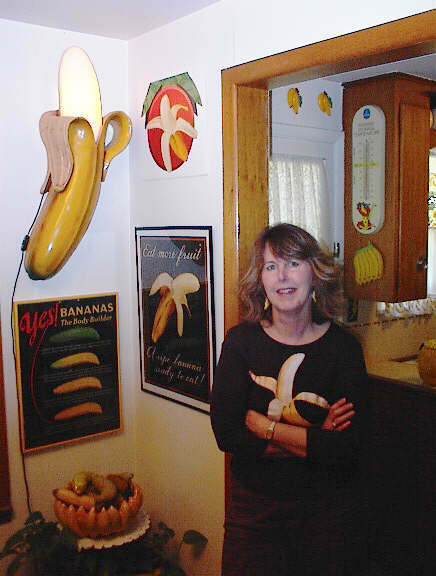 Her funny book "Crazy Banana" is on display in the museum. Thanks for the booksigning! 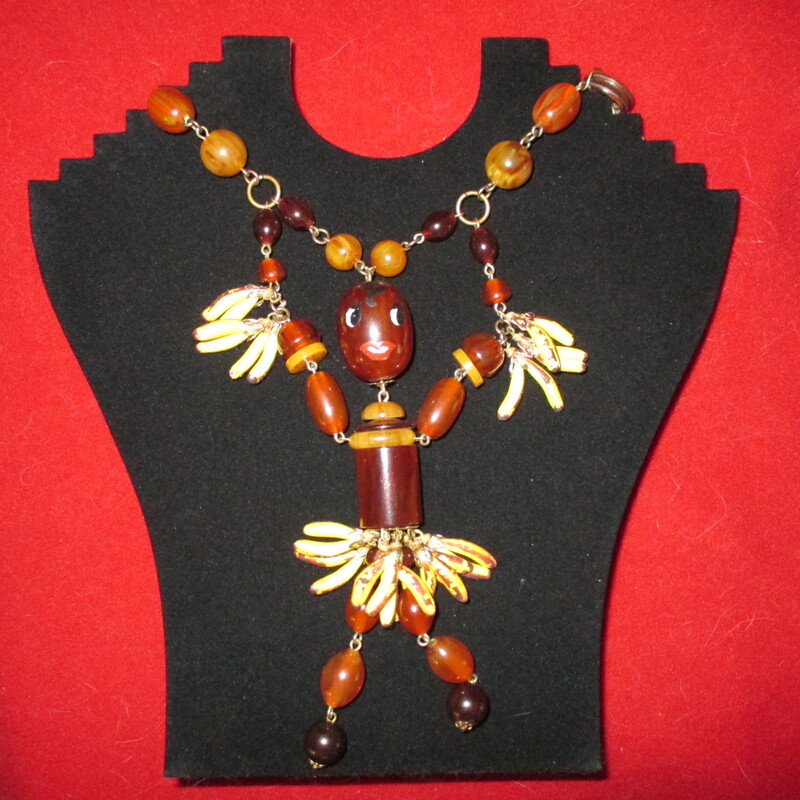 Josephine Baker bakelite necklace, with banana skirt. Drink a banana promotion from Dairy Queen. Photo courtesy of the Library of Congress. 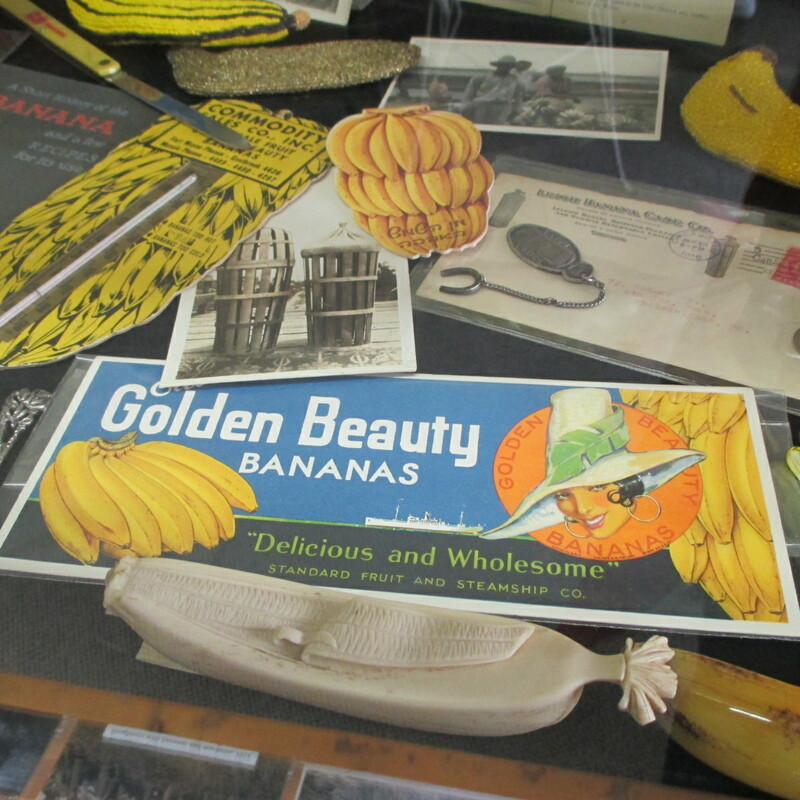 Standard Fruit & Steamship Company (now Dole) blotter and carved banana made of bone. 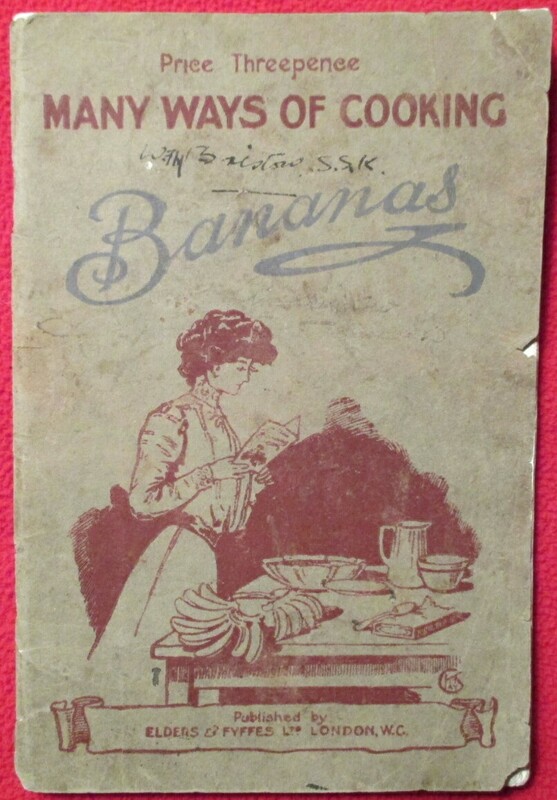 Cover and title page of a Fyffes Bananas cookbook from the United Kingdom around the turn of the last century. 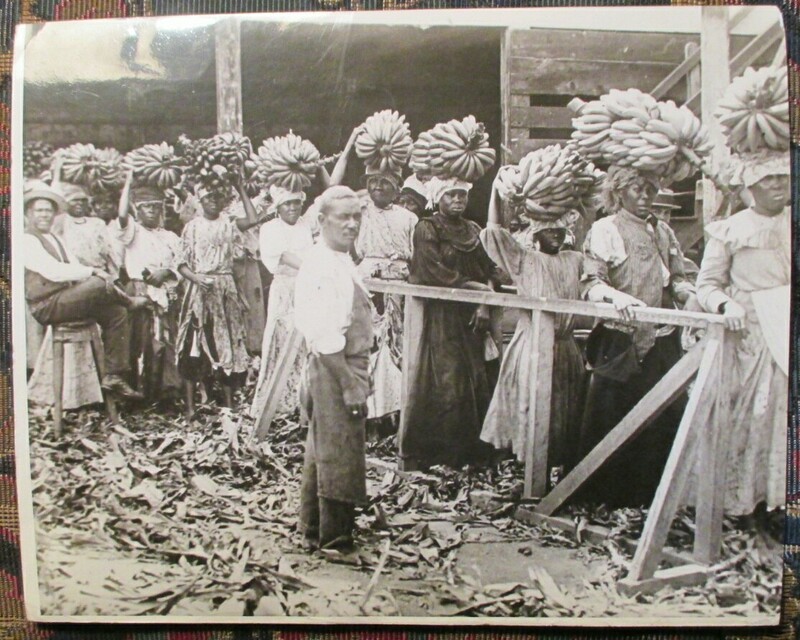 Scenes from a banana plantation in Panama. 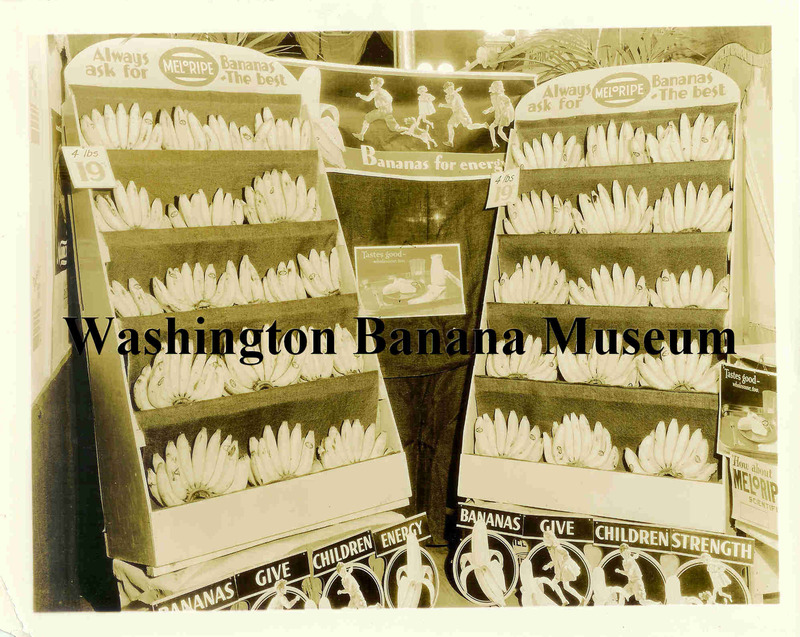 Meloripe Bananas display, circa 1930s. 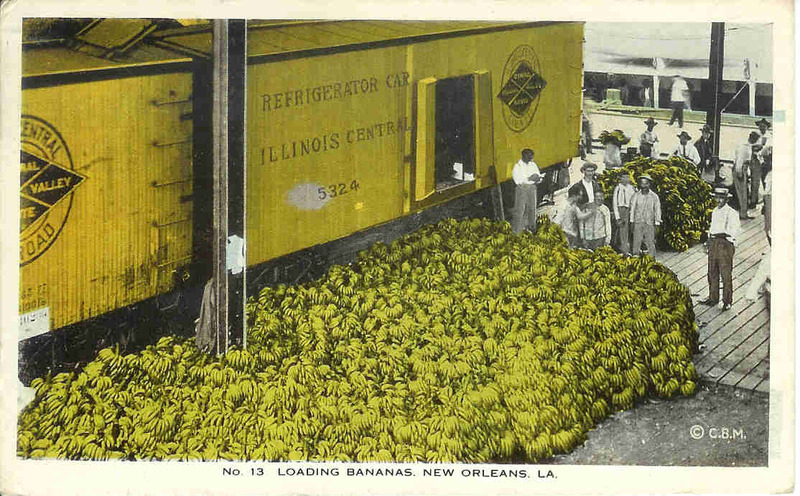 Bananas awaiting railroad car for part of their long journey. Early 1900s postcard of Limon, Costa Rica by H. Wimmer. 1950's California Pottery wall pocket and friend. Ooh la la! 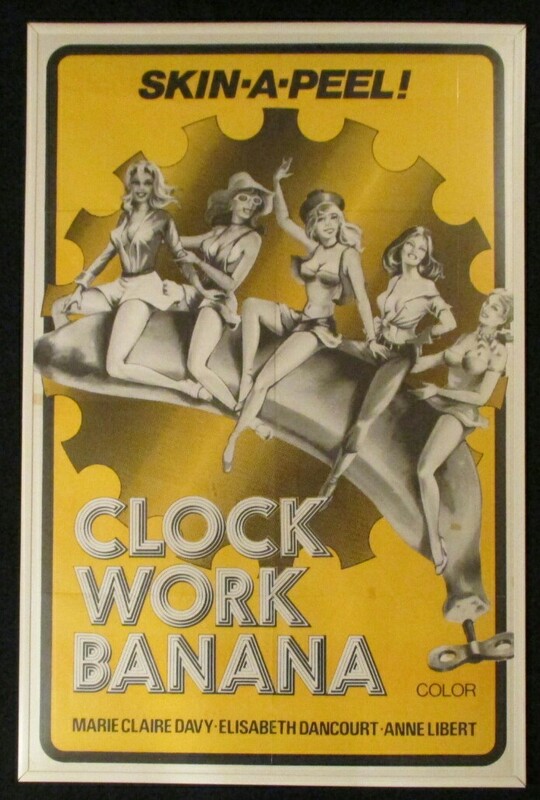 Poster for 1973 French low-budget movie called Clockwork Banana. The name is a take-off of the 1971 more famous movie A Clockwork Orange. 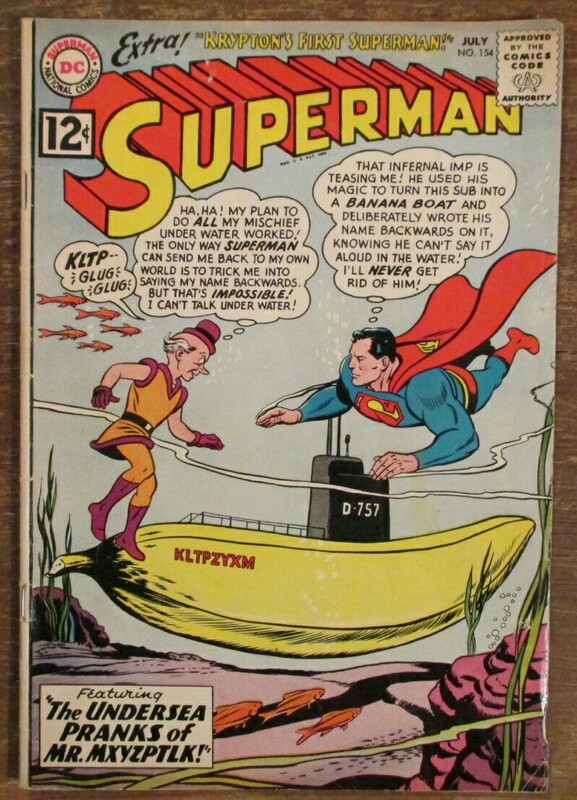 Superman comic #154, July 1962 featuring "The Undersea Pranks of Mr. Mxyzptlk!" 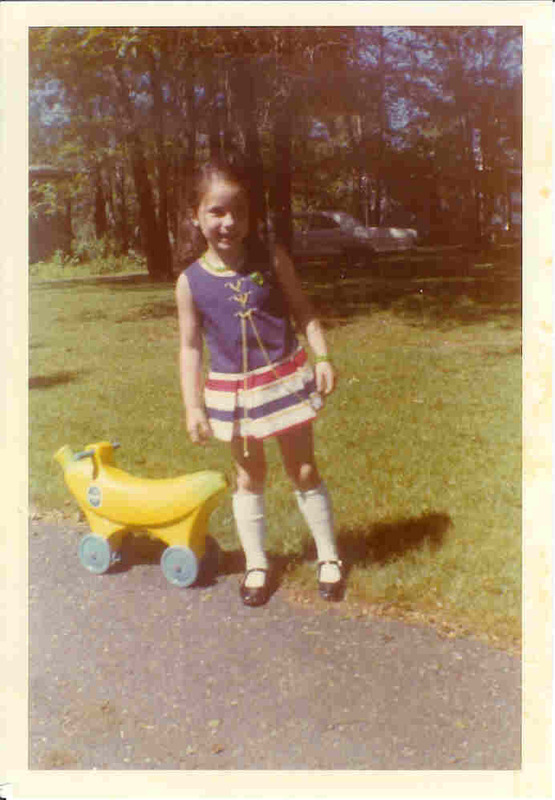 with a banana submarine. 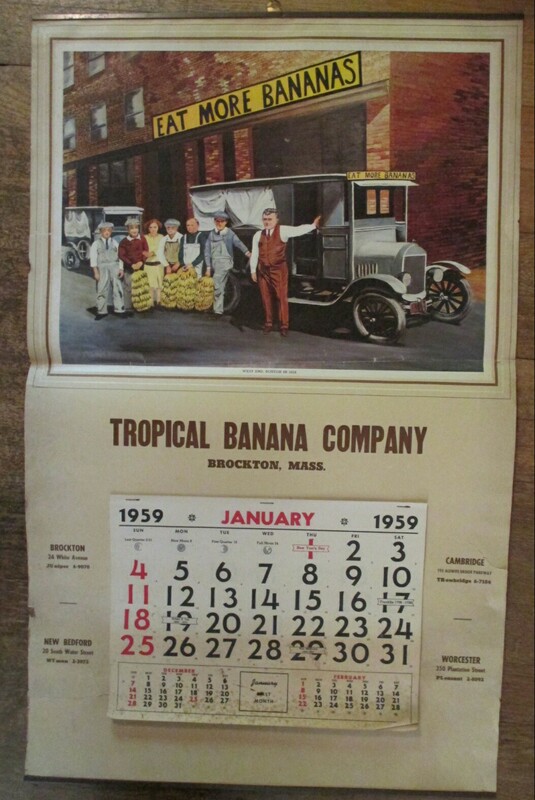 The Tropical Banana Company of Brockton, Massachusettes tells us to Eat More Bananas in this 1959 calendar. Birthday card from early 1900s. 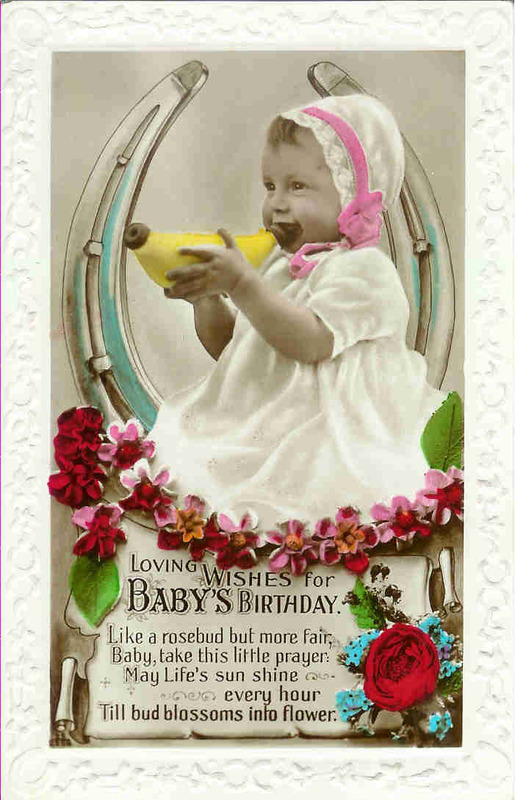 Banana-shaped baby bottles were first patented in 1885 and remained in use through the late 1950s. Miss Rose Bacon of the comedy-sketch team Cogan and Bacon. 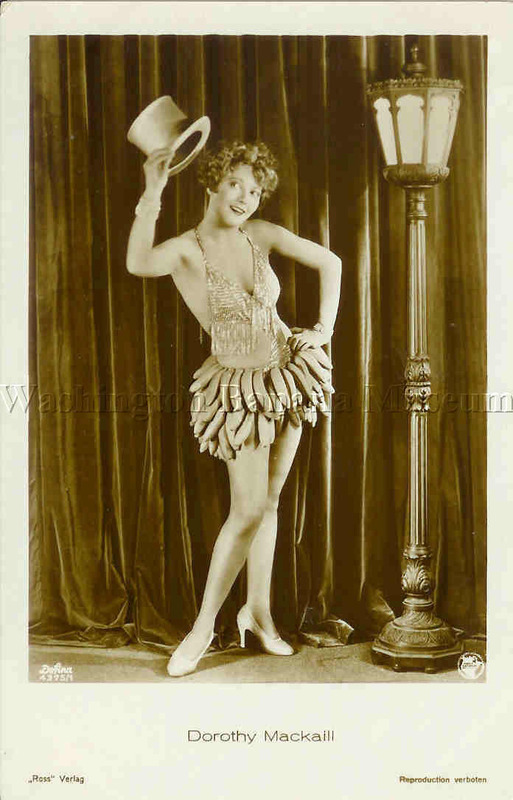 They worked the vaudeville circuit in the early 1900s. 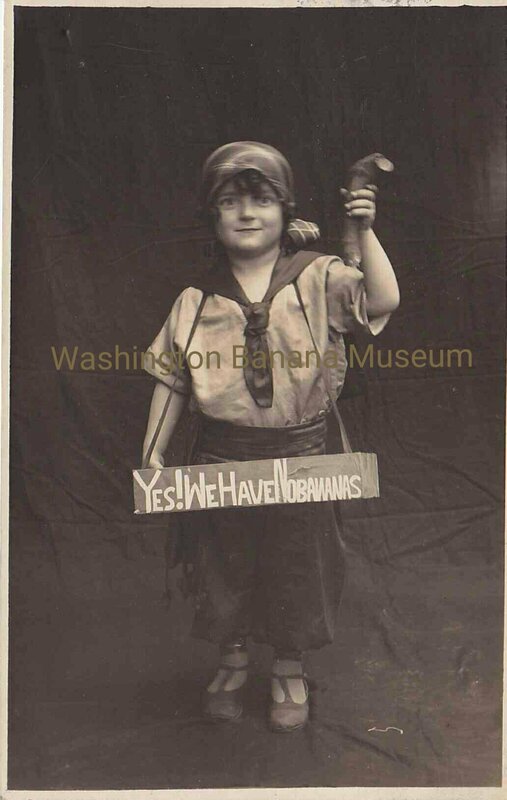 She's holding a banana, a prop that's still funny today. 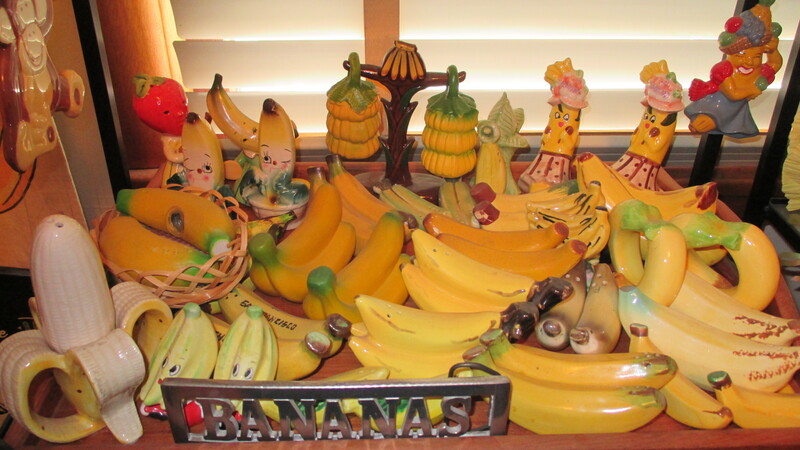 Here's what happens to some ripe bananas.... This postcard is by the amazing Texas artist Joey Waldon. Sadly, he passed away in May of 2013. Check out his other works here. Bonzo was a popular British cartoon character created and drawn by George Studdy. 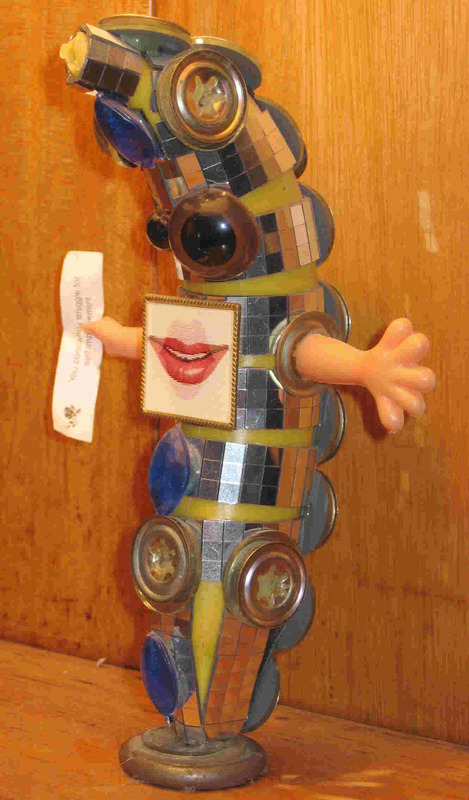 He was created possibly as early as 1913, but was most popular in the 1920s and 1930s. 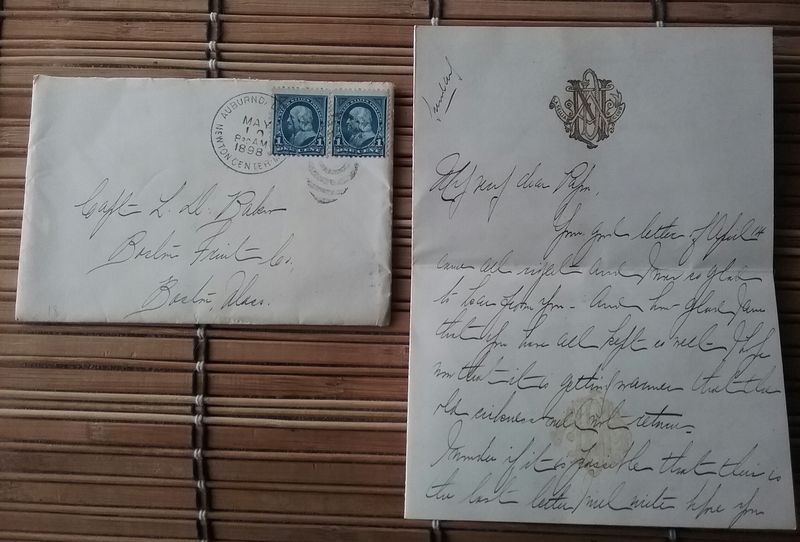 The postcard on the left was postmarked 1933, the middle one 1938 and the one on the right between those two dates. 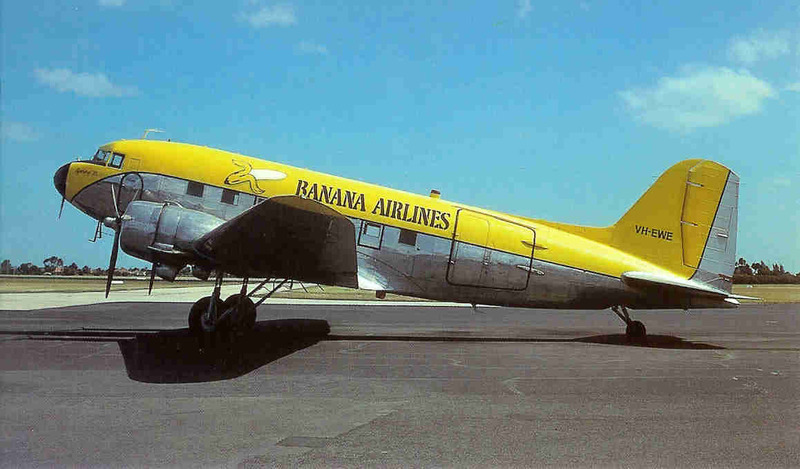 Banana Airlines wasn't a real airline. This Douglas DC-3 was formerly a U.S. Air Force cargo plane. 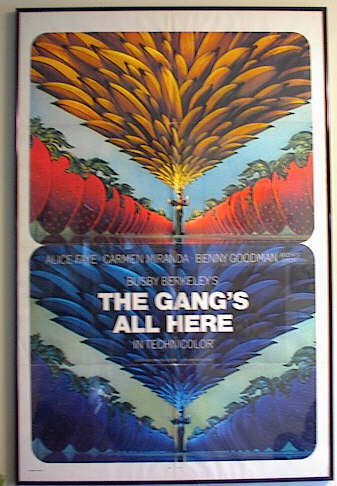 It was later repainted and seats were added for a 1981 Australian movie called Pacific Banana. 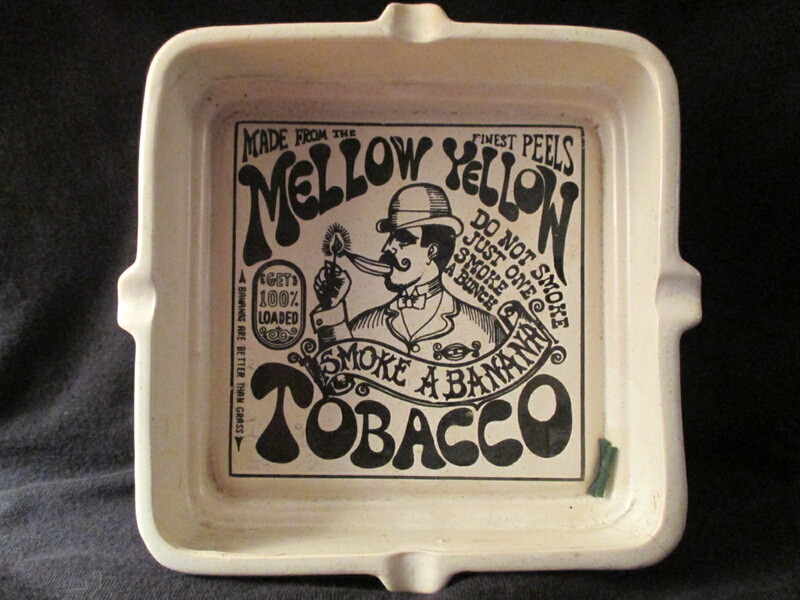 Smoking banana peels in the 1960s was really something the media created. It was proven that no high would result. 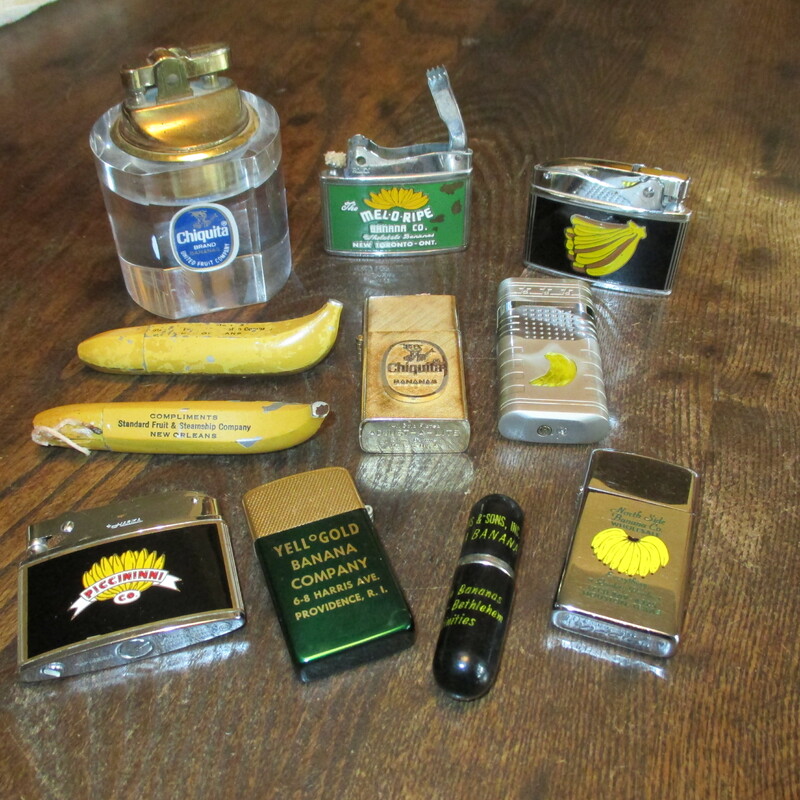 Here are a few items to go along with "the frenzy" of smoking banana peels. More sheet music, these from 1923. 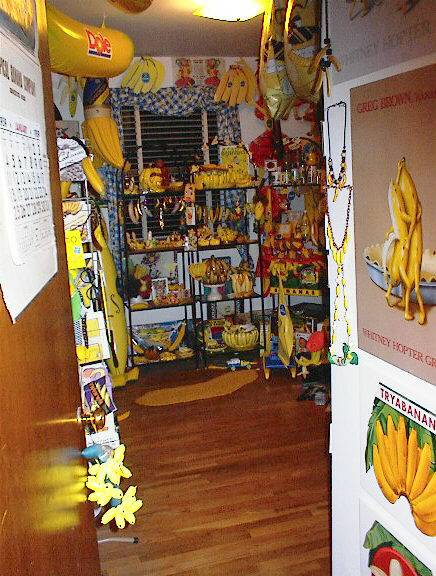 Back then, the banana in wide circulation was the Big Mike (Gros Michel). 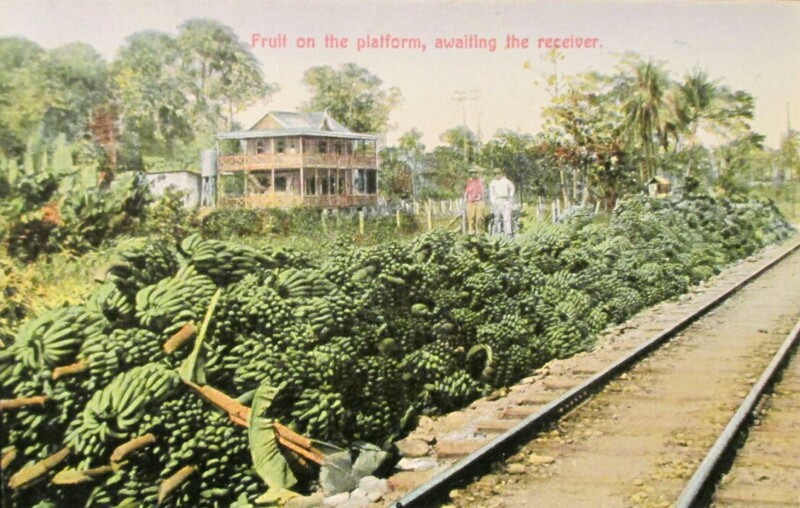 During the 1950s it was destroyed worldwide by Panama Disease. Now we eat primarily the Cavendish. 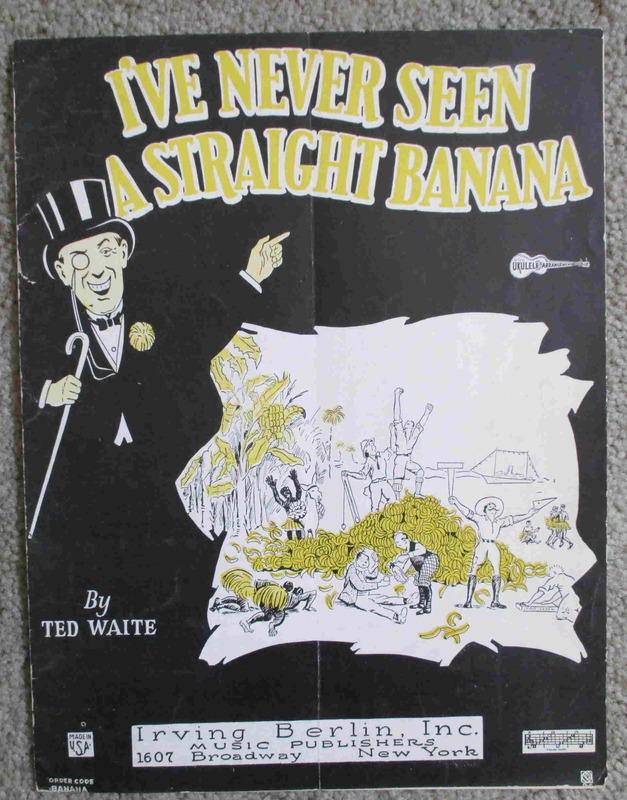 Sheet music for the novelty song "I've Never Seen a Straight Banana" written by Ted Waite in 1926. Fred Waring had a hit with it the following year. Forty years later (1967) Tiny Tim recorded it. 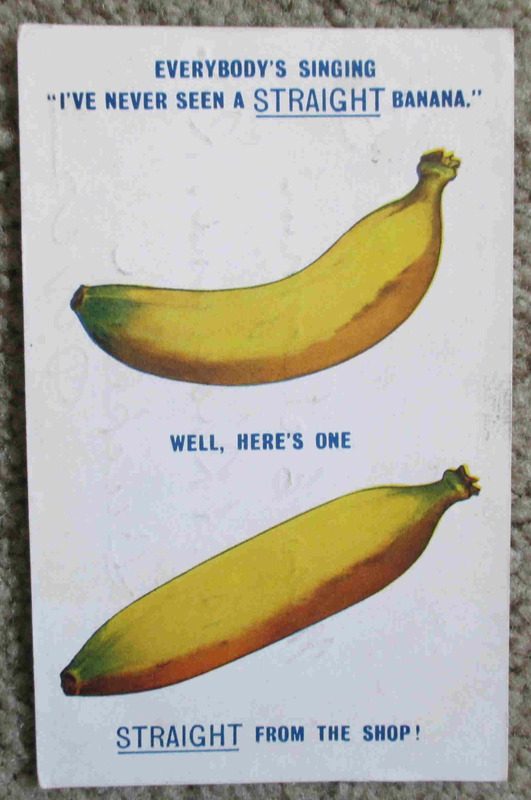 Postcard tie-in sent late 1920s, about the lack of straight bananas. Earlier, in 1923, two other popular novelty songs were "Yes! 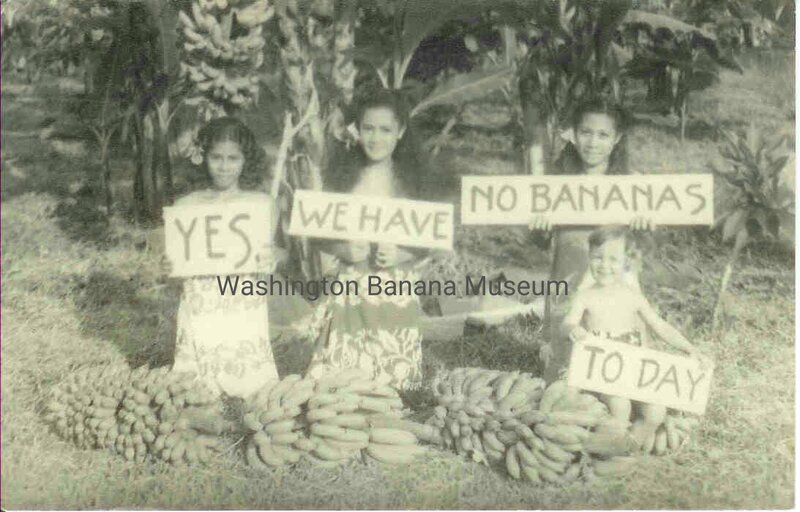 We Have No Bananas" and "I've Got the 'Yes! 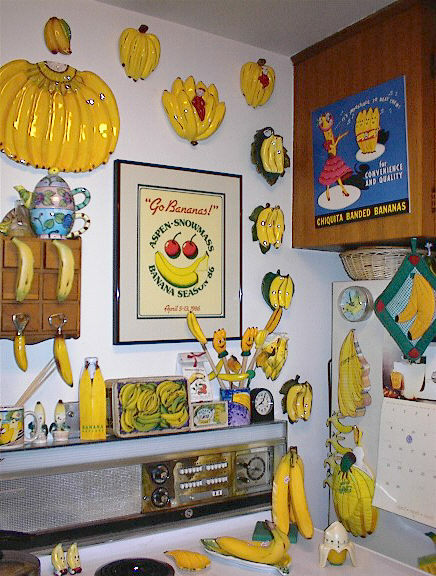 We Have No Bananas' Blues". 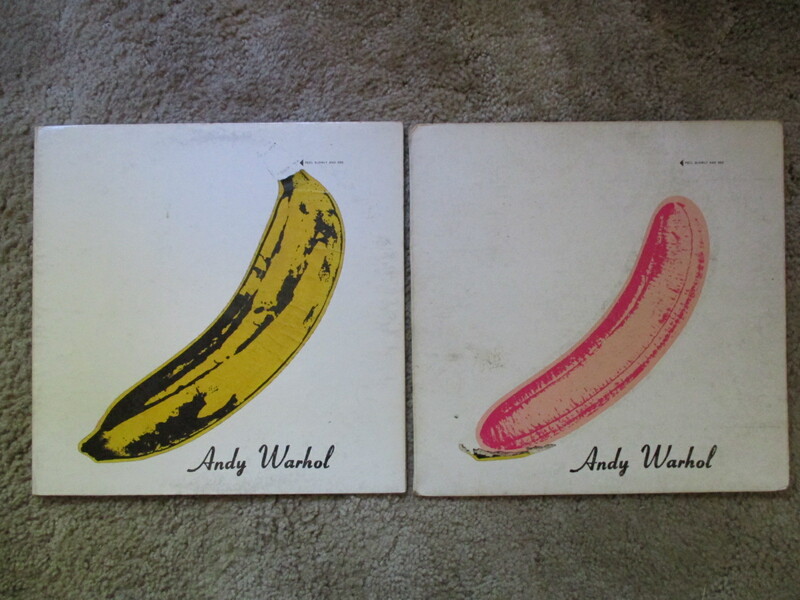 Two album covers (before and after peeling) of the Velvet Underground's 1967 LP with the famous Andy Warhol banana. Later versions of the LP weren't peelable. 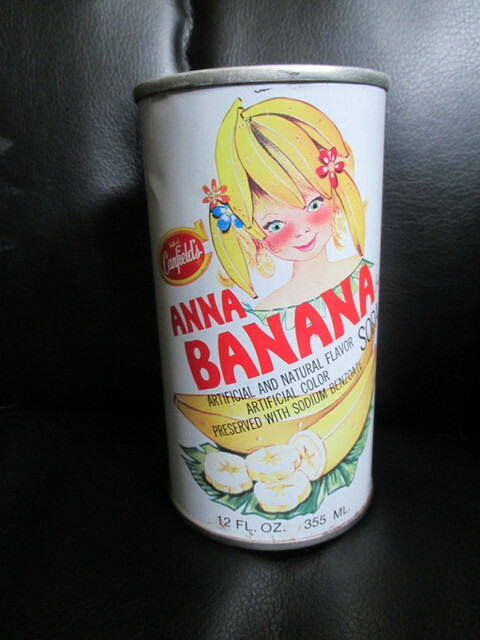 The A. J. Canfield Company of Chicago made Anna Banana Soda in the 1970s. I've posted this before, but there is still some interest in it. In my conversation with a Canfield descendent, he said that at one time the company donated some cases of this banana soda to a charity and the charity returned them, as nobody liked the taste of it. 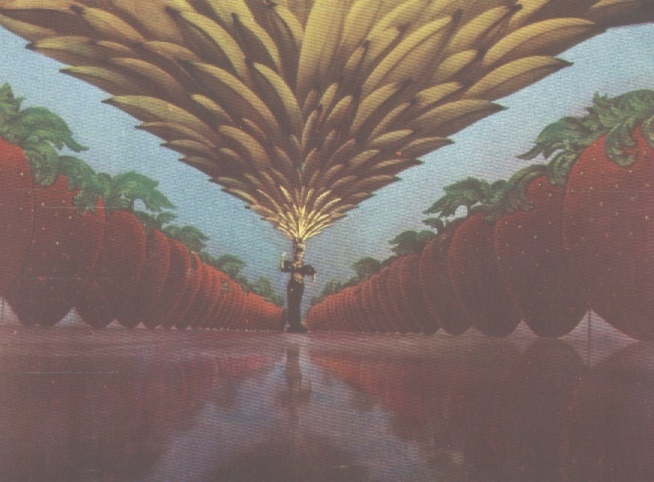 The artwork was done by the same person that created artwork for the Campbell Soup Company. 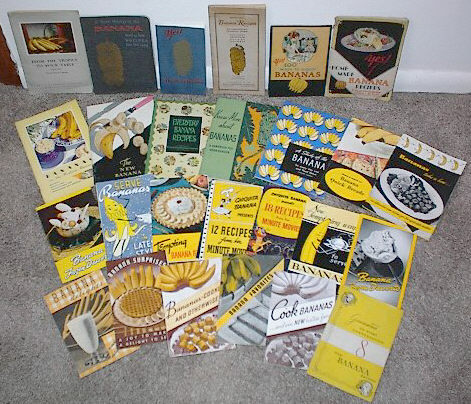 Informational and cookbooklet covers from 1928, 1939 and 1941. Tonga was the first country in the world to use self-adhesive stamps. 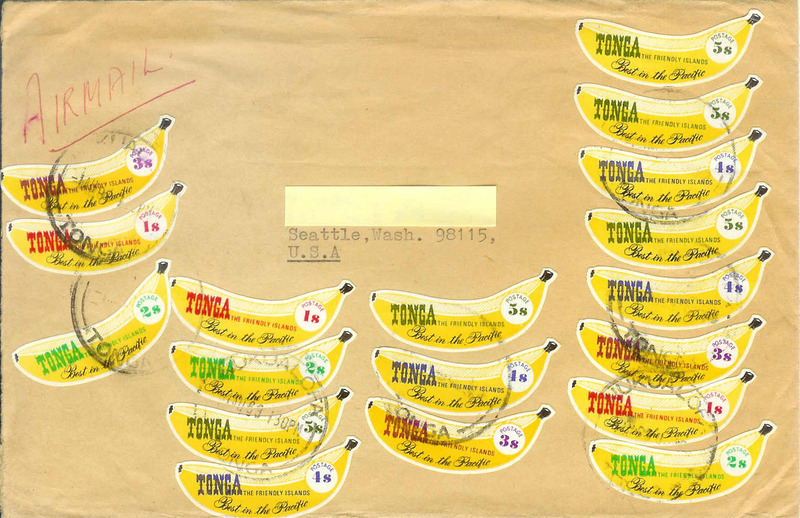 These self-adhesive coil banana stamps were issued in 1969. From my father' s extensive stamp collection. For more information on these stamps click here. Two beautiful illustrations by Dean Cornwell (1892-1960) for Chiquita bananas. He was a famous American illustrator and muralist working in the 1920s through the 1950s. You can find many of his illustrations in Life, Cosmopolitan, Harper�s Bazaar, Good Housekeeping and Redbook. He also illustrated books by Ernest Hemingway, Edna Ferber, W. Somerset Maugham among others. 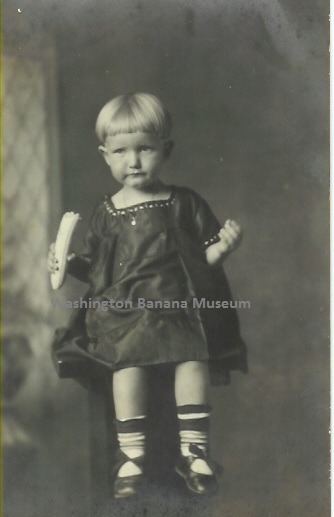 The use of props in photographs and cabinet cards in the early 1900s was common, especially with children. 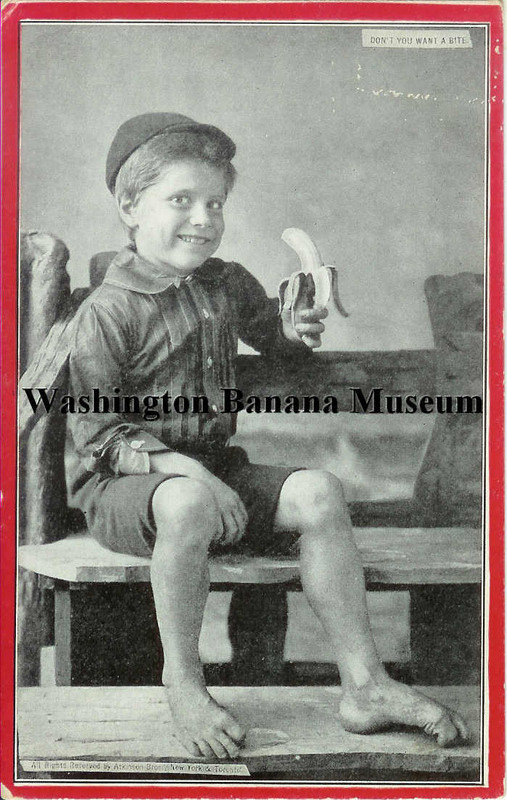 Here a young boy is holding a banana - a reward to be eaten when he is done posing. 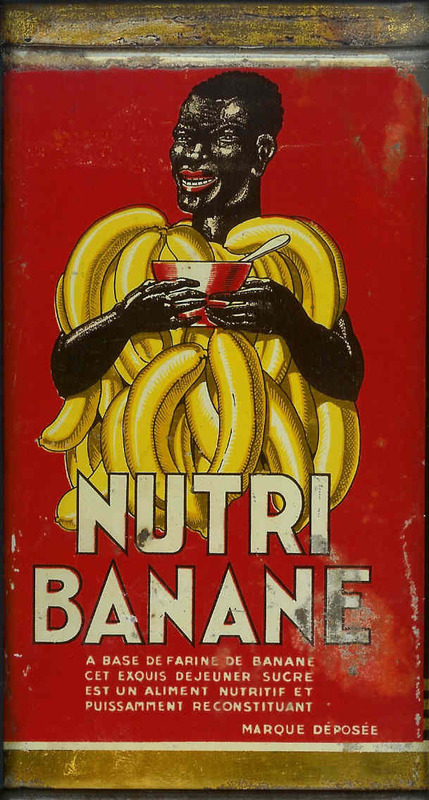 An old NutriBanane tin - a breakfast drink made from bananas. 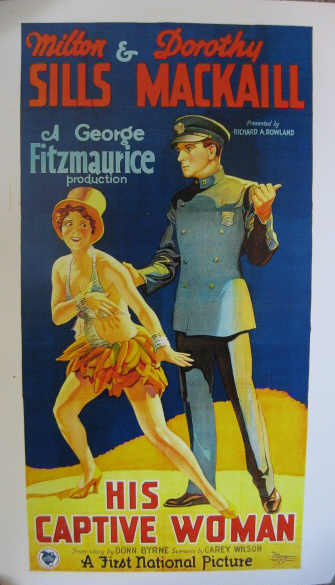 Dorothy Mackaill starred in the 1929 movie "His Captive Woman." In one scene she wears a banana skirt. 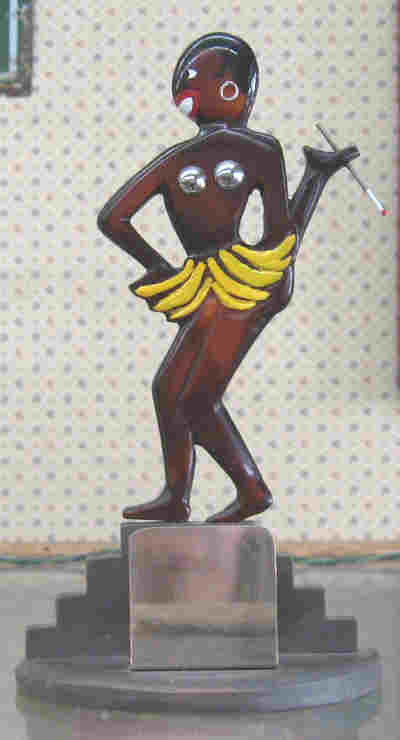 She's no Josephine Baker, but she does have a pretty good banana skirt. 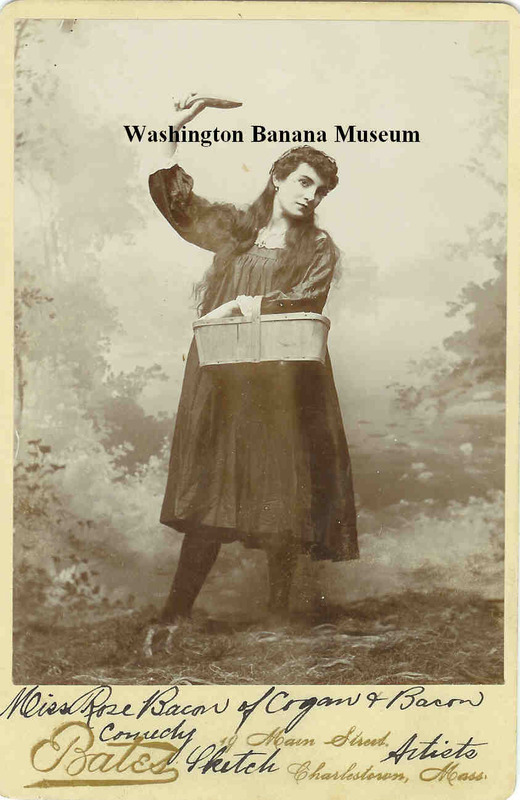 Here's a postcard of her wearing the skirt, and the poster for the movie. 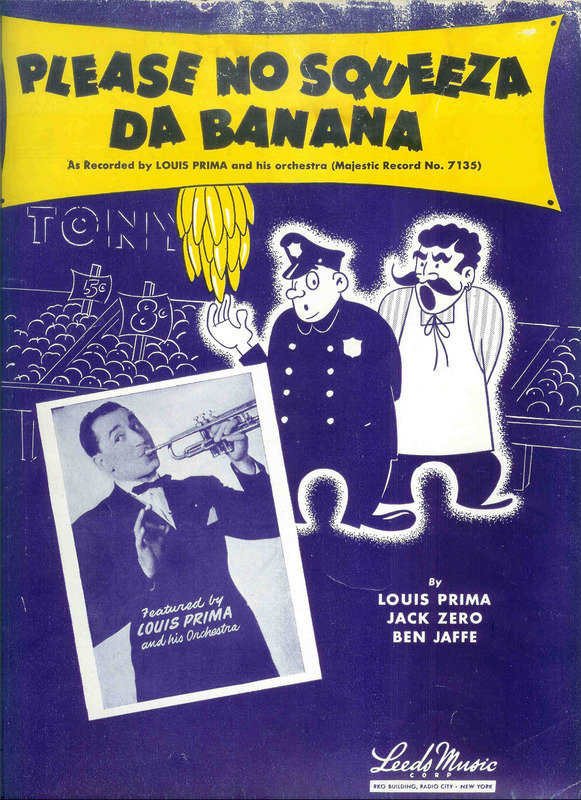 Original sheet music for the 1944 song "Please No Squeeza da Banana" by Louis Prima, Jack Zero and Ben Jaffe. Coming some twenty years after another novelty hit song, "Yes! 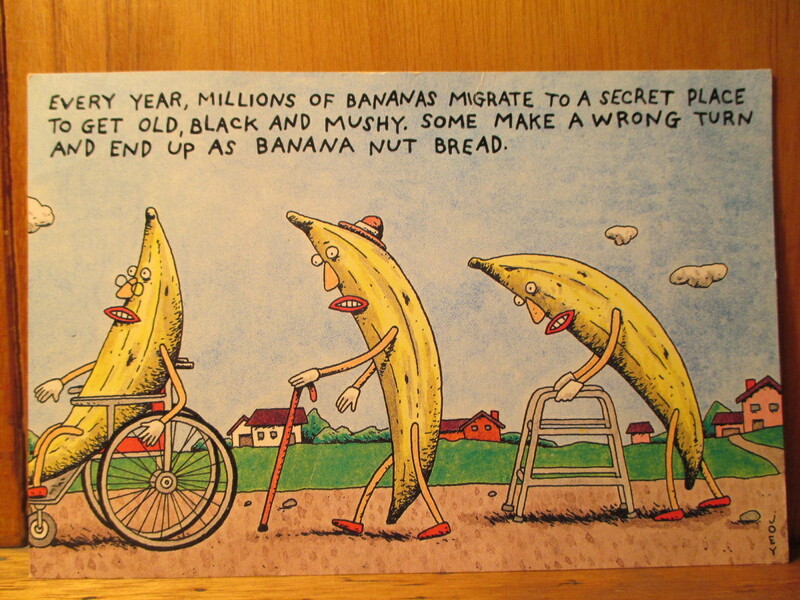 We Have No Bananas," it was a wartime hit. 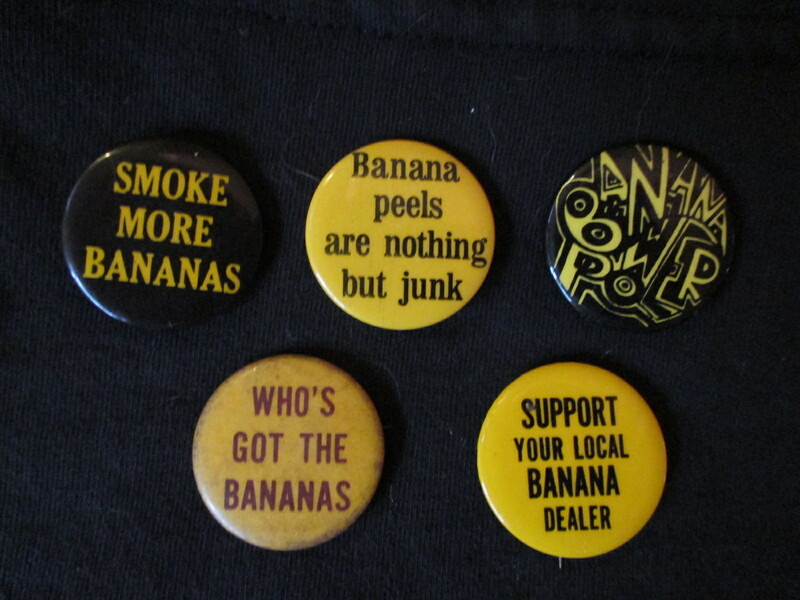 Three pinbacks inspired by Louis Prima's song "Please No Squeeza da Banana." 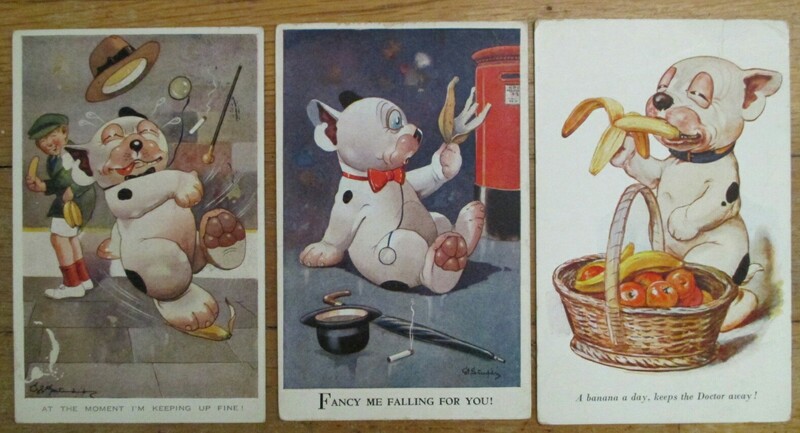 Three postcards from 1908-1909. 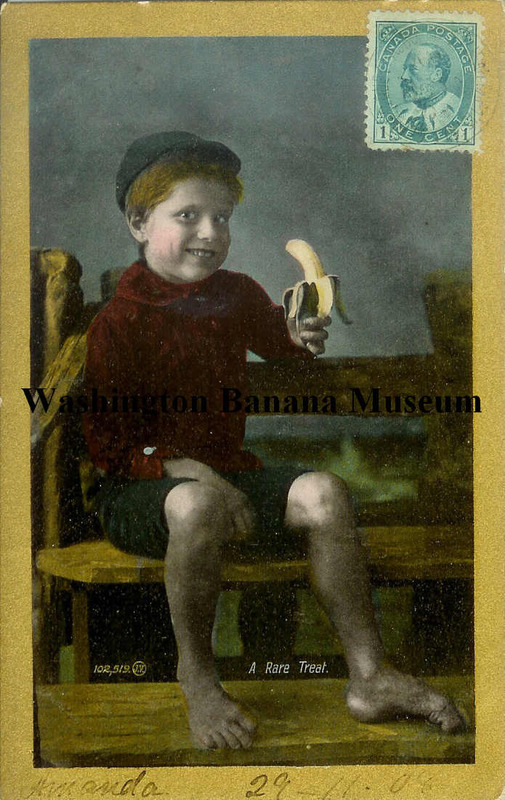 The original 1899 photograph, called �Boy with banana� was a studio portrait by renowned Canadian photographer Reuben R. Sallows (1855-1937), which was then used in these three postcards. Sallows documented all manner of Canadian life in the early 1900s and his amazing work can be seen at The Reuben R. Sallows Gallery (http://www.sallowsgallery.ca) located in the mezzanine of the Goderich Public Library in Goderich, Ontario. For more information about The Reuben R. Sallows Gallery please contact sallowsgallery@huroncounty.ca or call 519-525-5559. 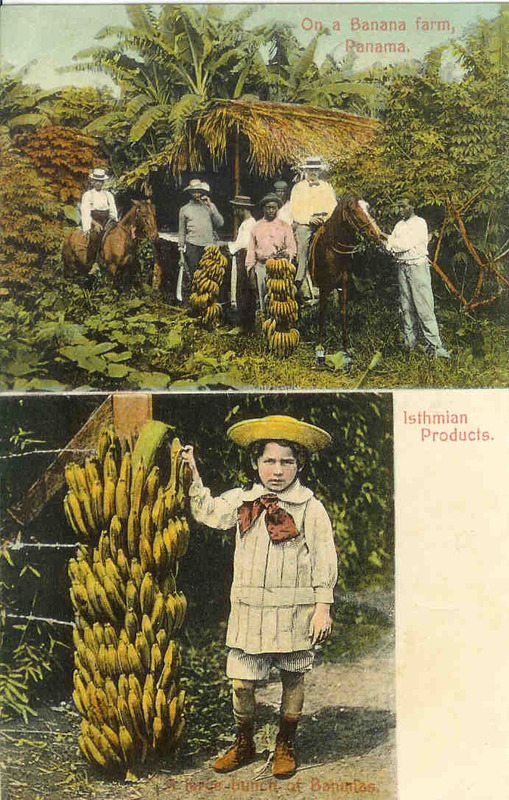 West Indian Bananas was a subsidiary of Elders & Fyffes, the British produce giant. The postcard with the green background was produced in Manchester, England while the other two postcards were made in Canada. 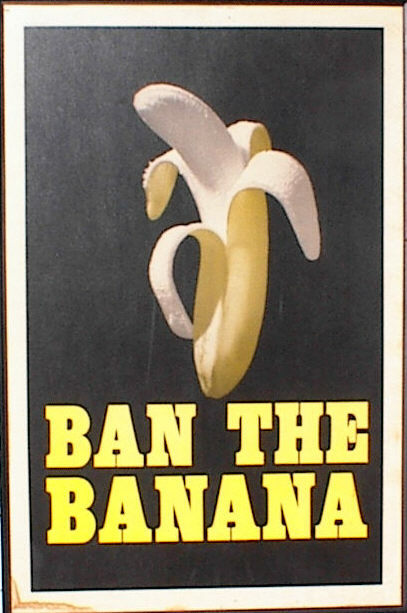 Double-sided cardboard signs typically used in grocery stores to promote bananas during the 1930s into the 1940s. 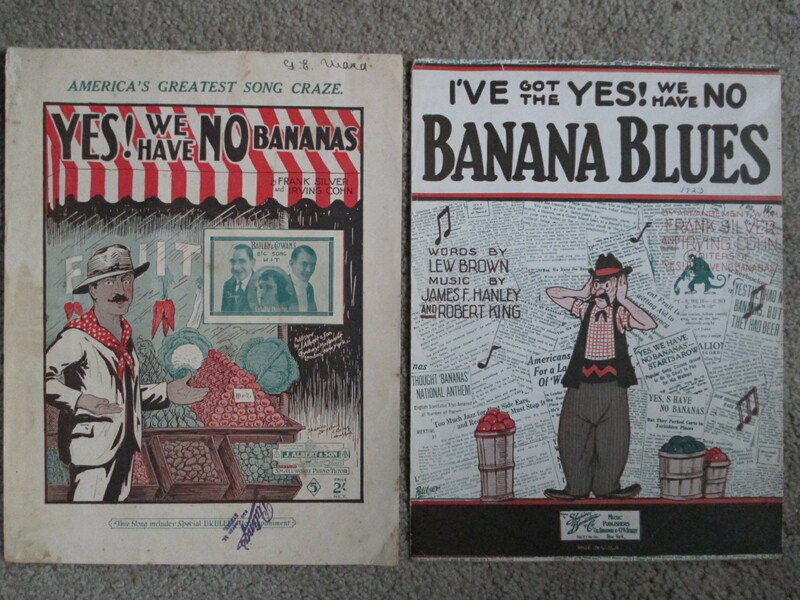 My earliest banana-related sheet music - this one from 1904. 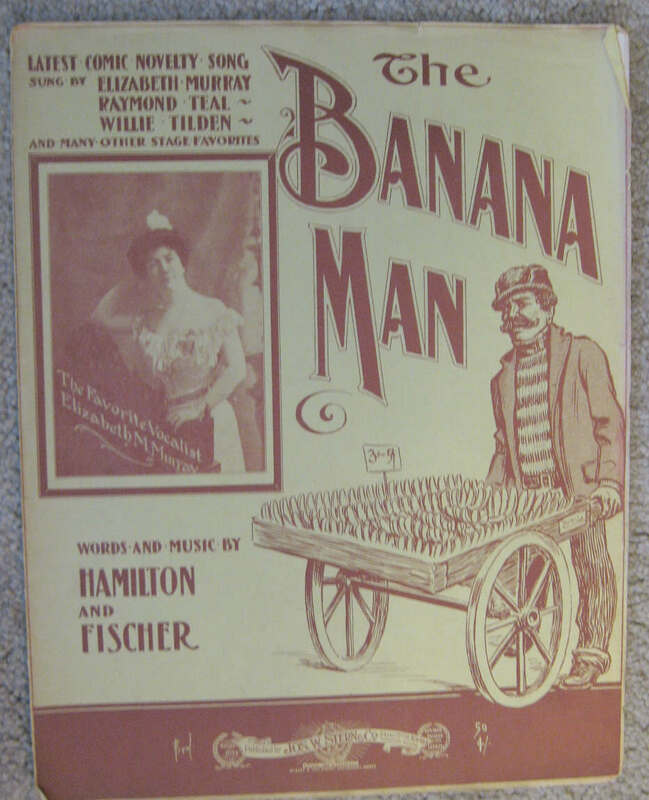 The Banana Man was sung by popular vaudeville star Elizabeth Murray, and also Raymond Teal and Willie Tilden. 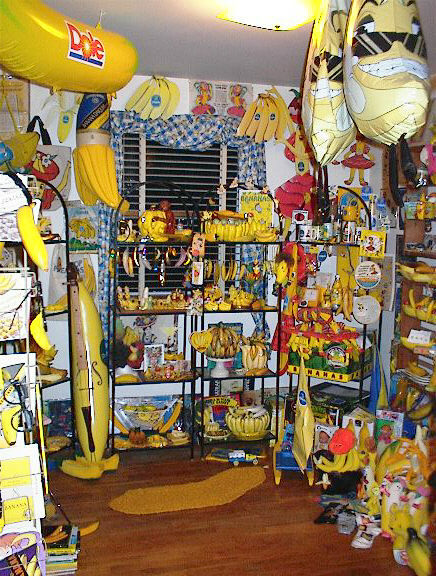 Bananaland in all its' glory. 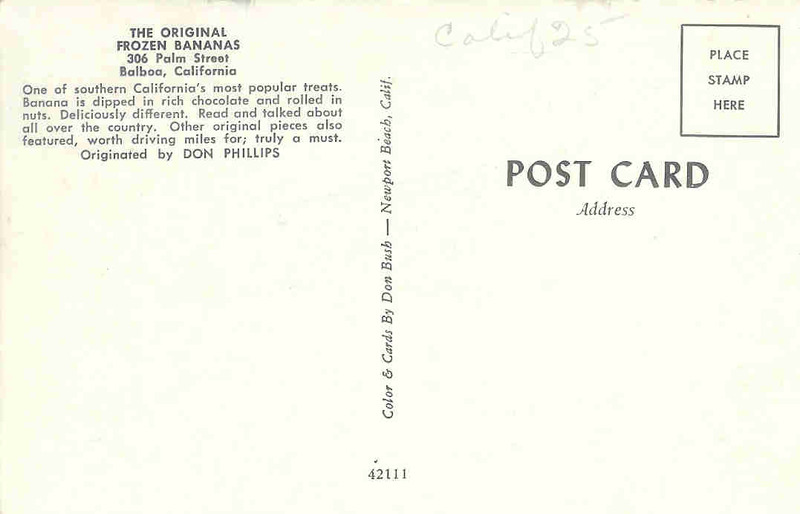 Postcard from "The Original Frozen Bananas" in Balboa, California. 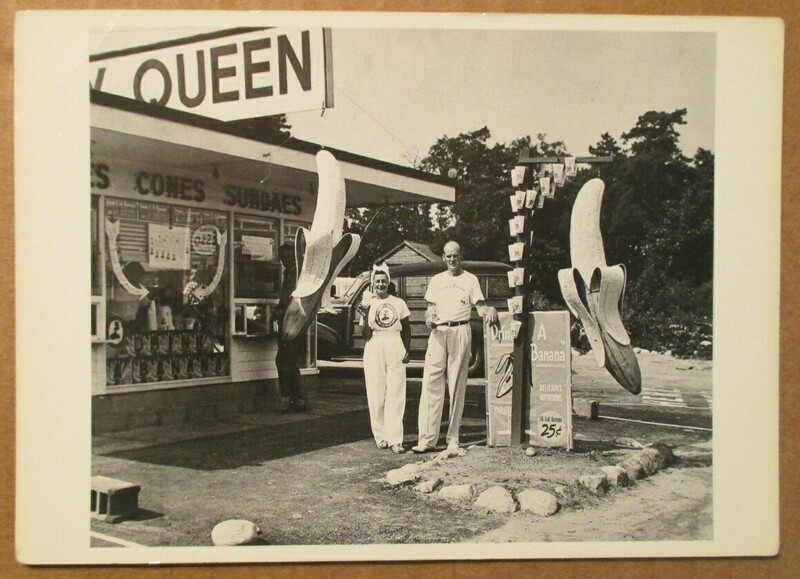 Don Phillips had the first successful frozen banana shop in the early 1940s. 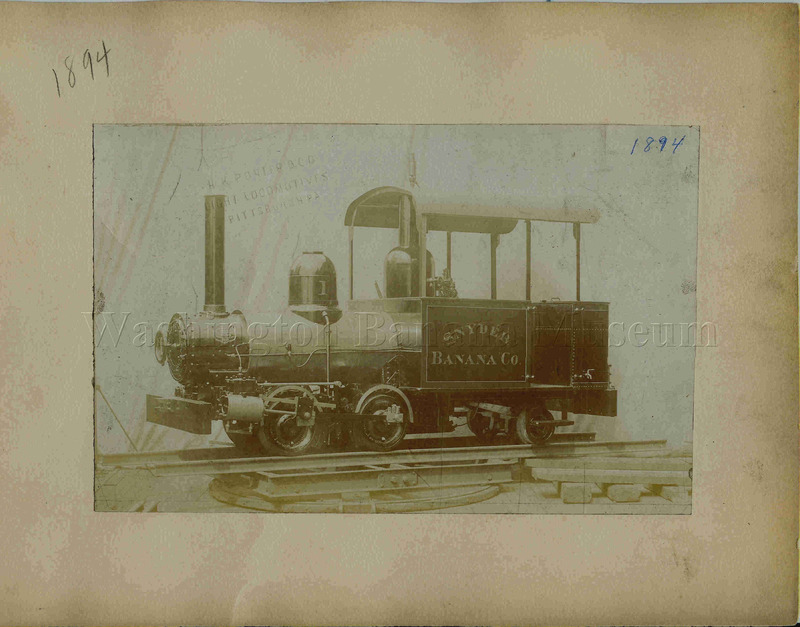 Small locomotive built for the Snyder Banana Company. 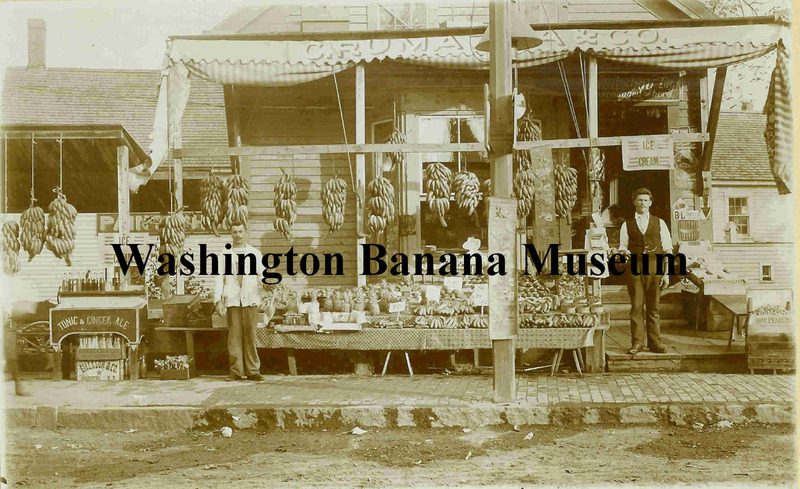 They were doing business in Panama between 1890 and 1899, then was bought (along with several other banana companies) and incorporated into The United Fruit Company in 1899. The locomotove was built by the H. K. Porter Company out of Pittsburgh. They built light-duty railroad locomotives starting in 1866. 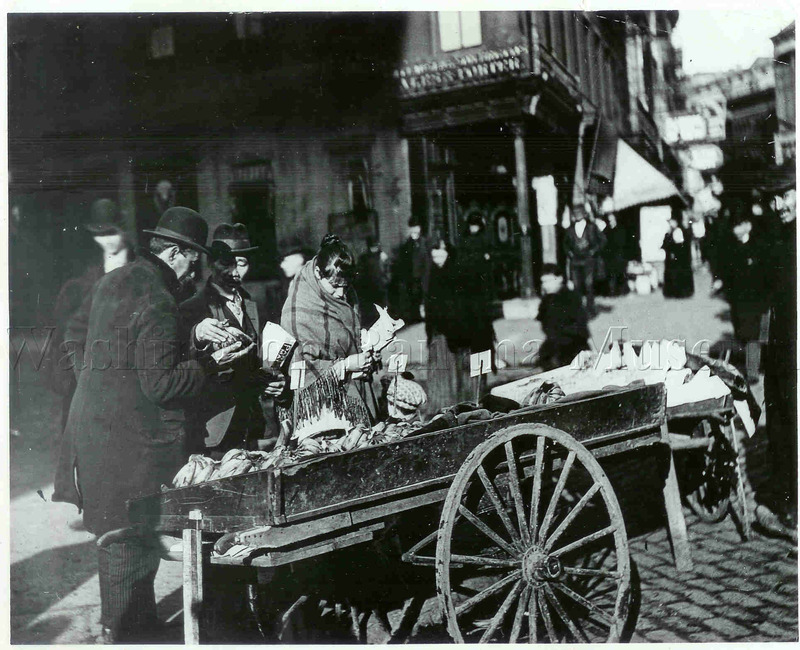 Banana cart in 1906 New York (reproduction). Street urchins selling bananas in the United Kingdom, early 1900s. 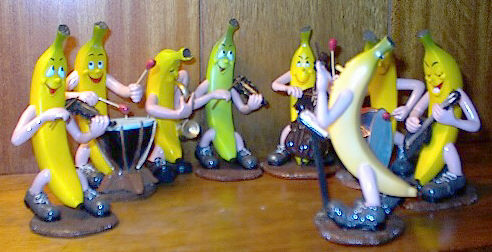 Rare Banana Band Sweet Music wood harmonica, c1925. A harmonica like this one was supposedly used in a Marx Brothers film. More later when I find out which film it was. Made by F. A. Rauner in Klingenthal, Germany. An early billhead from the Frank Brothers. 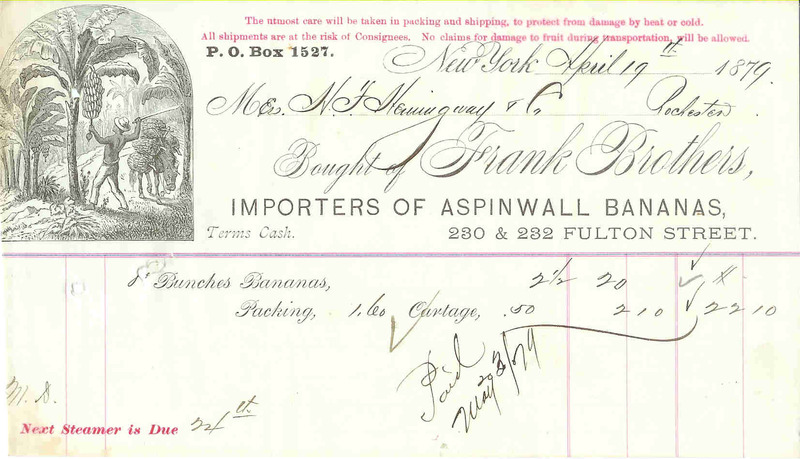 Carl Augustus Frank is widely thought to be the first banana importer. He set up his business with his brother Otto in New York in 1867. The transaction presented here was twelve years after they started their import company. 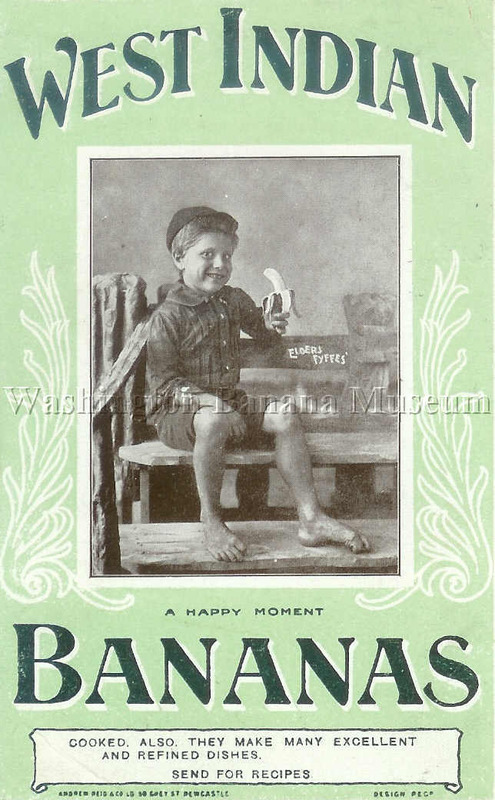 Dozens of other banana importers, along with the Frank Brothers, would be bought out when The United Fruit Company (now Chiquita Brands) was formed in 1899. 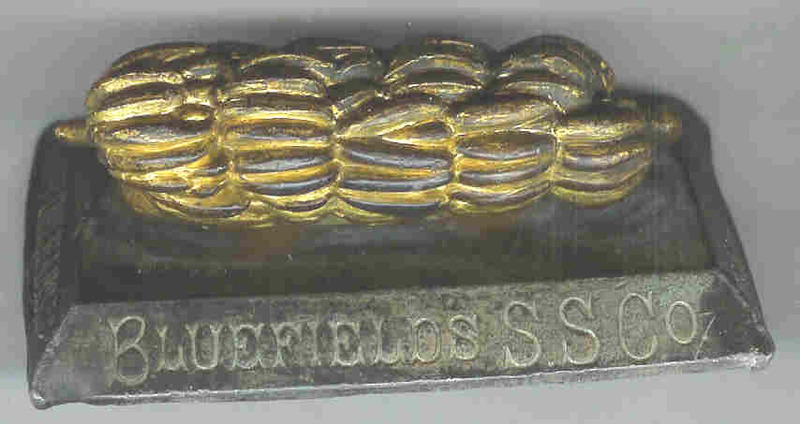 Paperweight from the Bluefields Steamship Company, based in New Orleans. 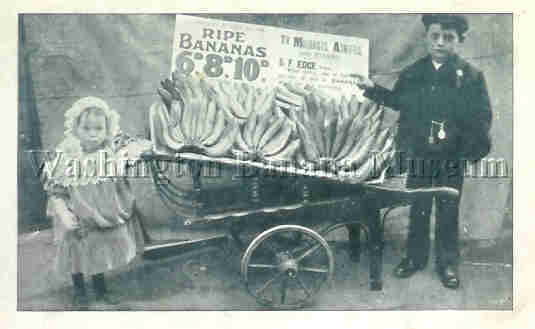 This was another banana importer bought out by United Fruit in 1899. 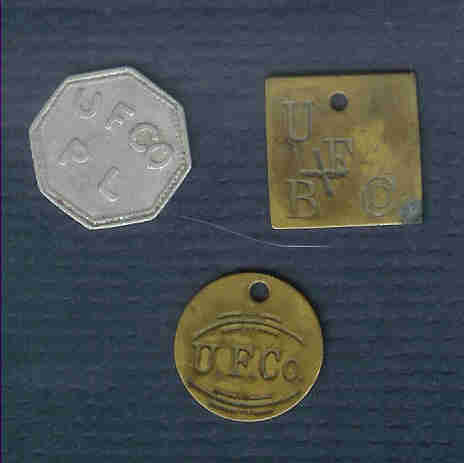 Three tokens from United Fruit Company stores, circa 1900. The silver one, I believe, is from the Portland, Jamaica location. When I see these, I think of the blood, sweat and tears shed by the workers in the fields and the sacrifices they made. Years later, when workers sprayed fields with various poisonous insecticides they suffered the health consequences. 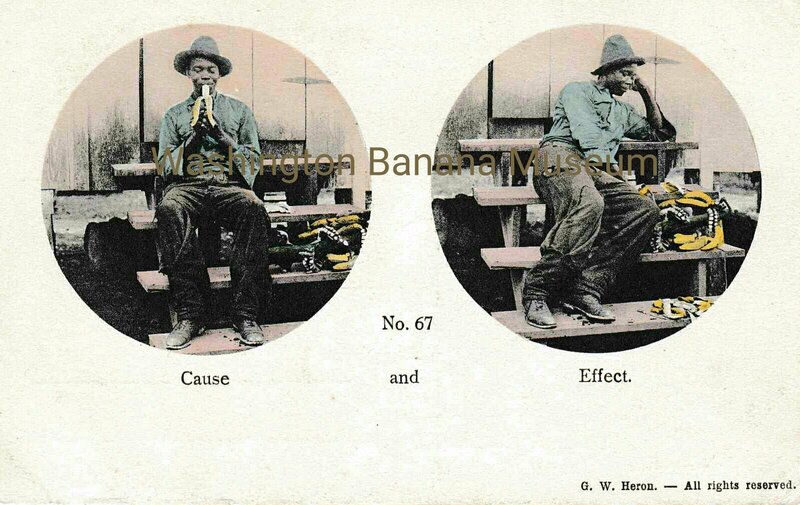 Taking a banana break while cruising the highways of the U.S. Both taken during the 1920s. 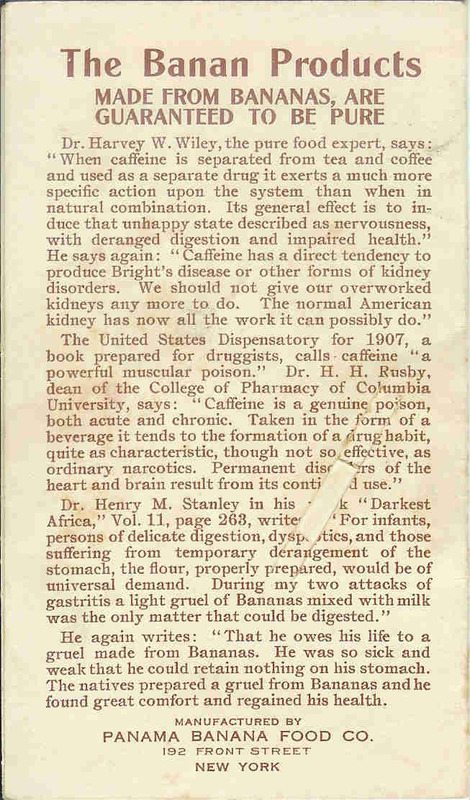 From the September 1917 issue of Fruit Dispatch, this photo was submitted by Hafer & Bro. 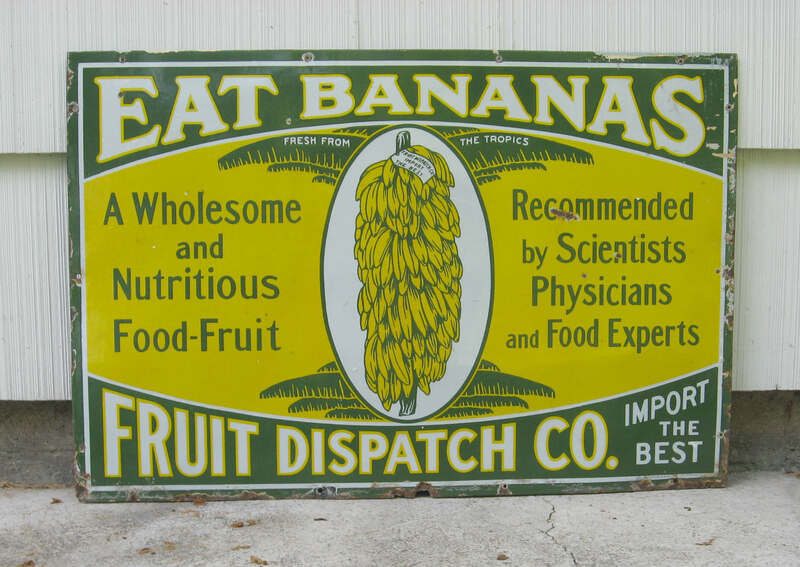 in Reading, Pennsylania, along with a glowing letter stating their exclusive banana-buying business with Fruit Dispatch. 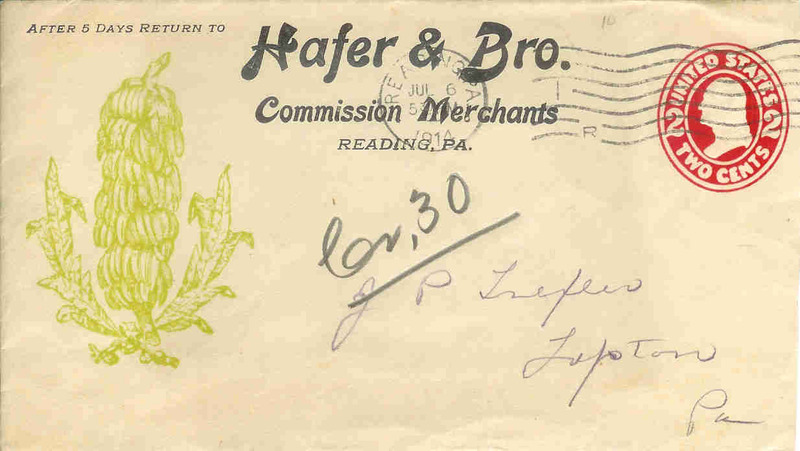 Also shown is this envelope from Hafer & Bro with a July 6, 1914 postmark. 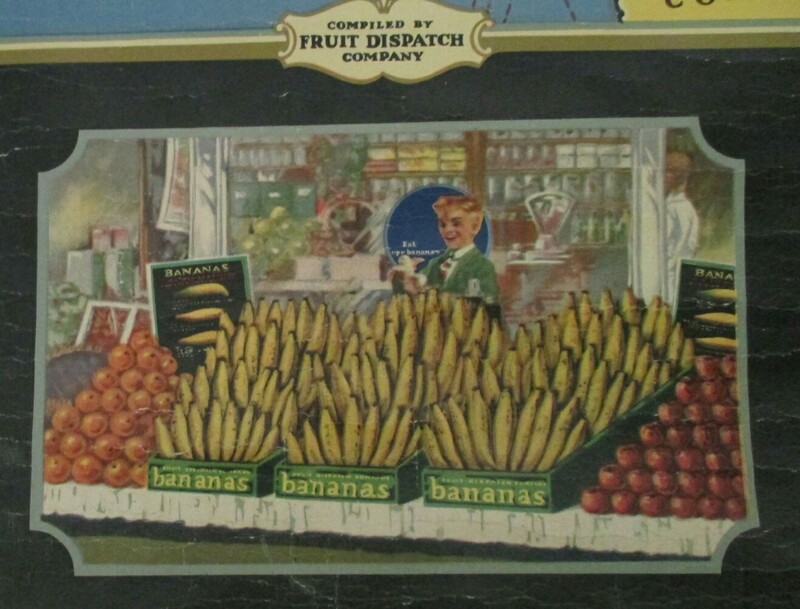 The early Fruit Dispatch magazines (published monthly) were filled with photos from various fruit vendors showing their creativity in banana displays. Two birthday postcards, published in London. The first was published by Wildt & Kray. The second was published by E. A. Schwerdtfler & Co. and was postmarked 1913. 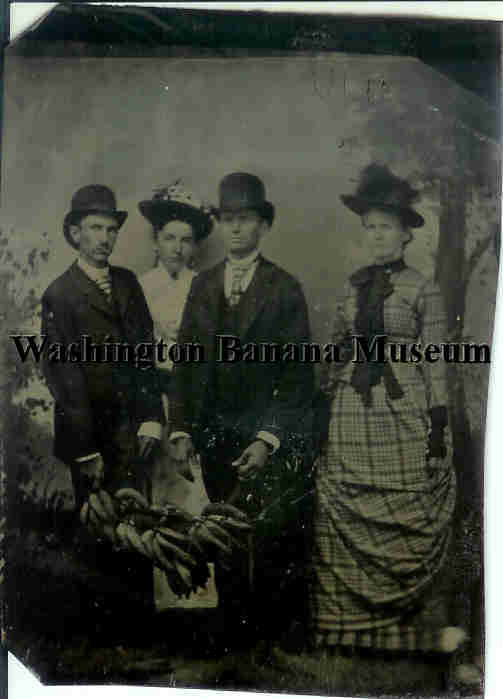 Tintype showing some mighty serious folks displaying their banana bunch. 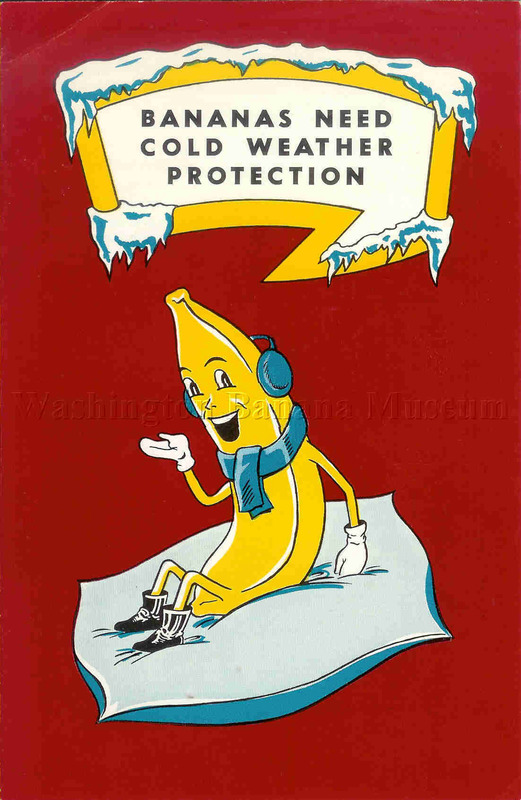 Cover and inside pages of 1958 booklet explaining the benefits of cold weather protection for bananas. 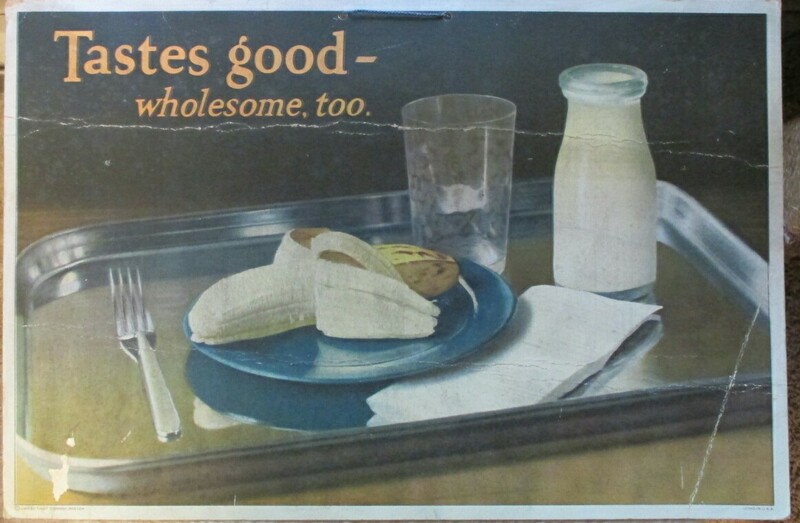 Made for grocers, it was published by Fruit Dispatch Company, a subsidiary of United Fruit. Turn of the (last) century boy with a fine bunch. 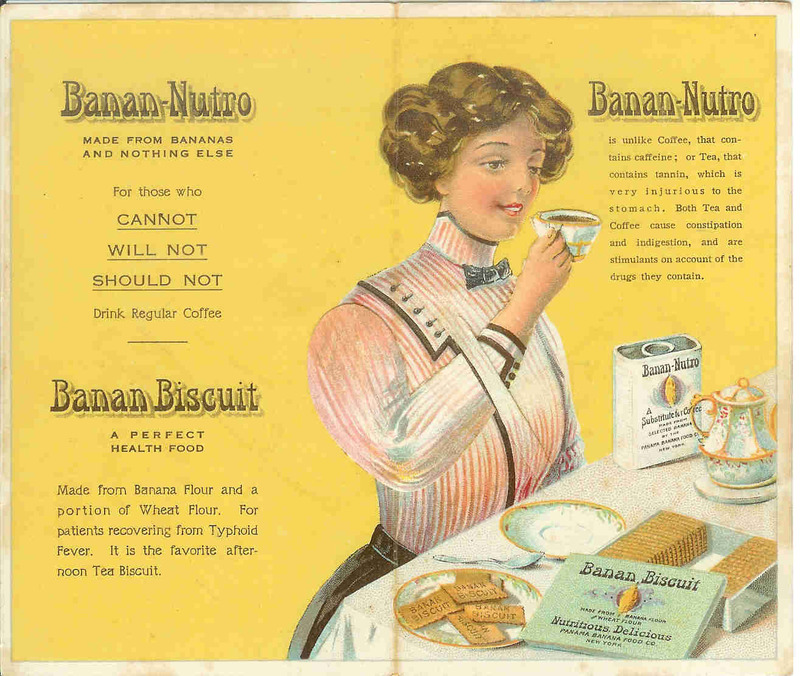 Mechanical trade card advertising the health benefits of Banan-Nutro, a coffee substitute made from bananas, c1910. 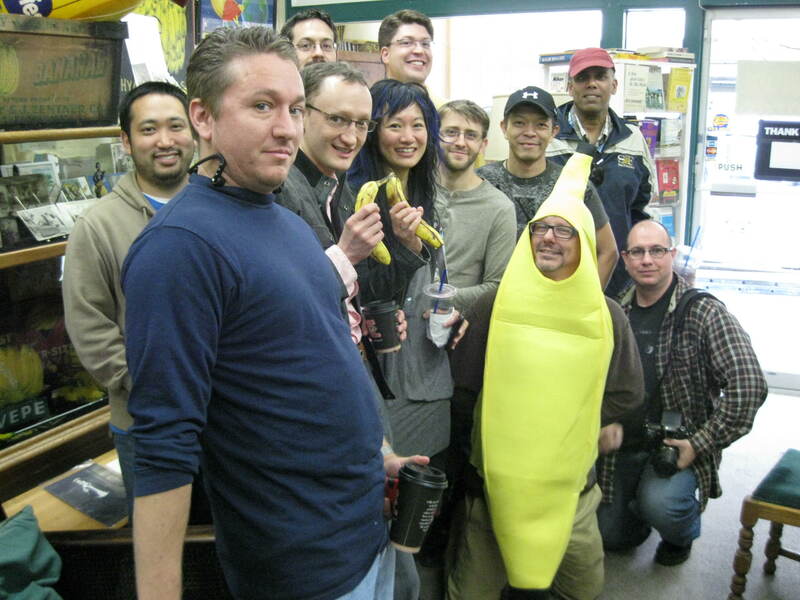 Recent visitors to the Washington Banana Museum. We encourage entourage invasions! 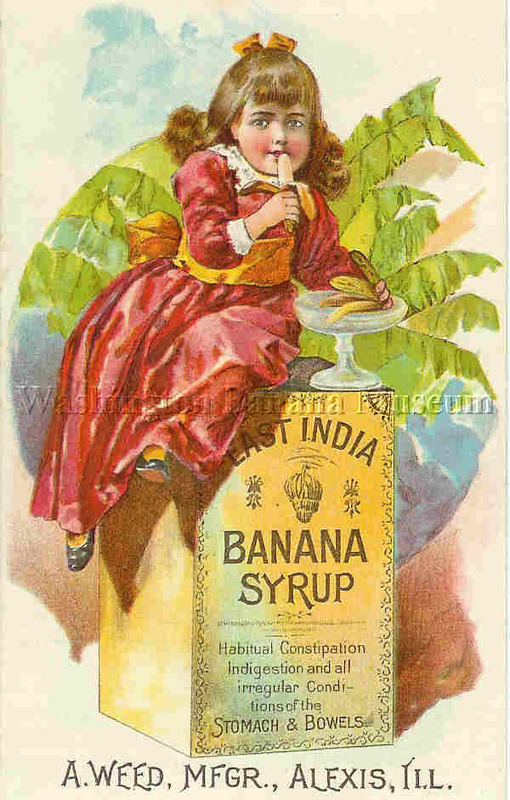 Victorian trade card for East India Banana Syrup. Another trade card from the same era. 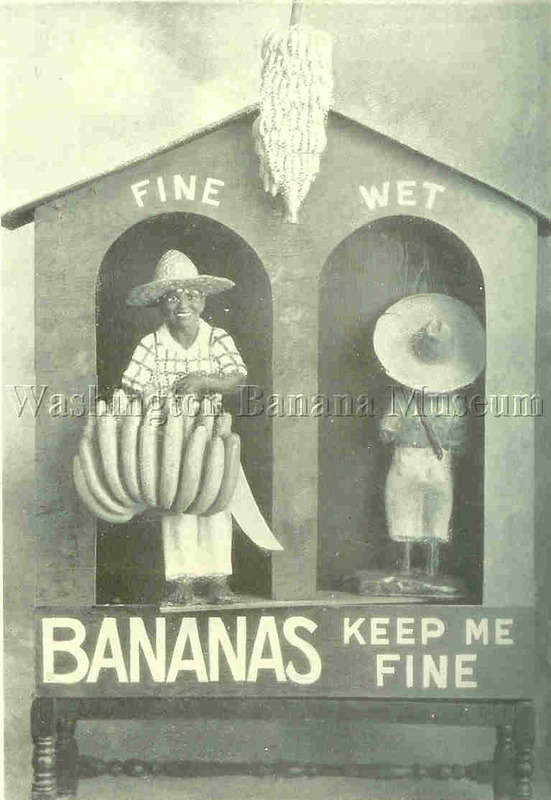 Two examples of banana marketing from the United Kingdom during the late 1920s. The first showcases a centerpiece for a window display while the second spotlights a permanent display in a British fruit shop. 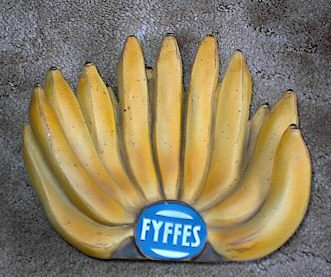 Elders & Fyffes (now called Fyffes) was their principle importer. 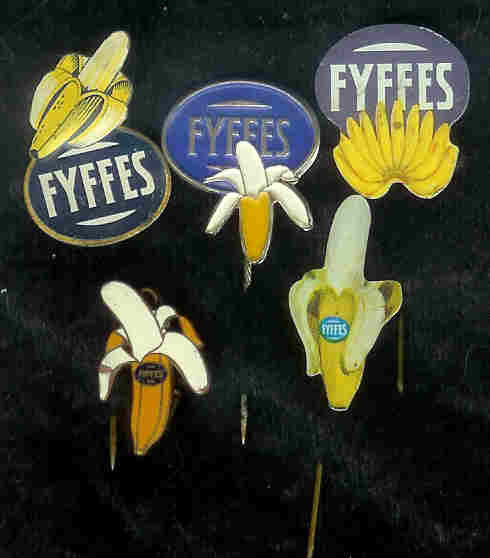 Fyffes lapel pins and a paper mache banana bunch much like the ones used in the photograph above (right). 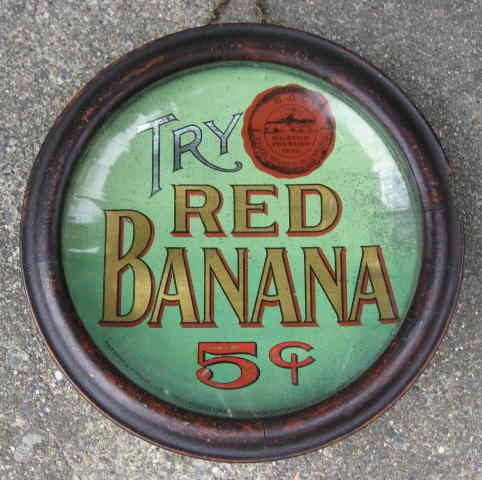 Red banana syrup advertising tin from Beach & Clarridge Company, Boston, c. 1890s. 7" with wood frame, glass front and chain hanger. Beach & Clarridge were manufacturers and dealers in soda water flavors for the popular soda fountains of the day. Sign made by Kaufmann & Strauss Co., New York. 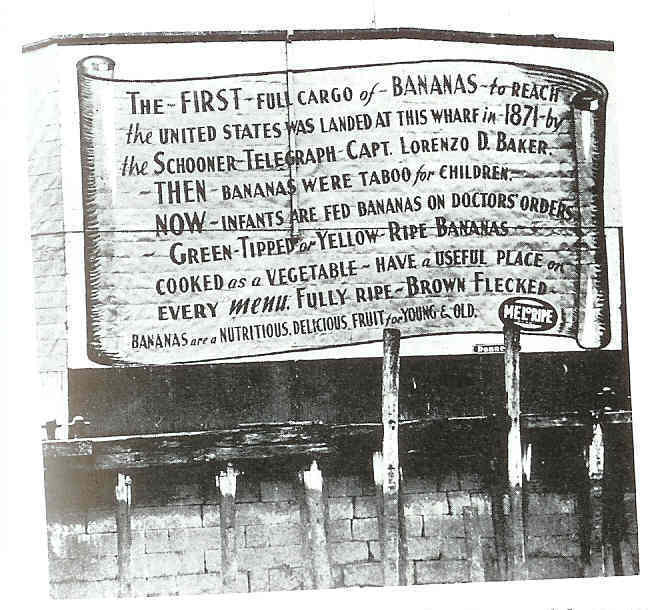 This sign commemorates the first full cargo of bananas to arrive in Boston at the Long Wharf in 1871. The sign reads, "The first full cargo of bananas to reach the United States was landed at this wharf in 1871 by The Schooner Telegraph - Capt. 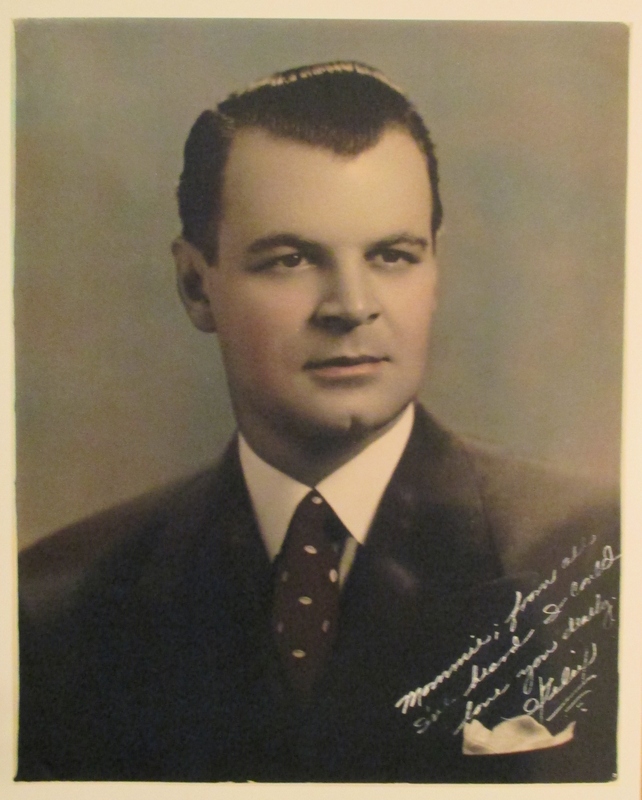 Lorenzo D. Baker. 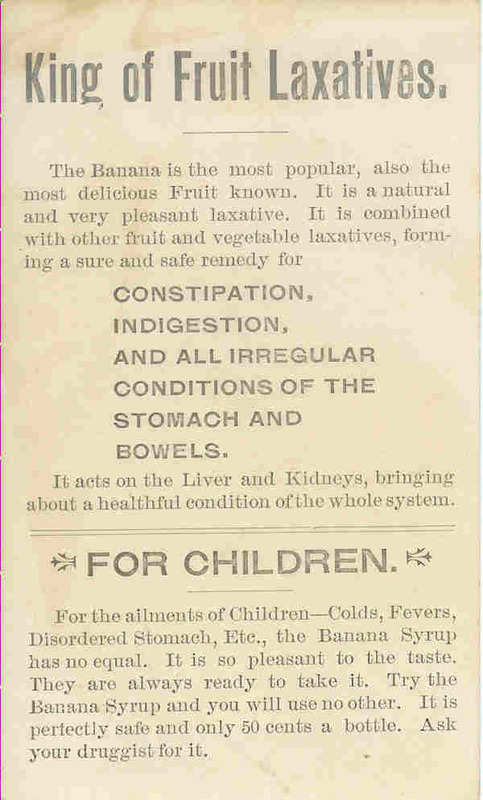 THEN bananas were taboo for children NOW infants are fed bananas on doctors' orders Green tipped or yellow-ripe bananas cooked as a vegetable have a useful place on every menu. Brown-flecked bananas are a nutritious delicious fruit for young and old." Can anyone in Boston tell me whether the sign is still there? 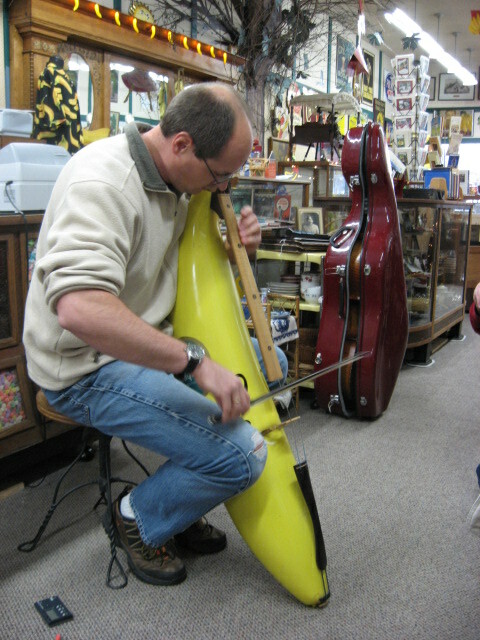 The banana cello being played by Brian Wharton, cellist for The Auburn Symphony. Thanks for restringing it, Brian! A 1924 Moore System Ventilation Banana Room Thermometer, measuring about 5x11 inches, and two later Chiquita thermometers. 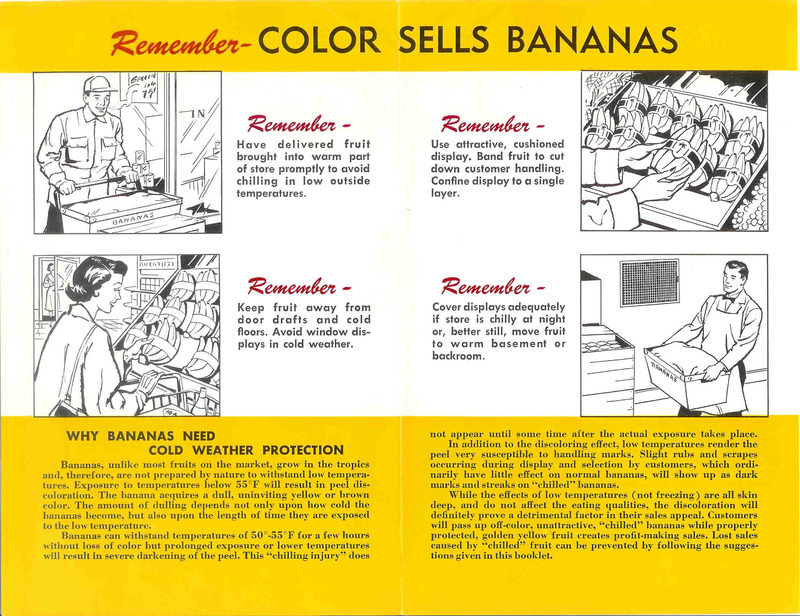 "In rooms properly built and equipped, bananas are ripened most successfully at temperatures ranging from 62 to 66 degrees, provided the relative humidity of the surrounding air is maintained at approximately 85 per cent until the fruit is well on the 'turn.' 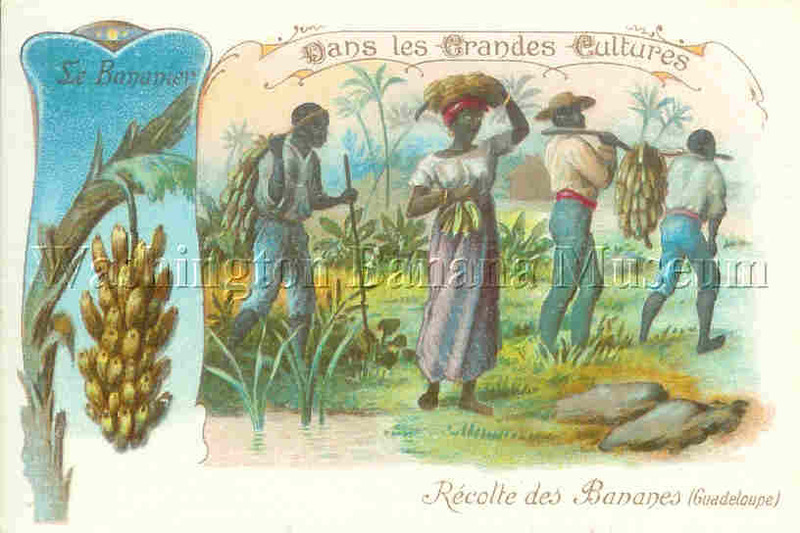 ----from "The Banana; It's History, Cultivation and Place Among Staple Foods," by Philip Keep Reynolds. Boston : Houghton Mifflin Company, 1927. Meloripe Bananas wood shipping crate from Boston. 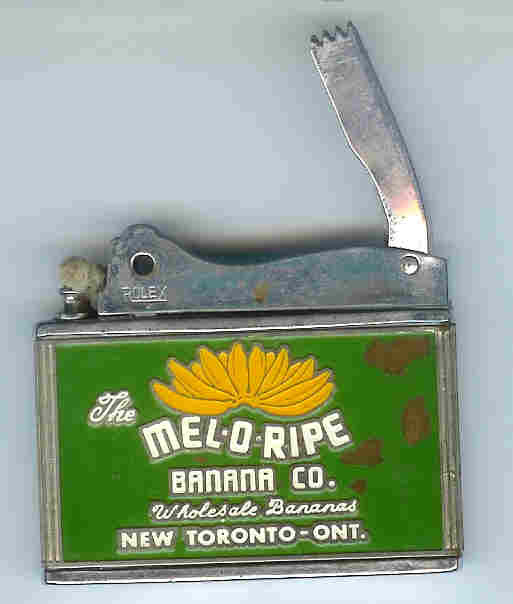 Meloripe Bananas box and lighter. The company was based in New Toronto, Ontario. 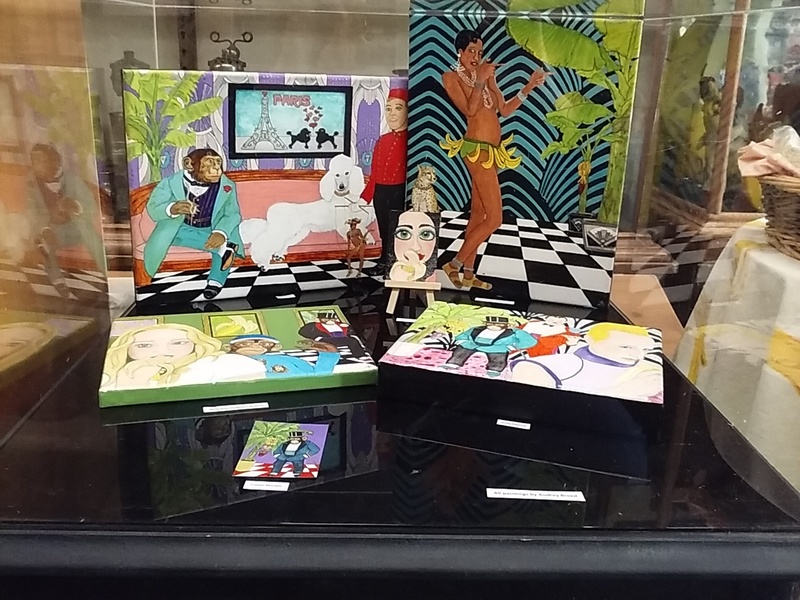 Josephine Baker art deco bakelite, wood and aluminum card holder from the 1920s, and a photo of her wearing the famous banana skirt in the Folies Bergere, Paris 1926. 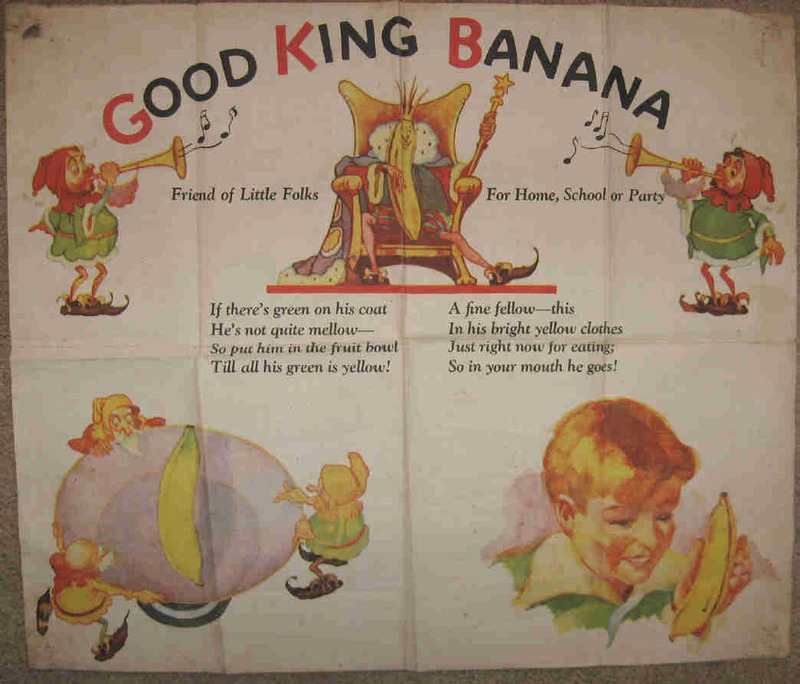 Good King Banana - a cloth children's game obtained free by mail from The Fruit Dispatch Company in the 1930s. "Lots of fun for home, school or parties." 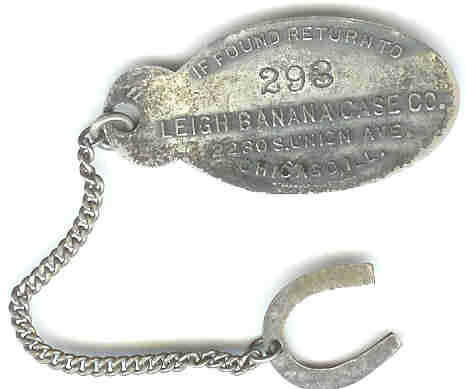 Eat Bananas Token, 1923. 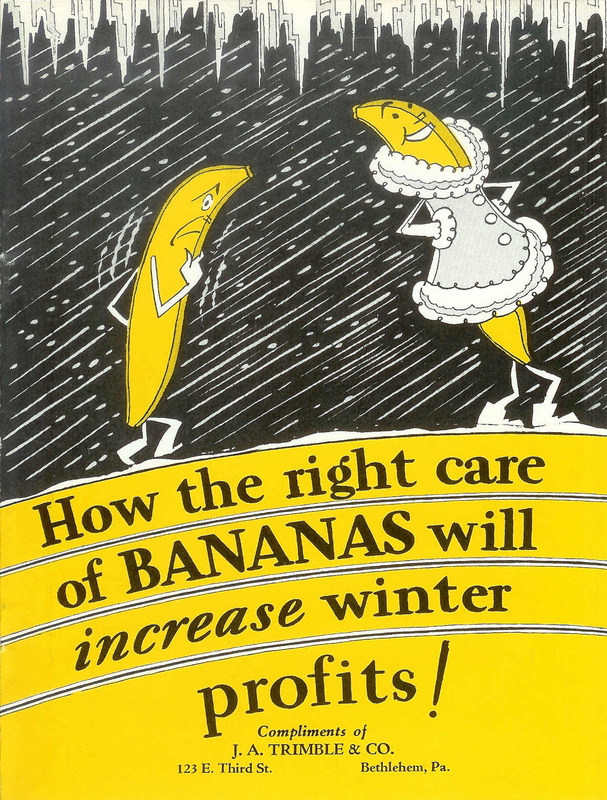 Issued by Elders and Fyffes in England for a promotional campaign. 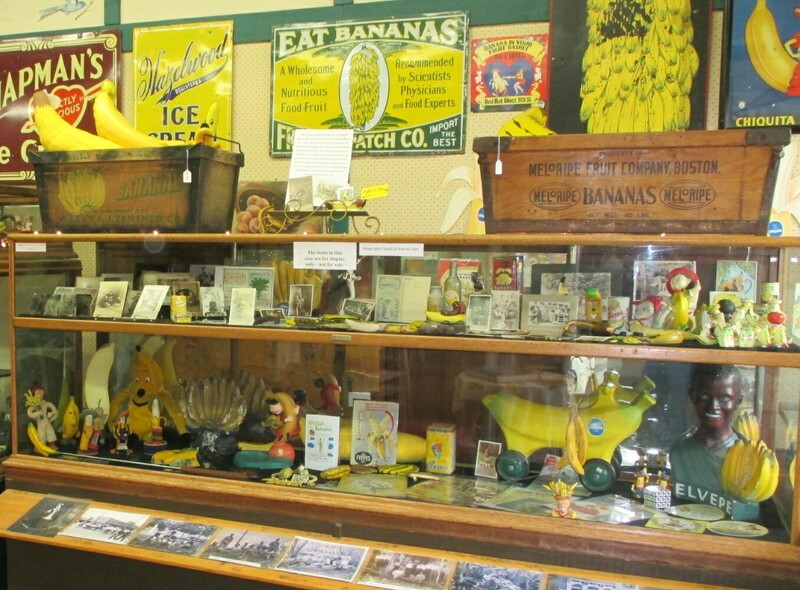 The Leigh Banana Case Company was founded in 1905 by Charles Q. C. Leigh near Ellenton, South Carolina. 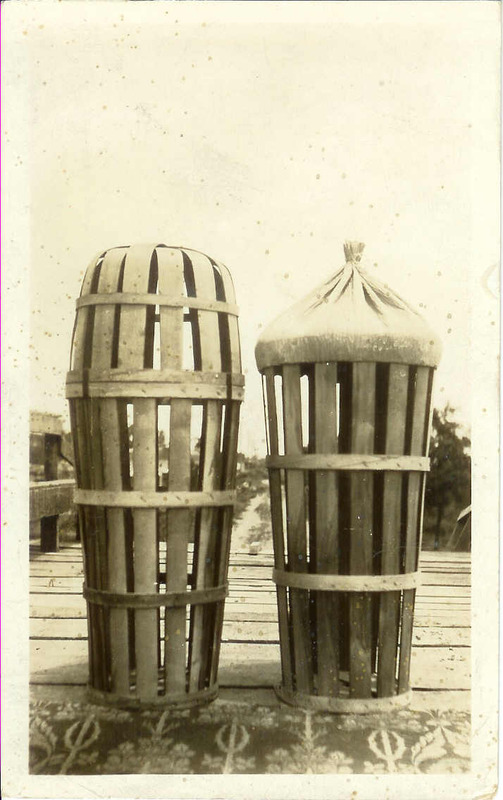 He patented a wood-veneer slatted crate which was built specifically to fit one banana bunch. 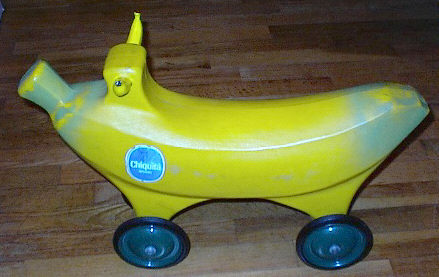 Sales of these banana cases started to decline in the 1930s and the company started producing containers for other kinds of fruits and vegetables. The company had 52 assembly plants in the U.S. and annually produced about 5 million containers. The town of Leigh was born when the company built housing for its employees. The Company was closed in 1952 when the Savannah River Plant of the Atomic Energy Commission took over the land. 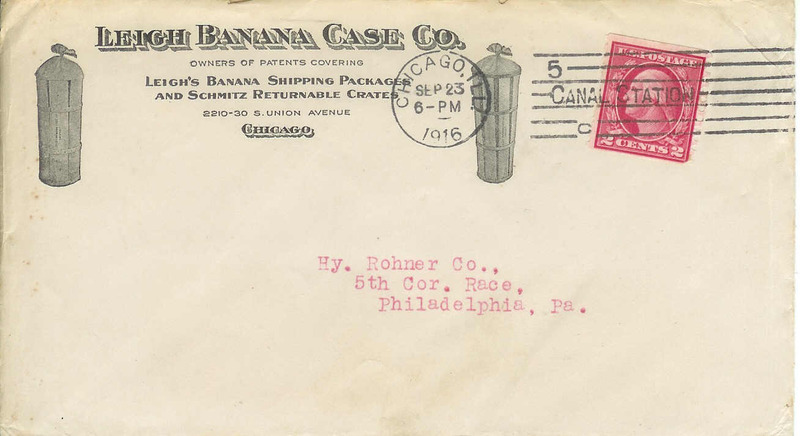 Below is an envelope from the company postmarked 1916 with an illustration of the case and a photo of two crates much like the Leigh Banana Case. 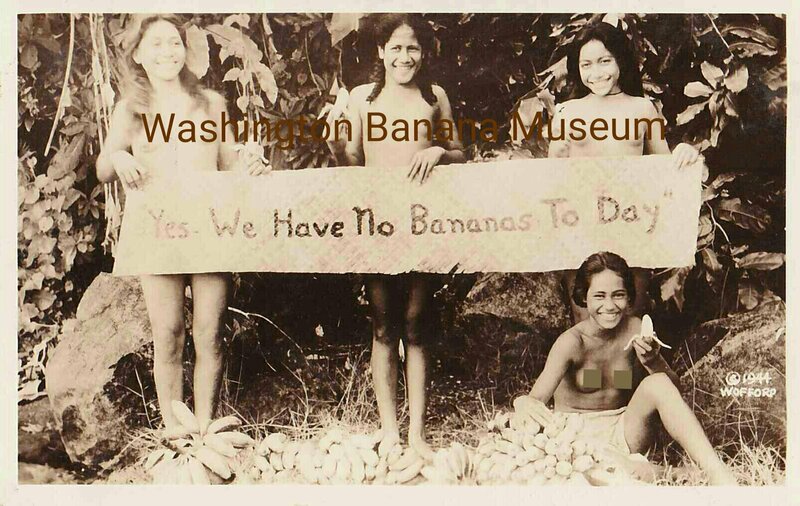 photo copyright Washington Banana Museum. 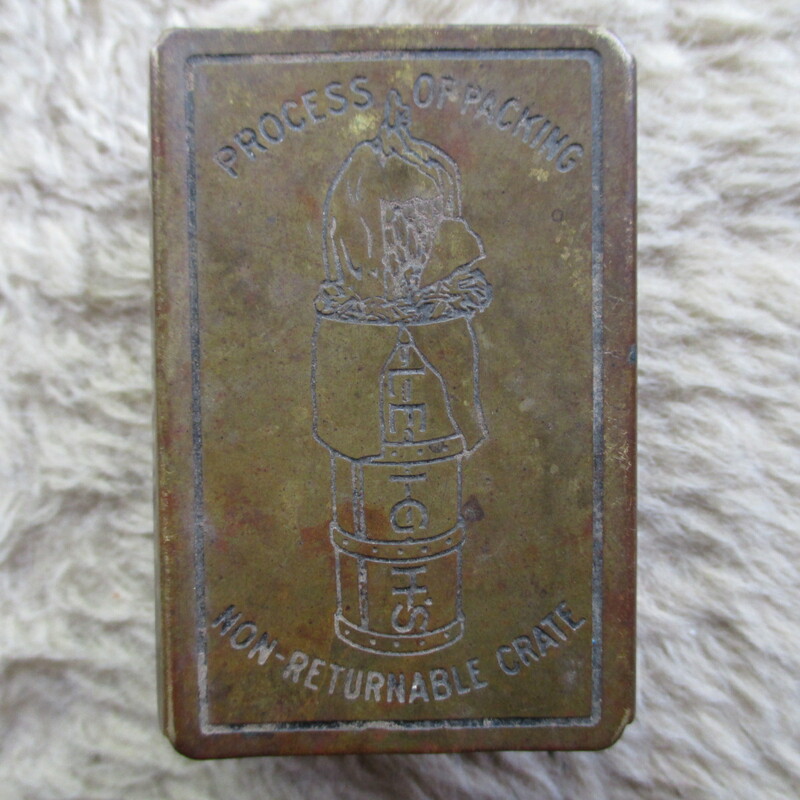 The company made tokens for its employees to use in the commissary. 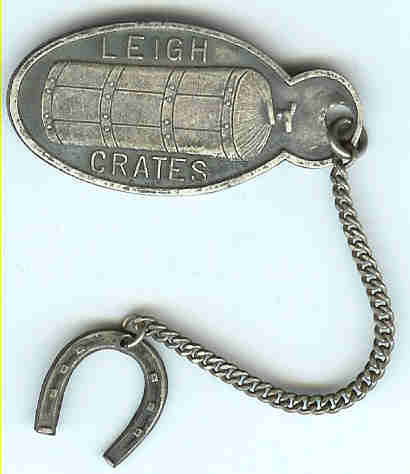 Leigh Banana Crate watch fob, ca 1930s. 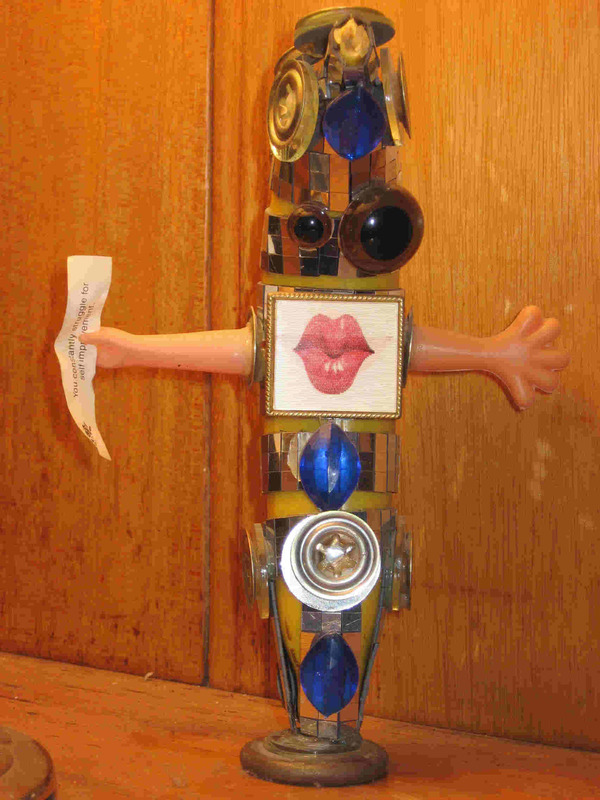 Seattle artist and all-around great person Cindy Small created this mixed-media piece especially for the museum. It takes a special place in the collection. The fortune says "You constantly struggle for self-improvement." 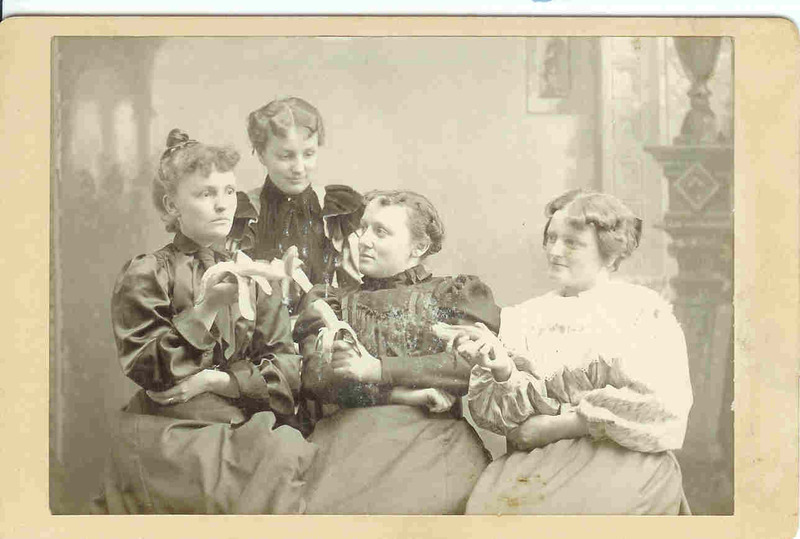 A Chicago theater troupe featuring Bertha West (2nd from right), a relative by marriage, of Betsy Ross, c1900 (photo courtesy of Randall Wells). Elvepe Bananas chalk display piece (Belgium). A reproduction from the 1980s, originally from the 1930s. 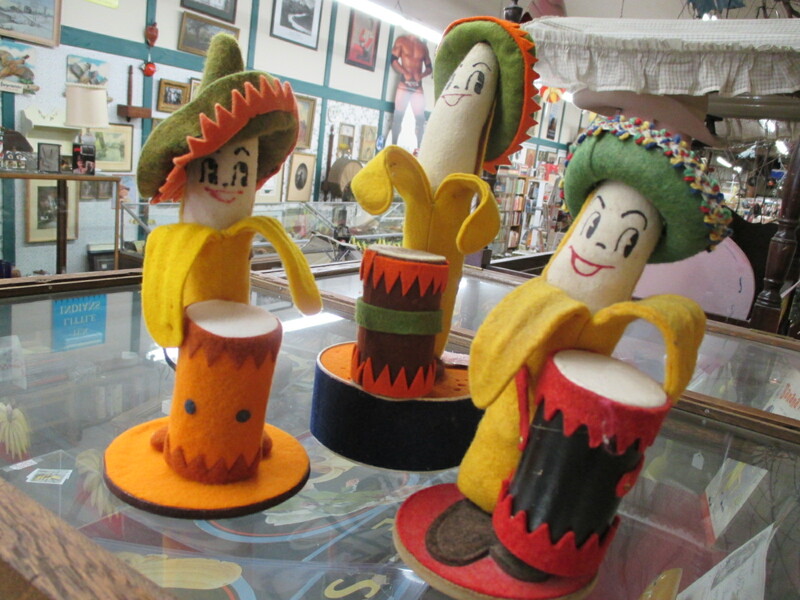 Fiberglass banana cello instrument, 4-feet tall, bought in Brimfield, MA. 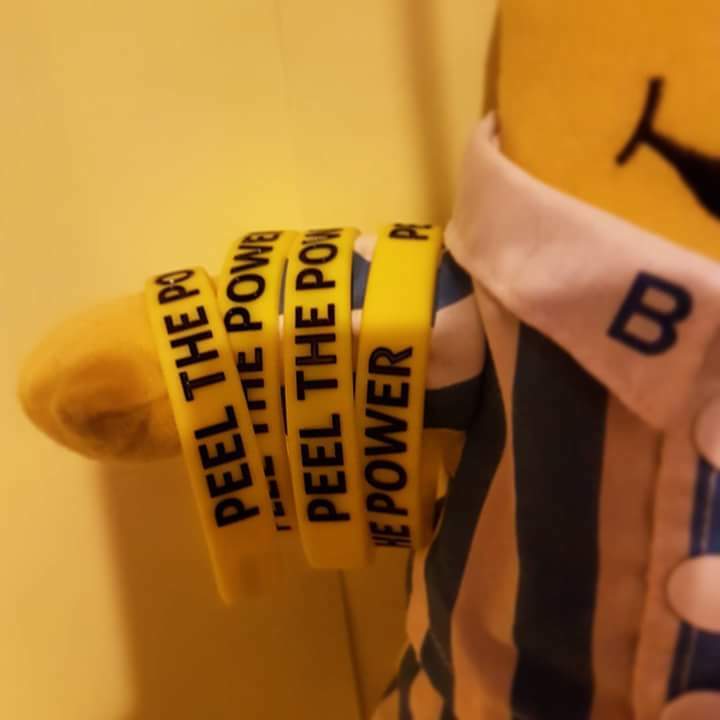 Also, a small banana band. 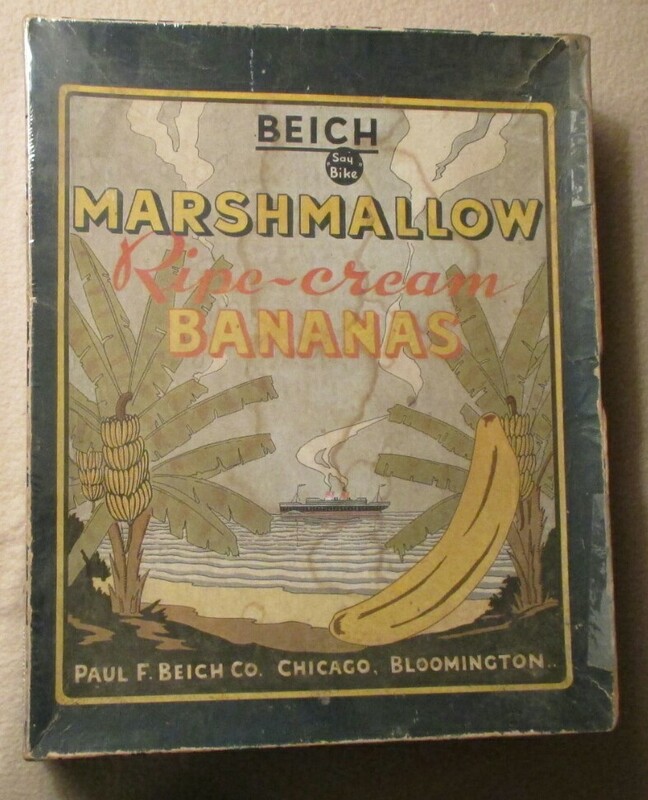 A vintage 1920s-1940s banana shipping box. See the complete bibliography here. Want to see the museum where these things are on display? Click on one of the thumbnails, sit back with a tasty banana, and wait for them to appear before your eyes. 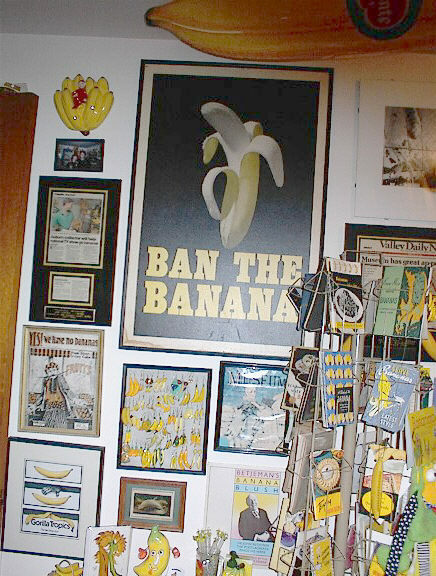 Mostly Chiquita "Ban the Banana"
I'm always on the lookout for cool banana items. If you have any tips or comments please e-mail me: bananamuseum1@hotmail.com Thanks!